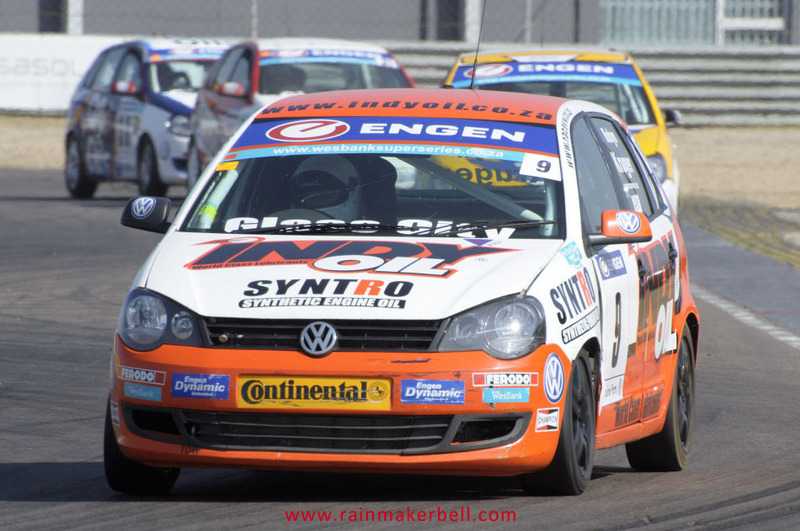 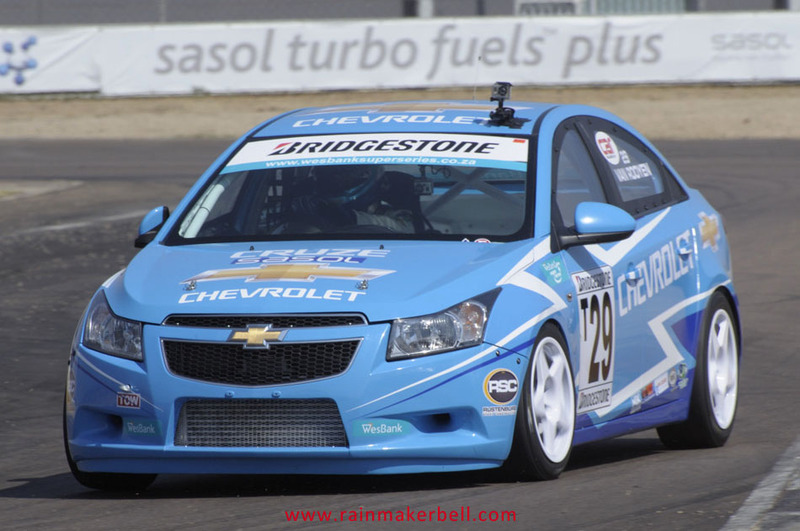 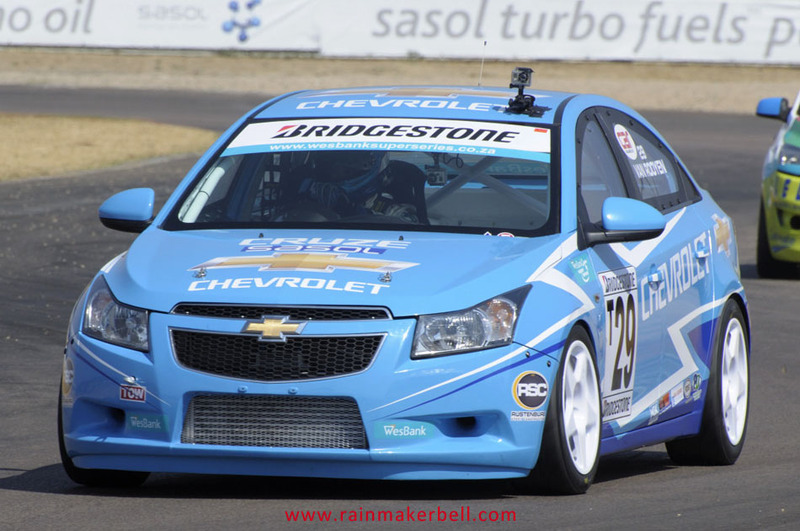 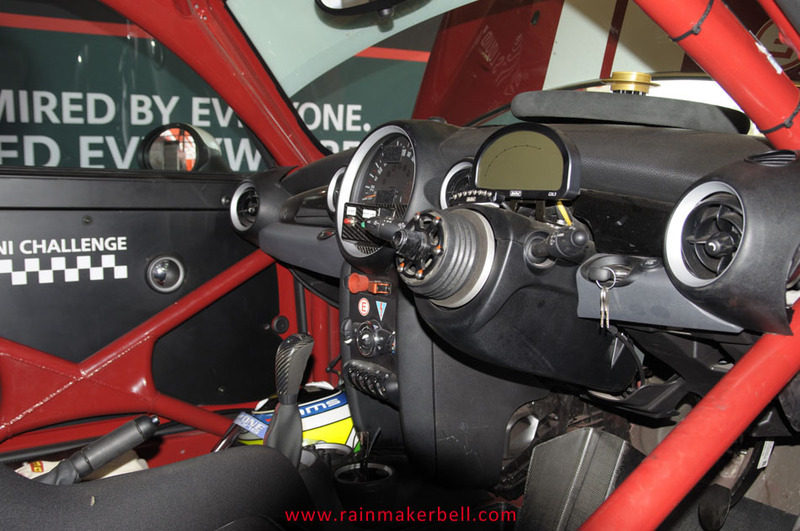 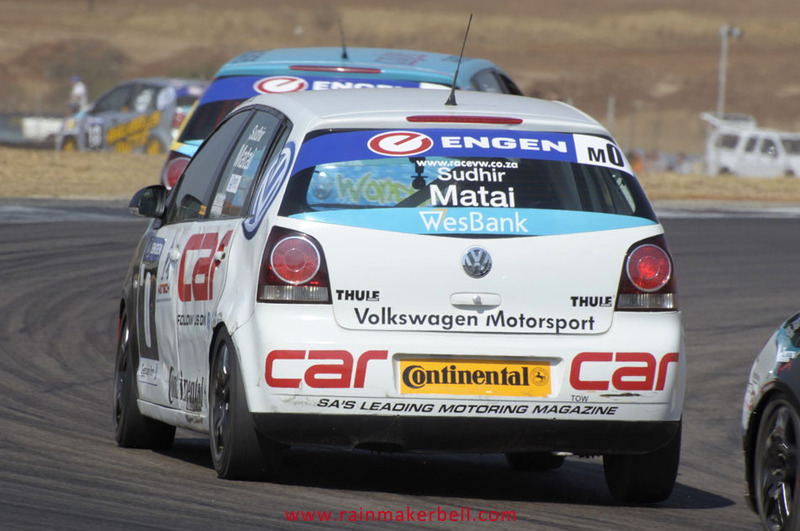 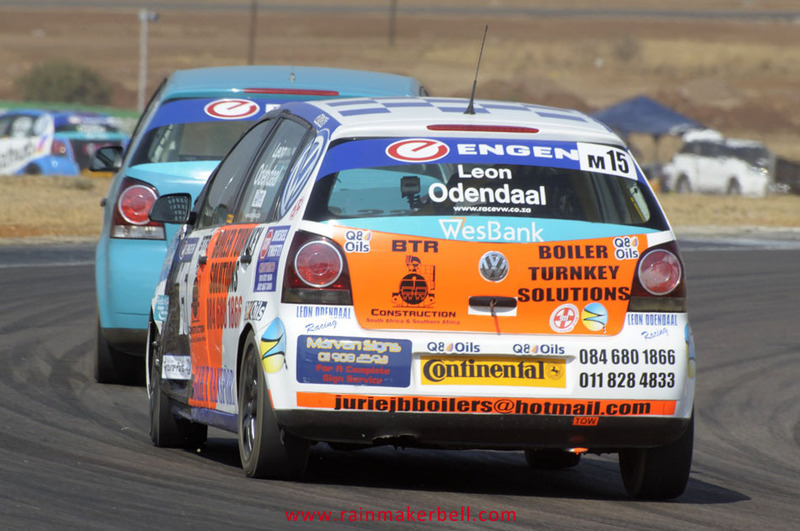 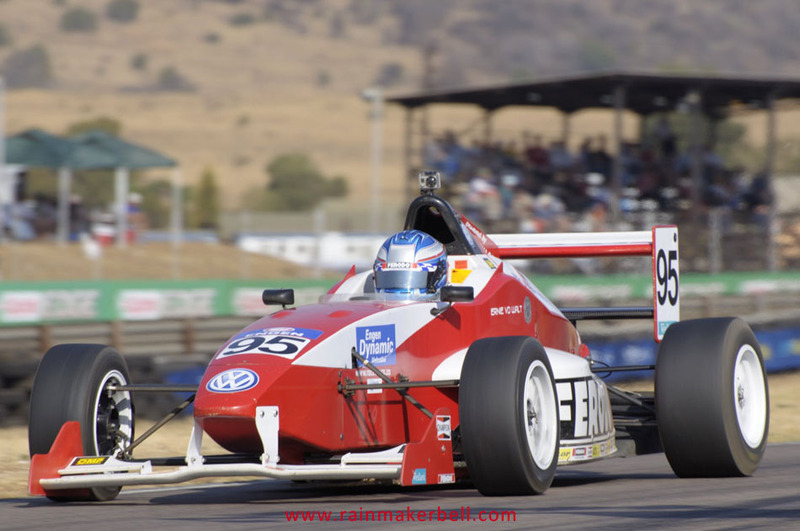 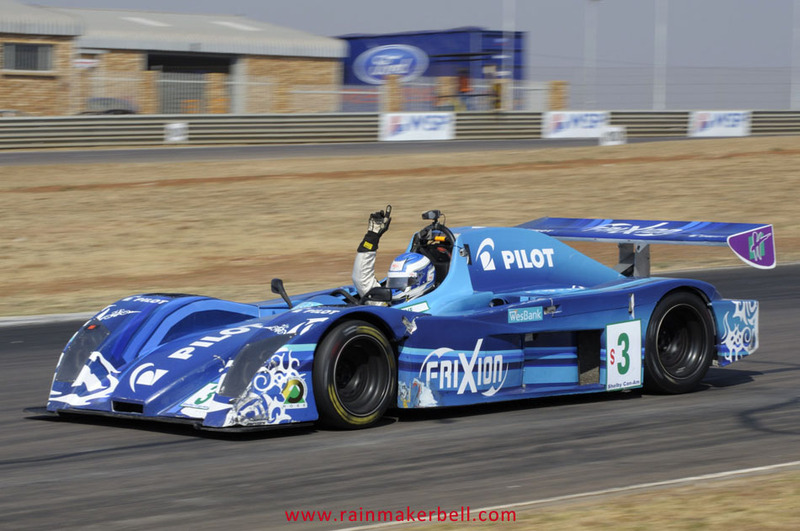 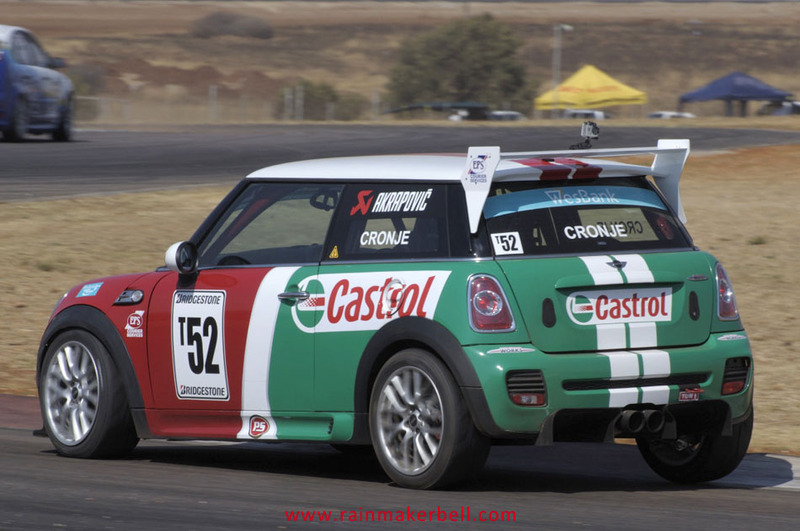 This might not be a good idea when you’re finding yourself in congested traffic en route to the Zwartkops Racetrack, but it might be a good idea when you are getting high (like an executive) next to the racetrack, while watching passing traffic on the R55. 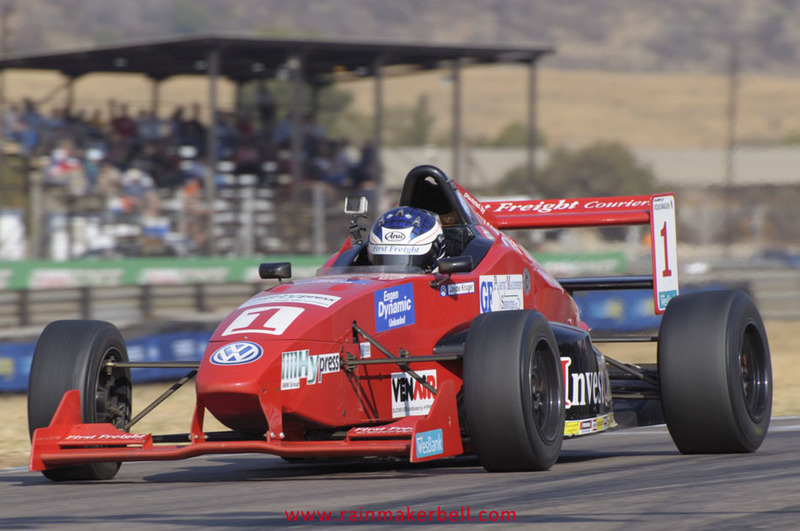 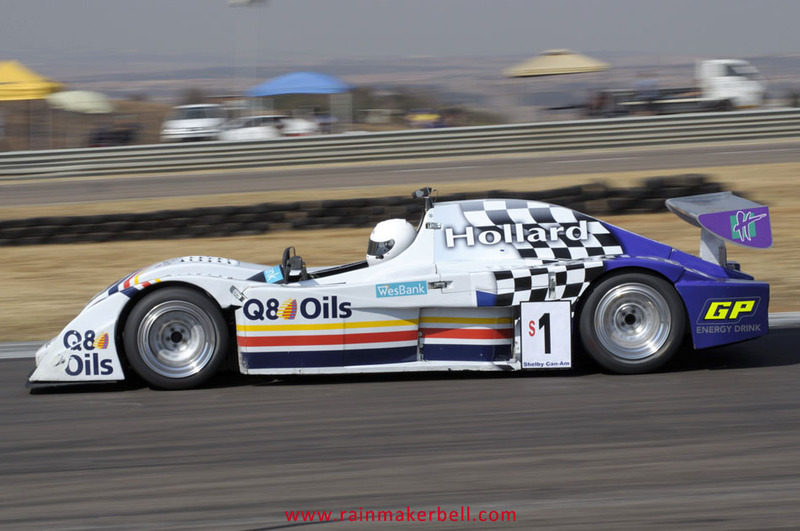 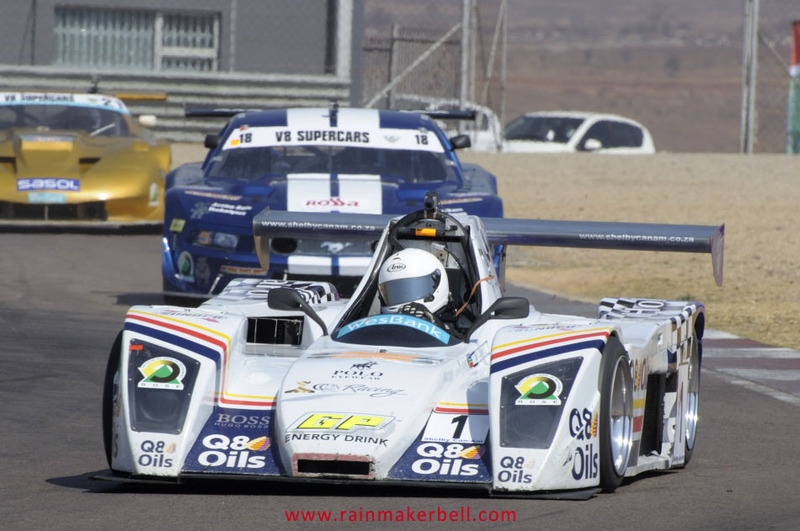 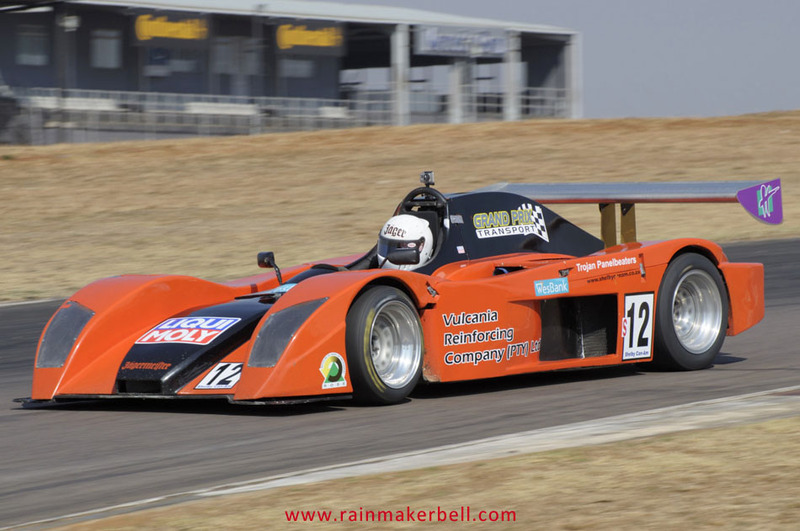 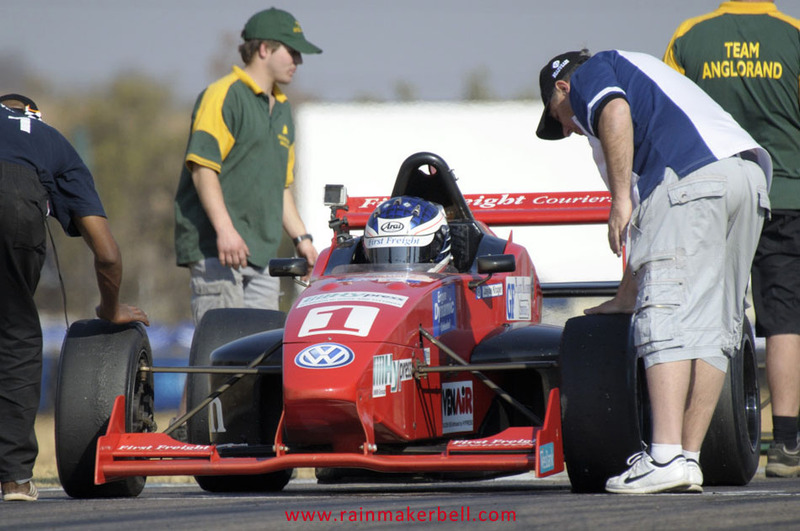 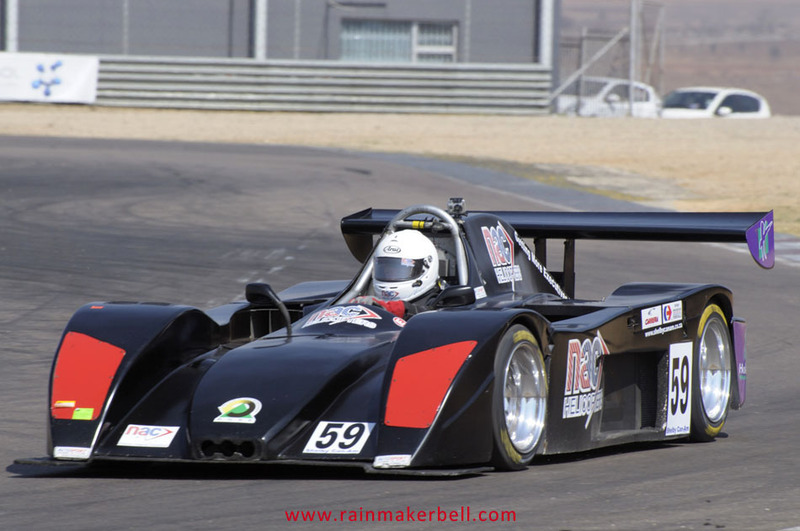 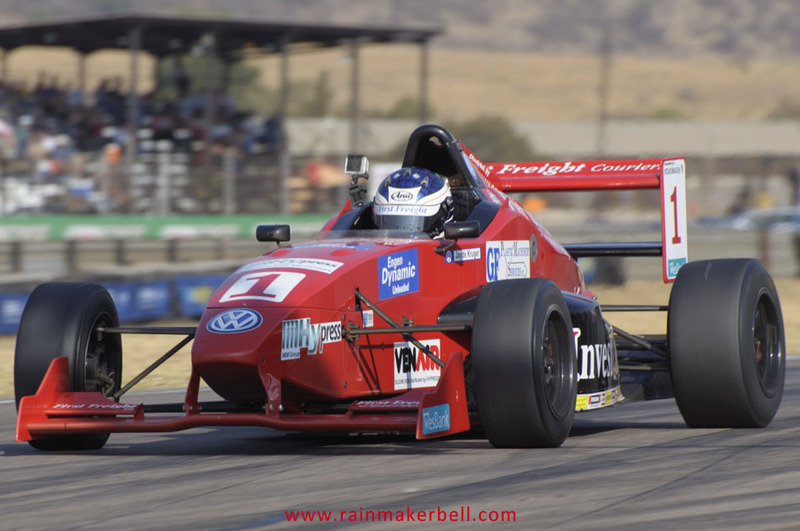 With my Saturday race programme in my back pocket, Nikon camera gear over my shoulder and one last *drag I were ready to face this wonderful race day Zwartkops had to offer. 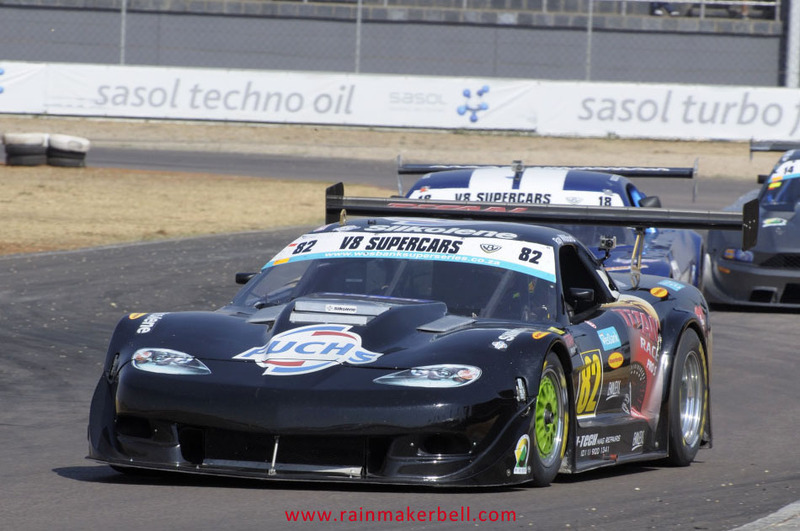 In the backdrop of the Zwartkops pit complex a mechanic was trying to murder a Wesbank V8 Supercar, on the opposite side the scoot jockeys (Superbikes and Supersport 600 classes) waited in anticipation (with butterflies) for their allotted warm-up/practice/timed and show downs in both races. 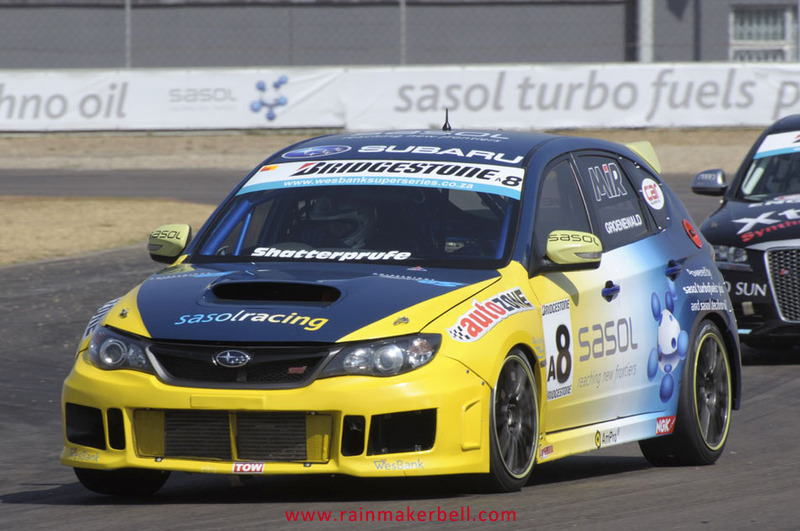 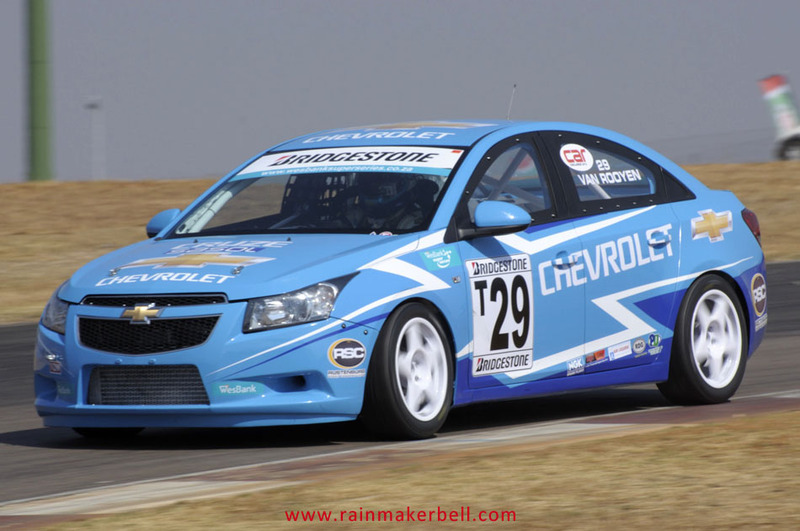 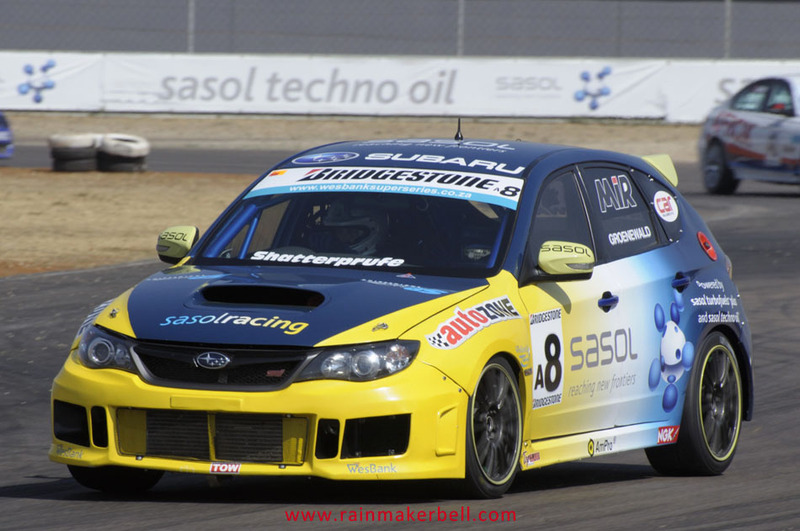 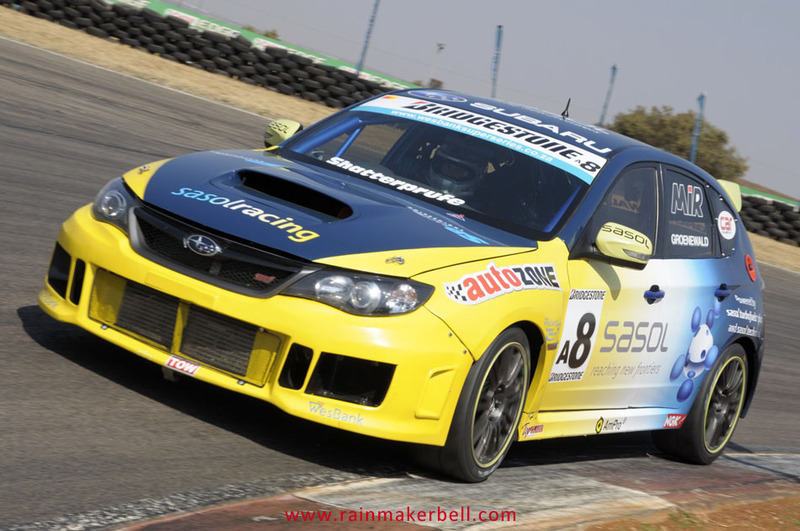 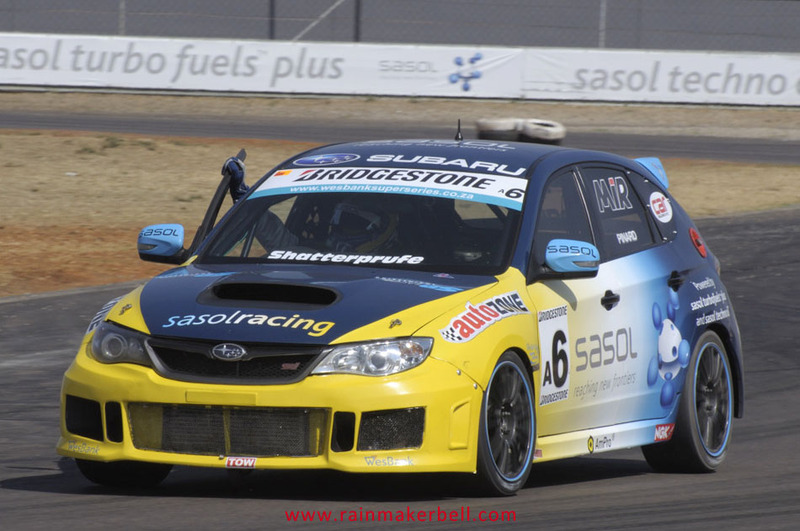 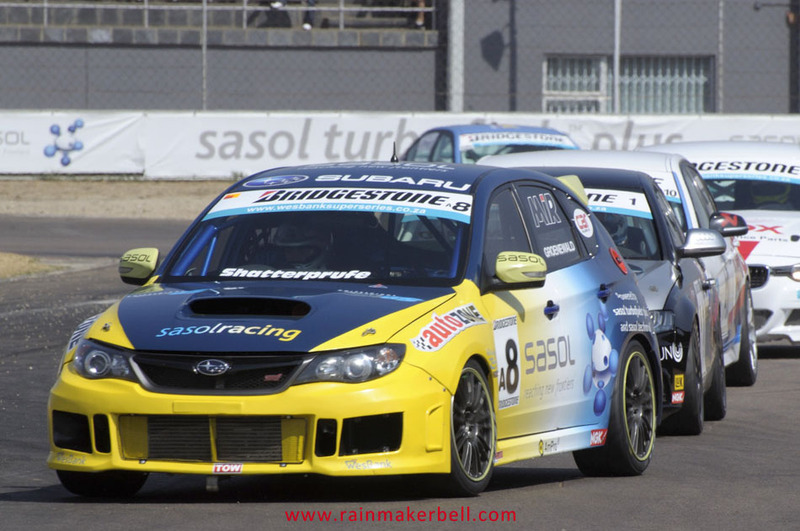 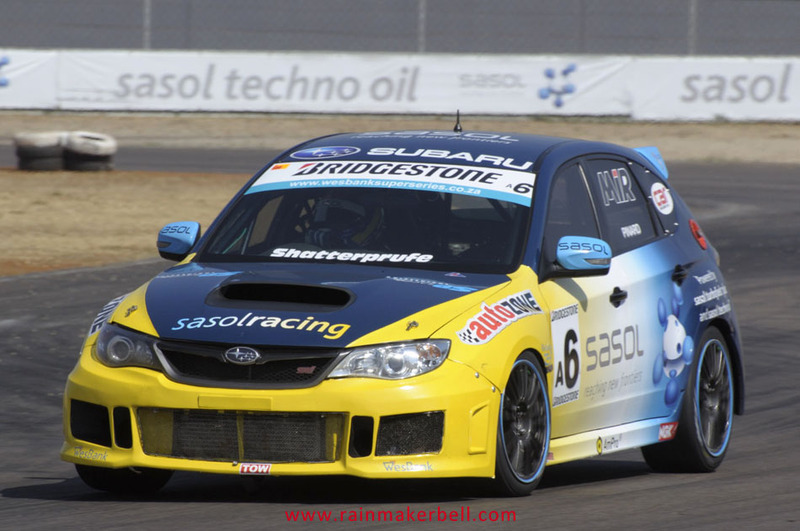 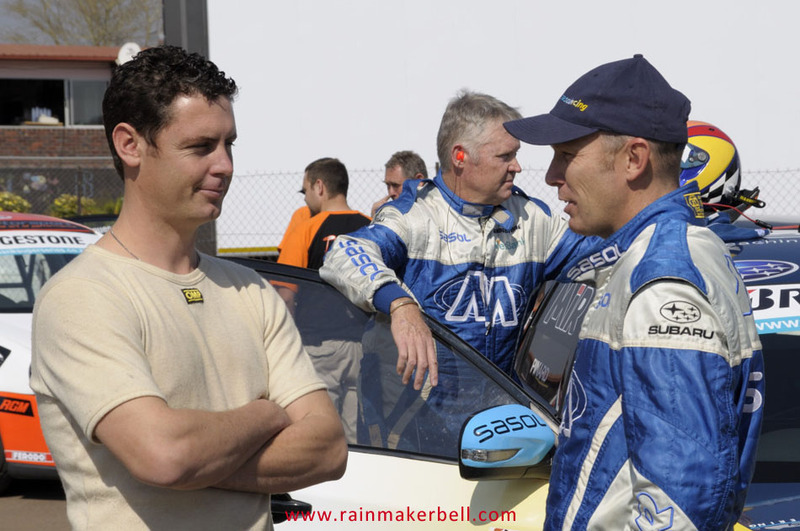 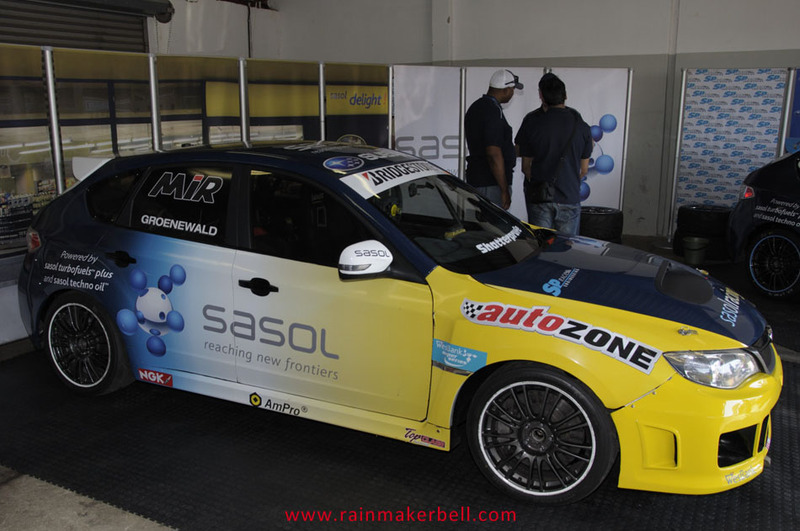 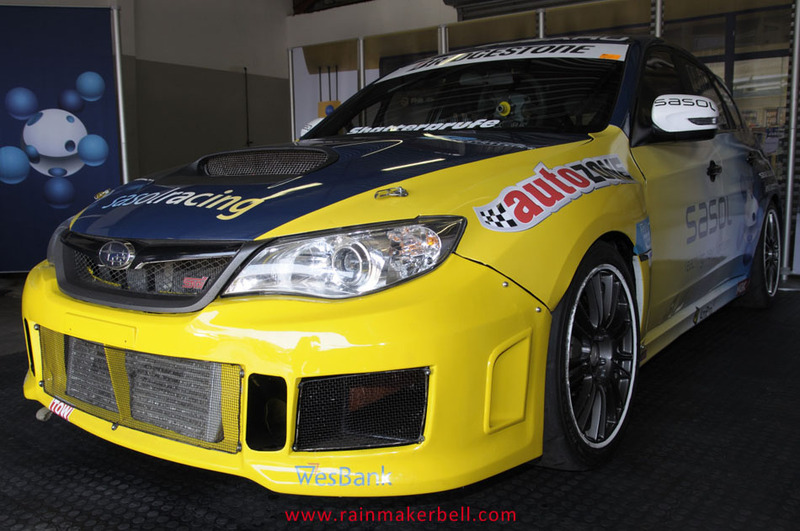 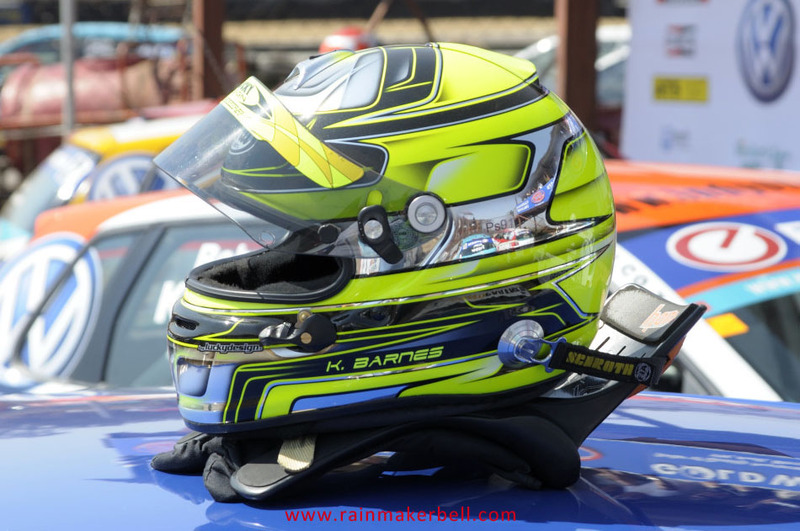 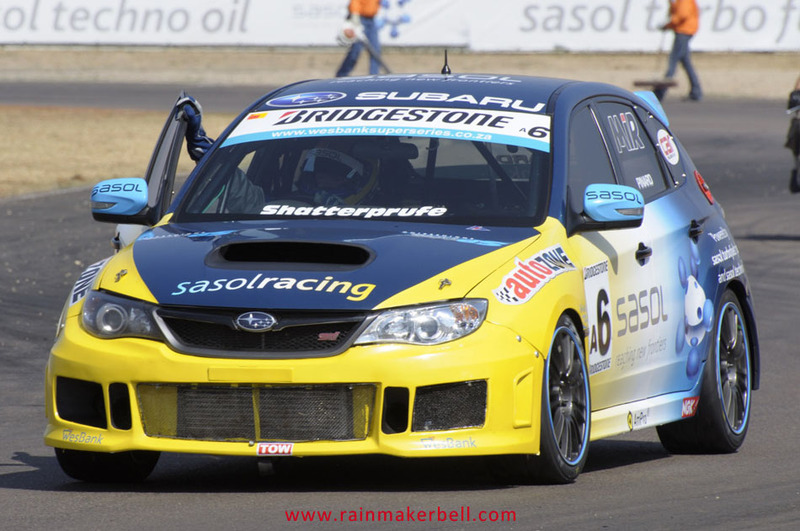 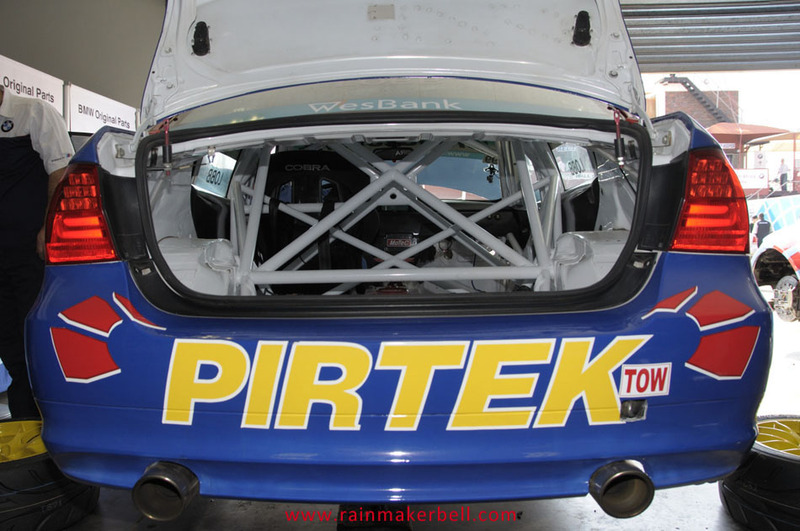 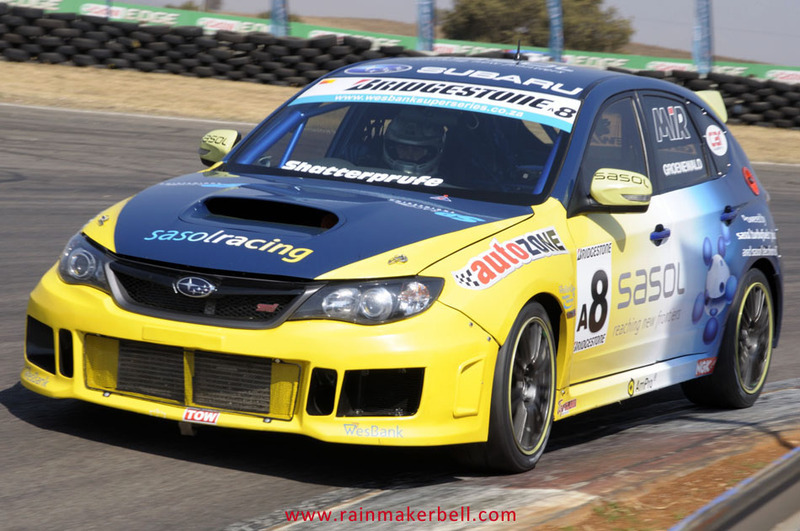 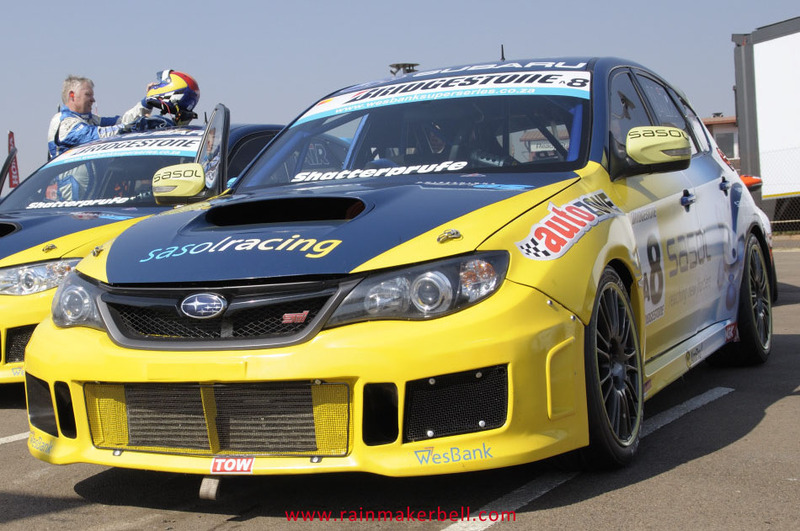 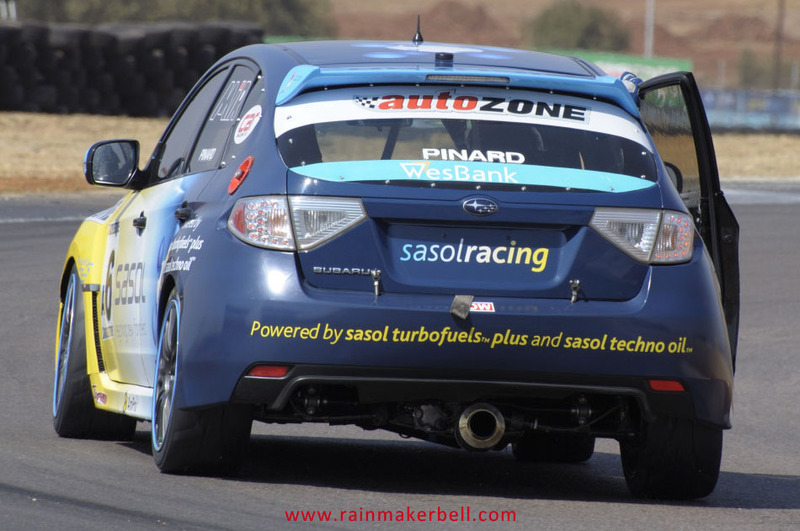 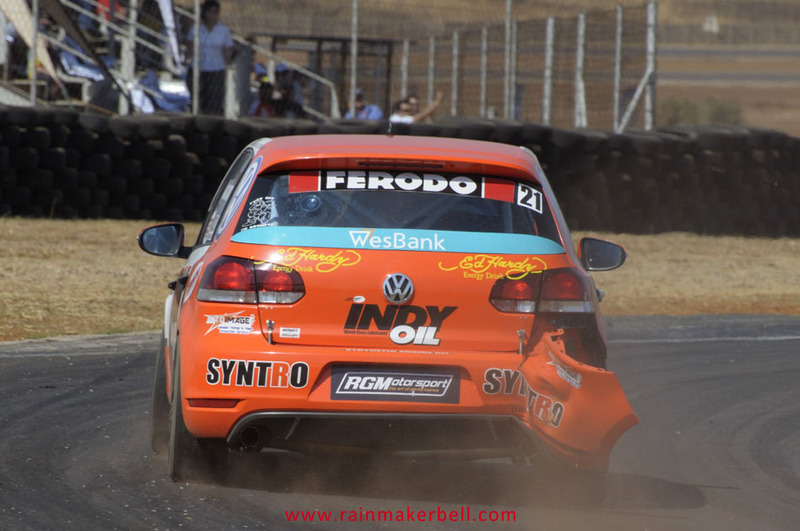 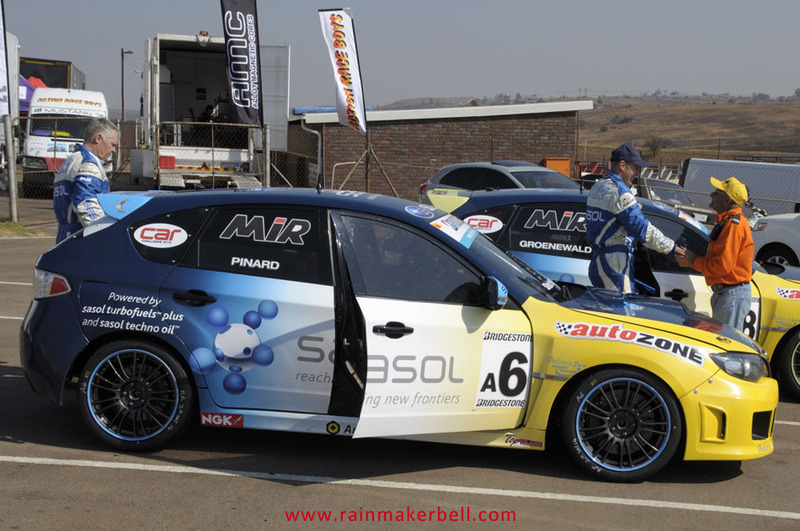 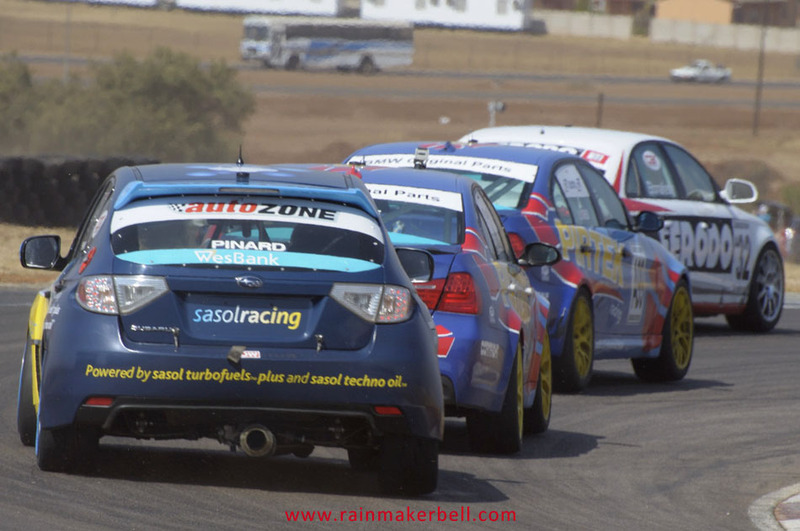 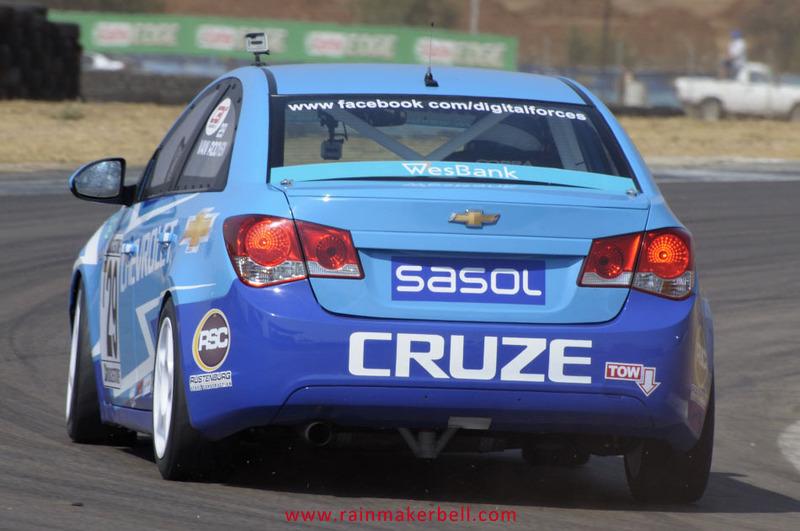 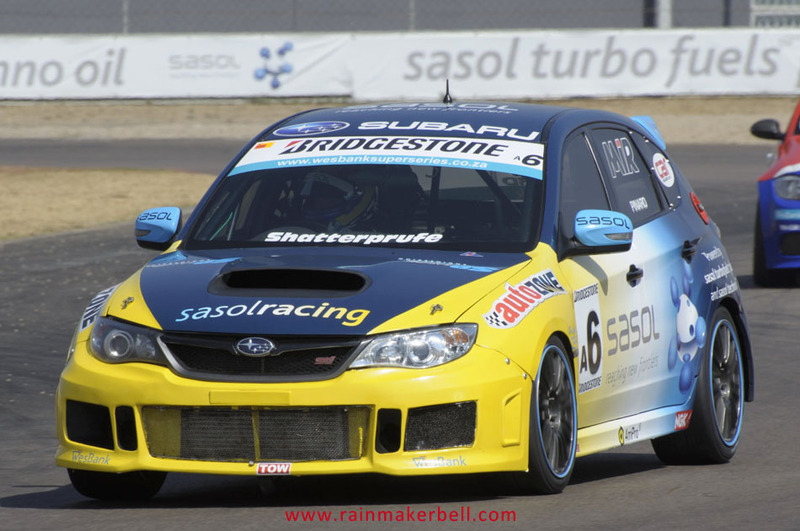 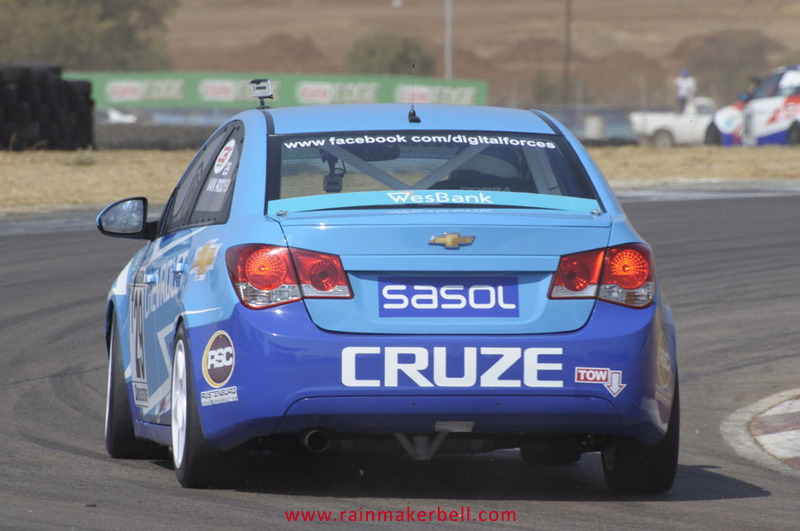 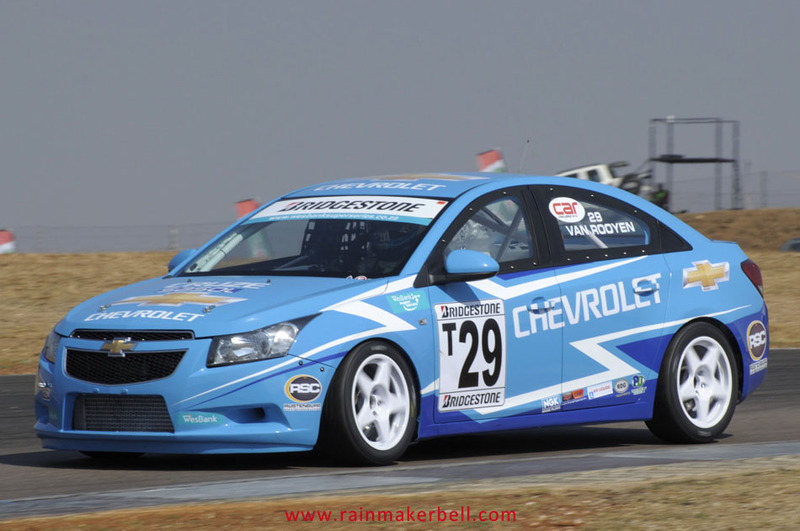 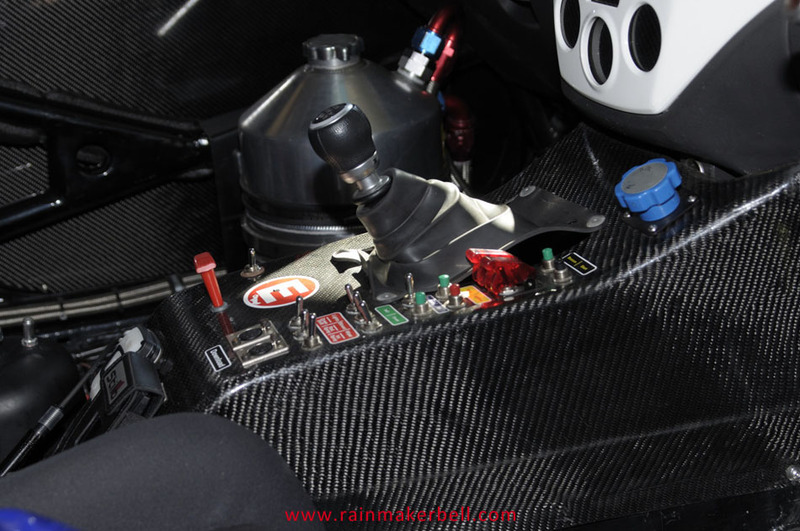 On the south side the Subaru WRX STI team of Hennie Groenewald and Richard Pinard boasted a more confident attitude; confidence hanged in the air like the smell of freshly baked bread. 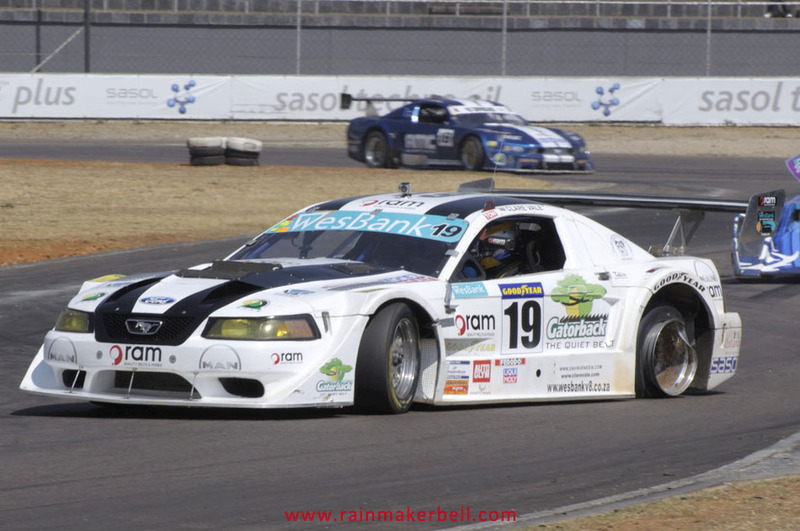 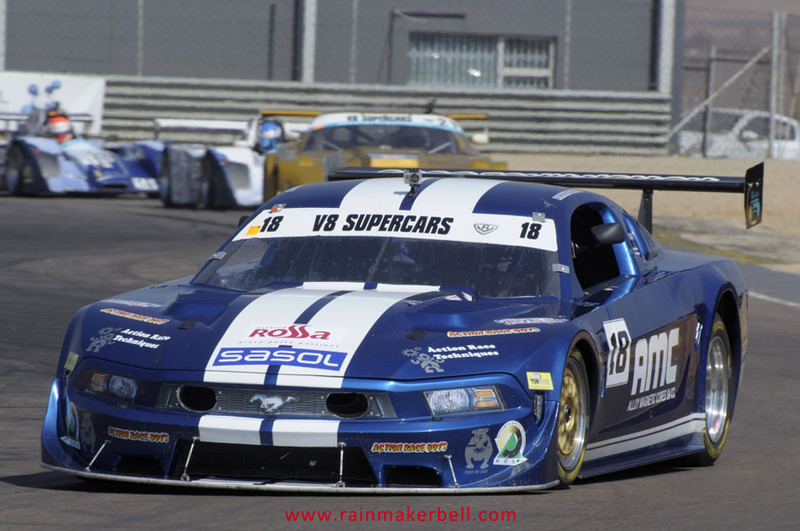 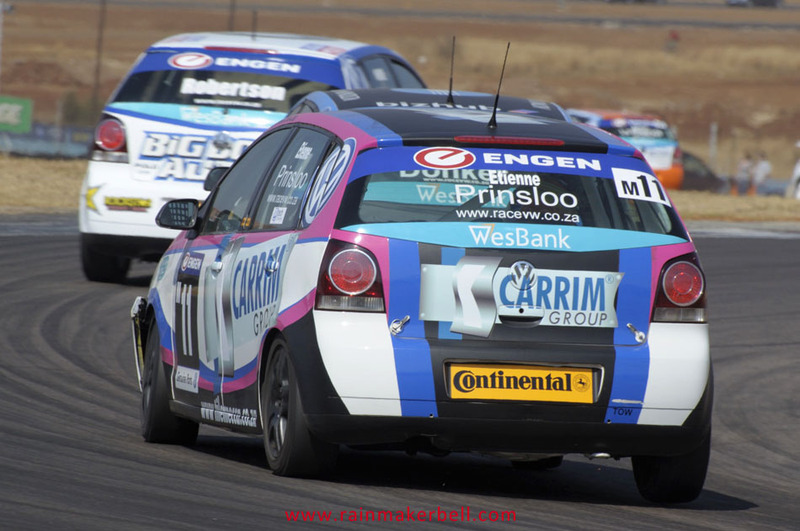 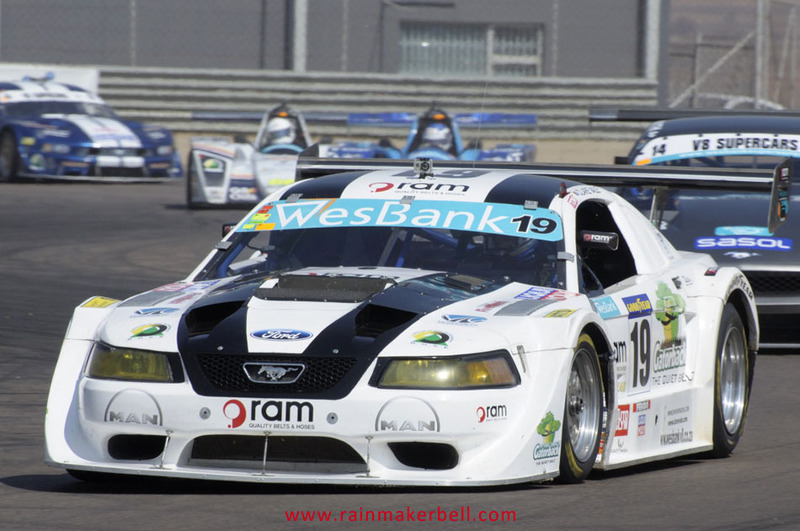 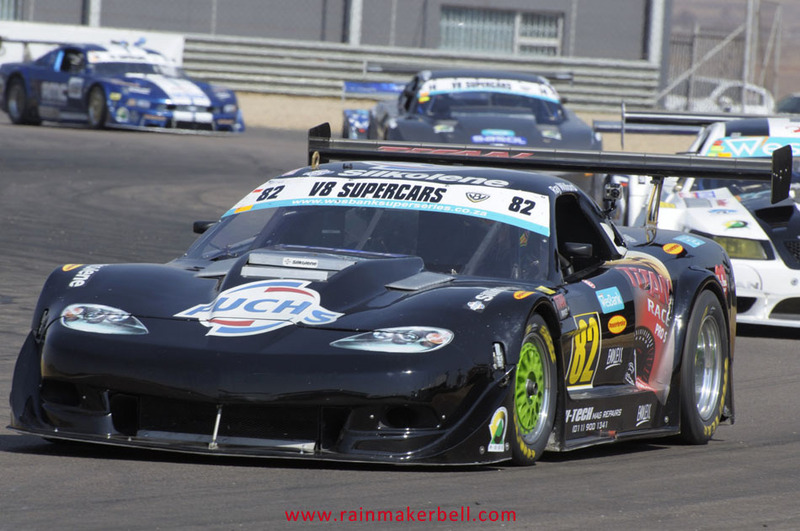 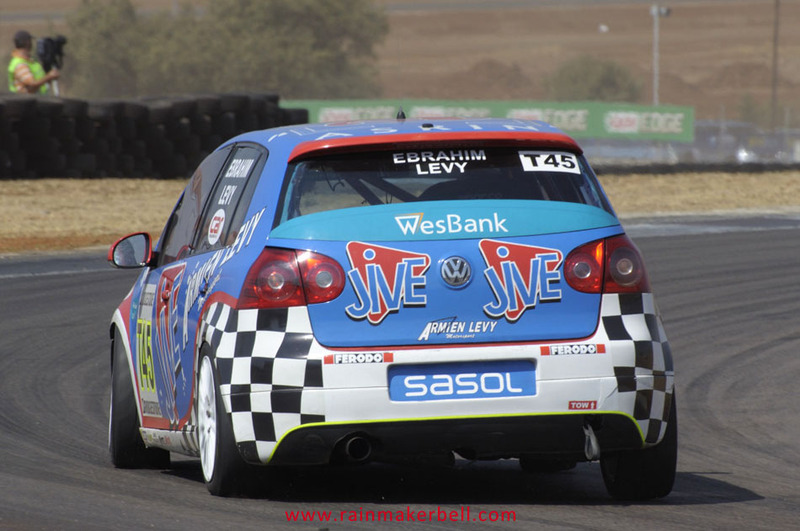 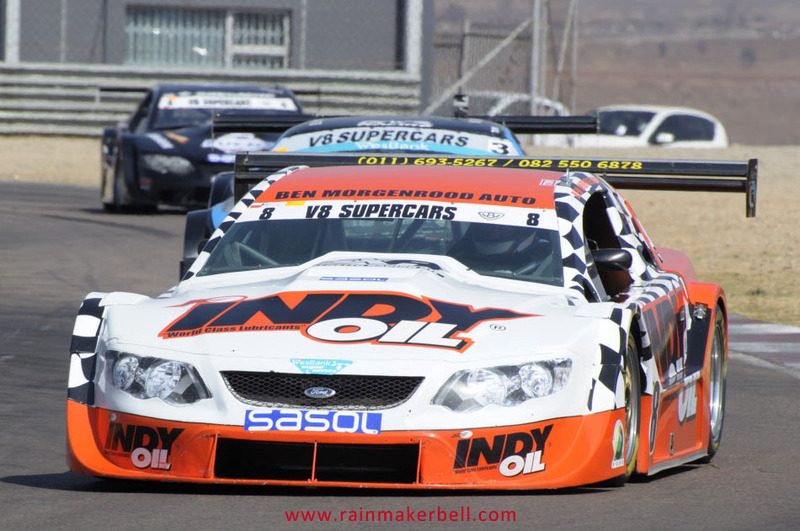 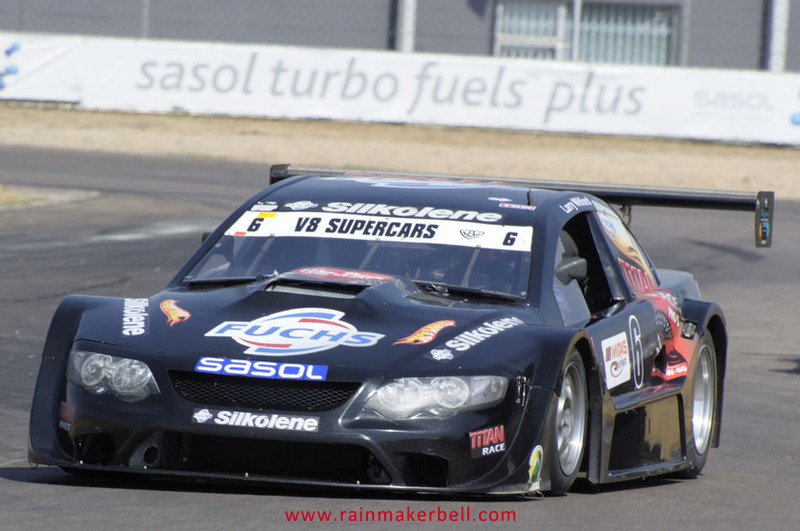 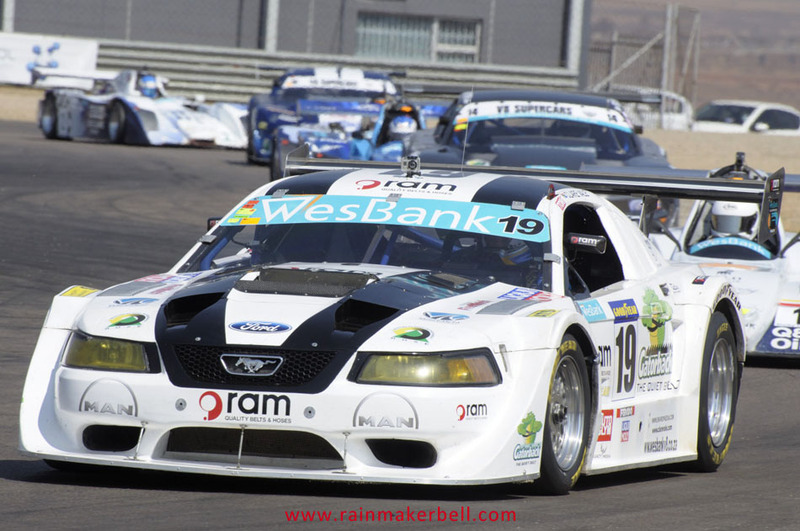 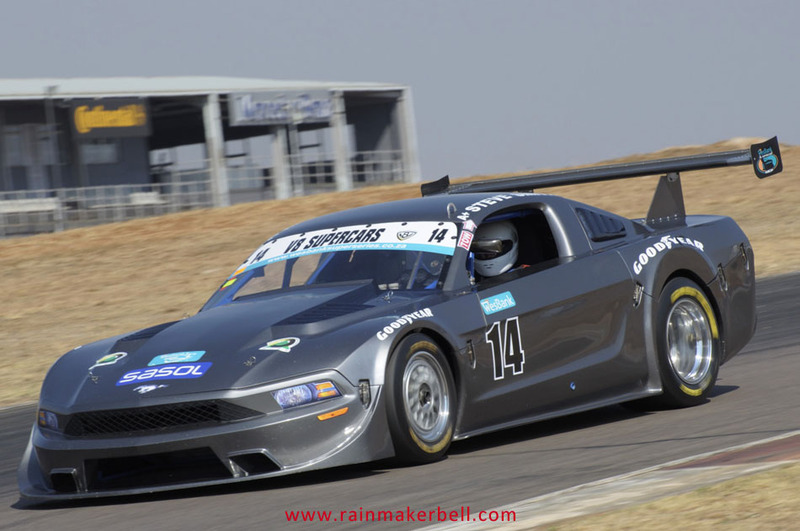 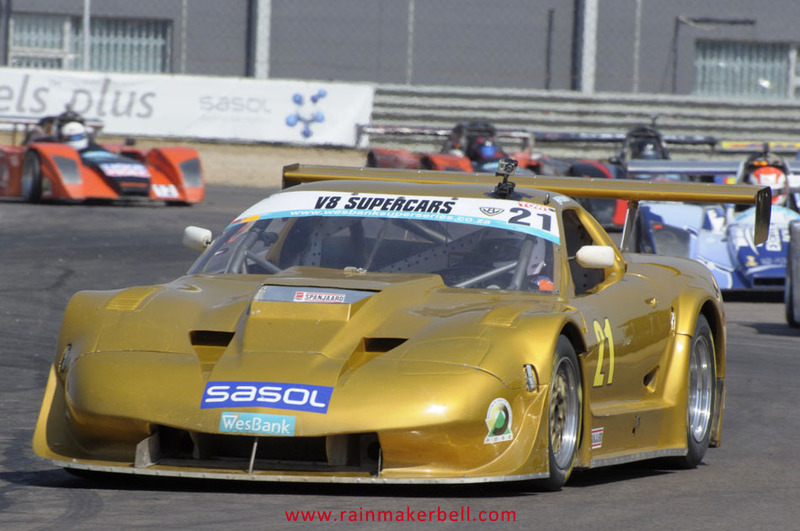 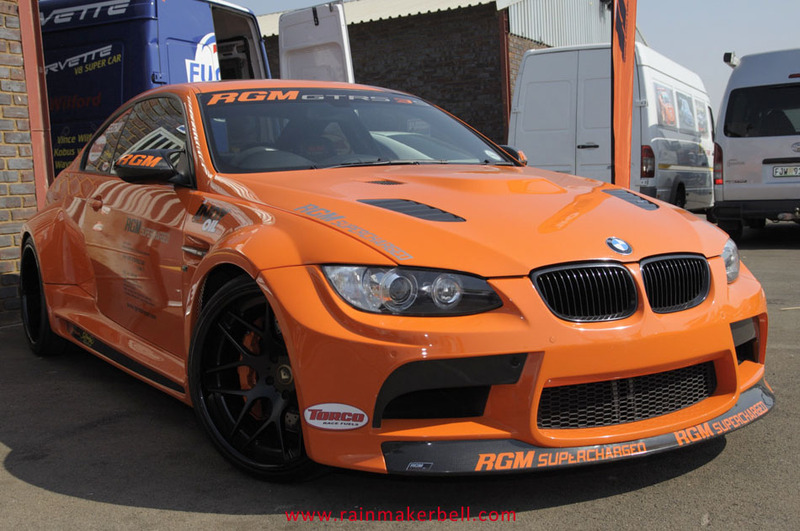 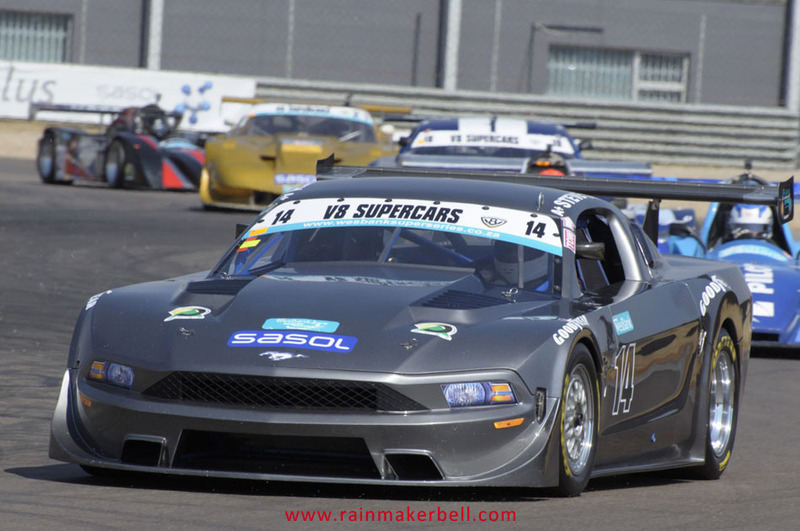 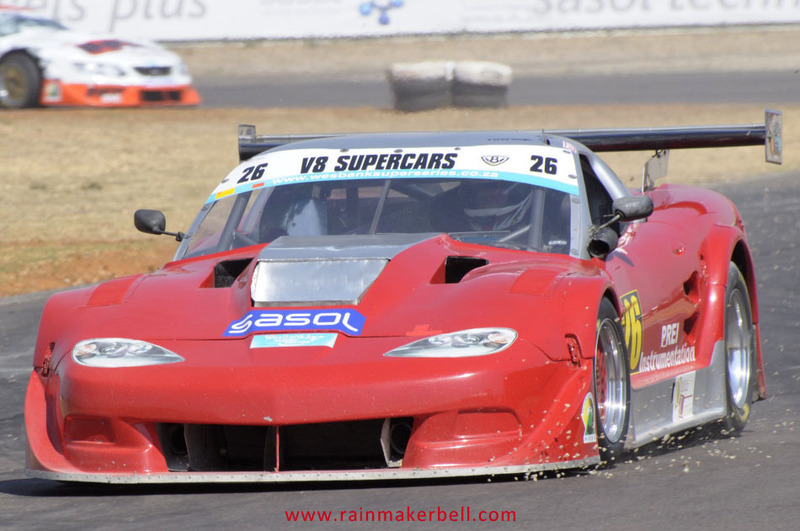 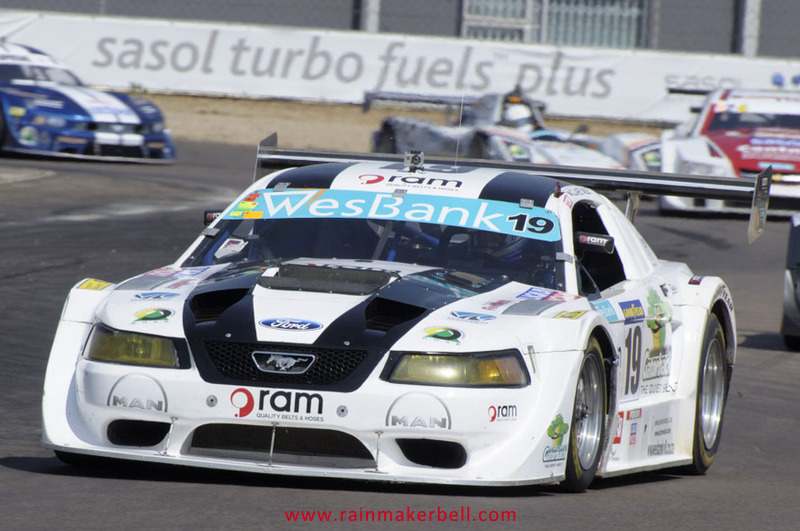 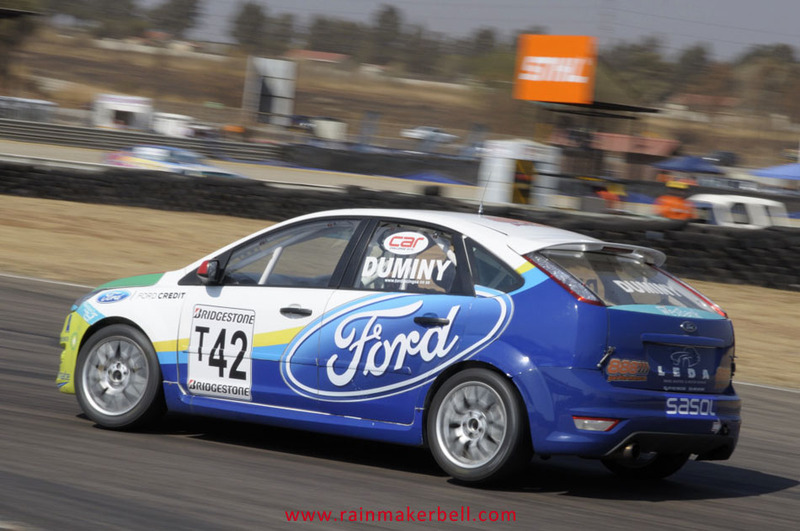 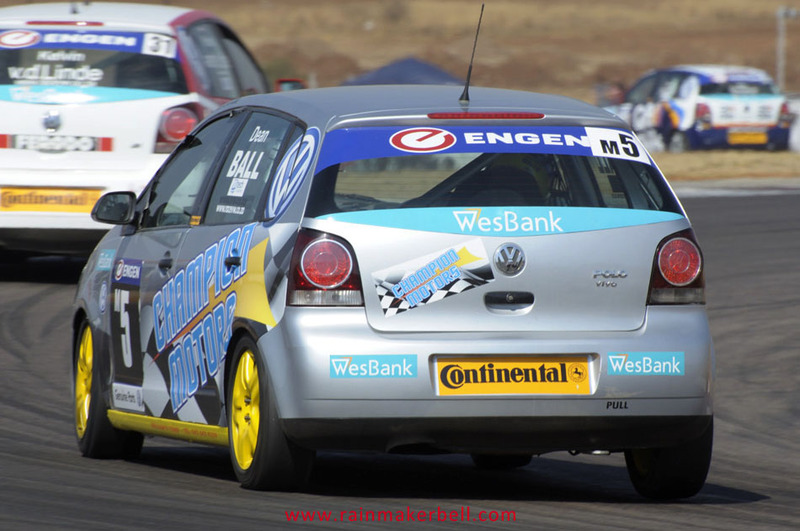 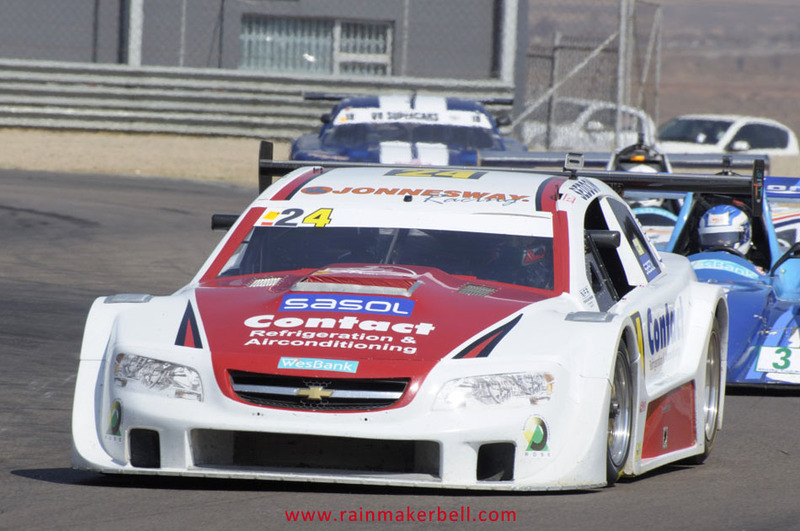 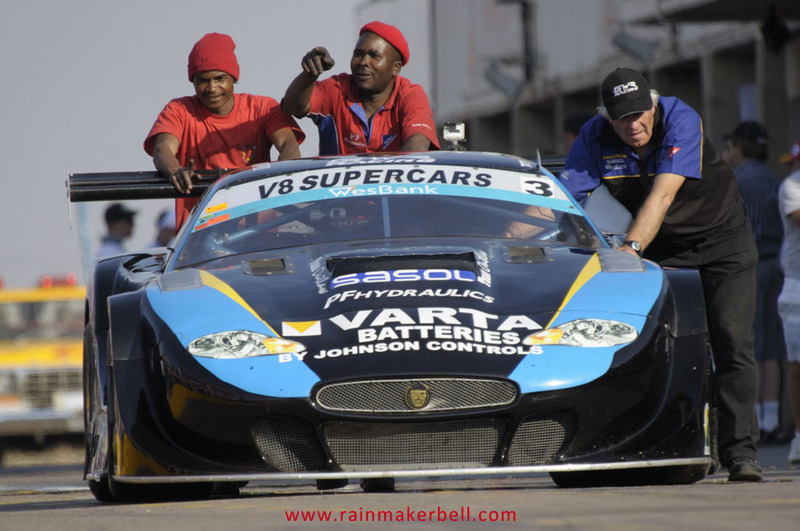 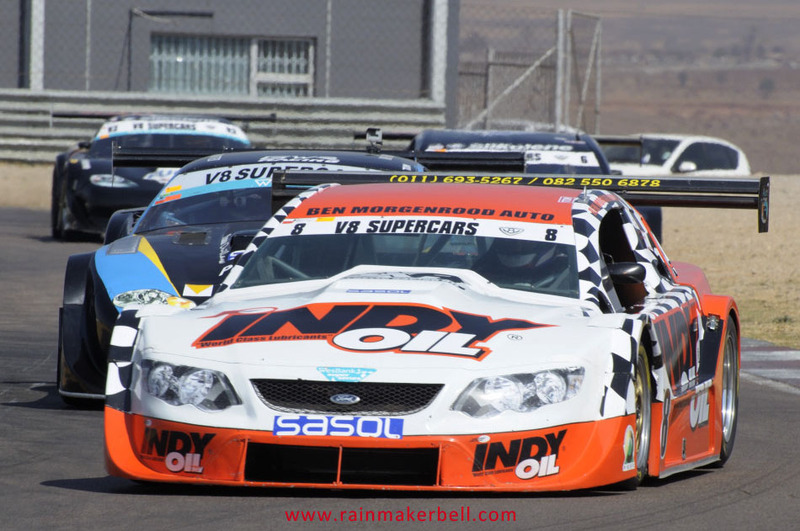 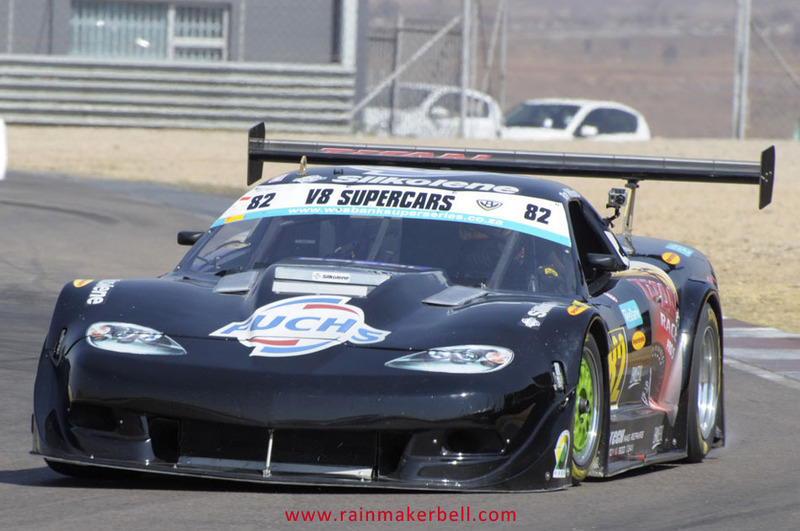 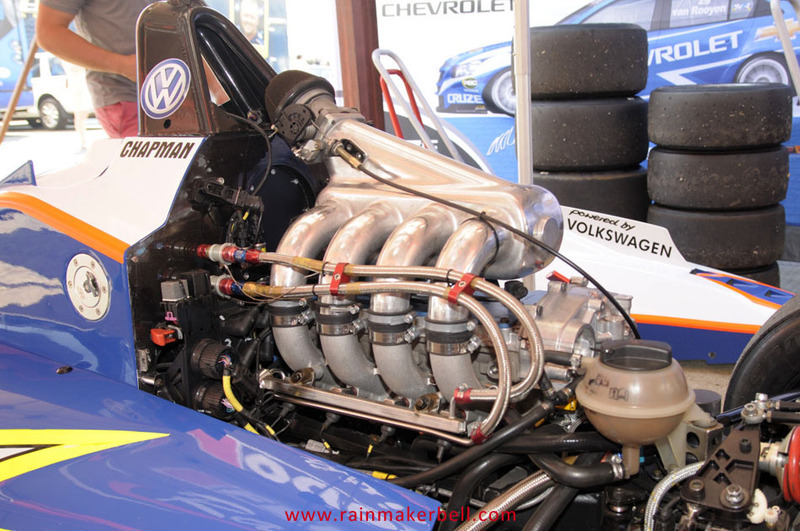 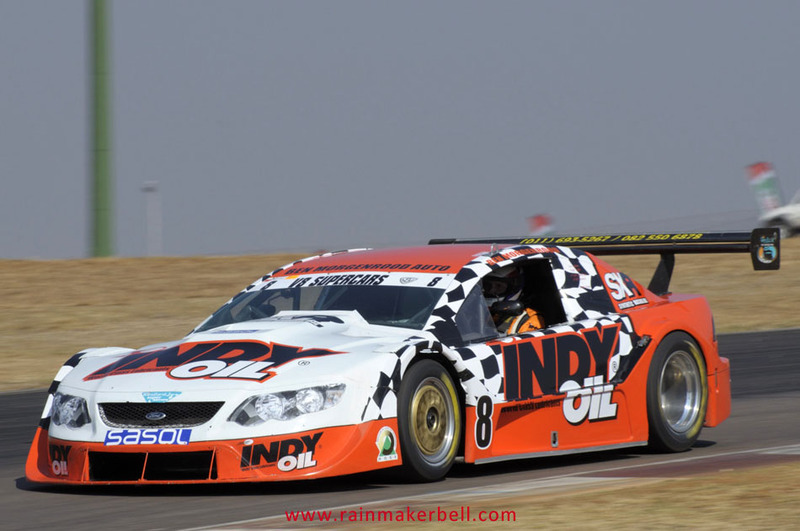 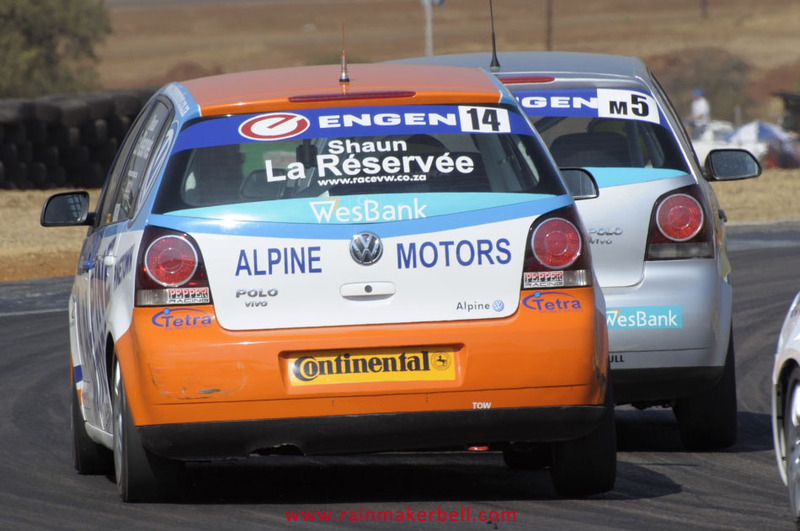 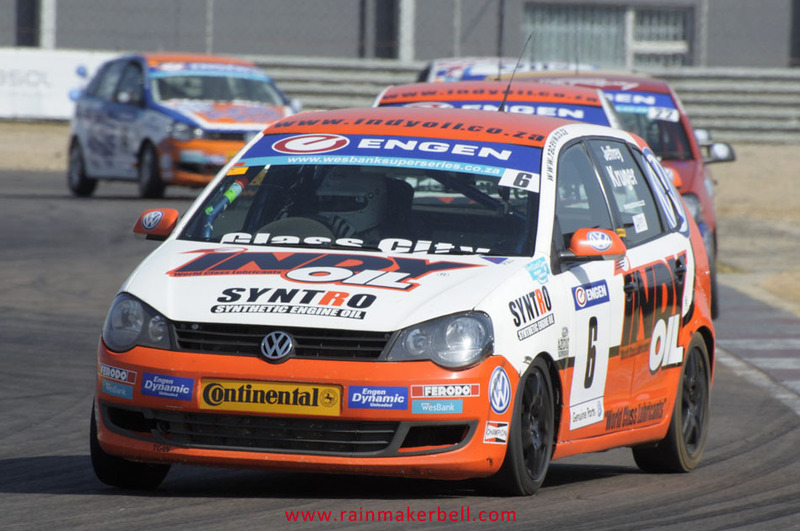 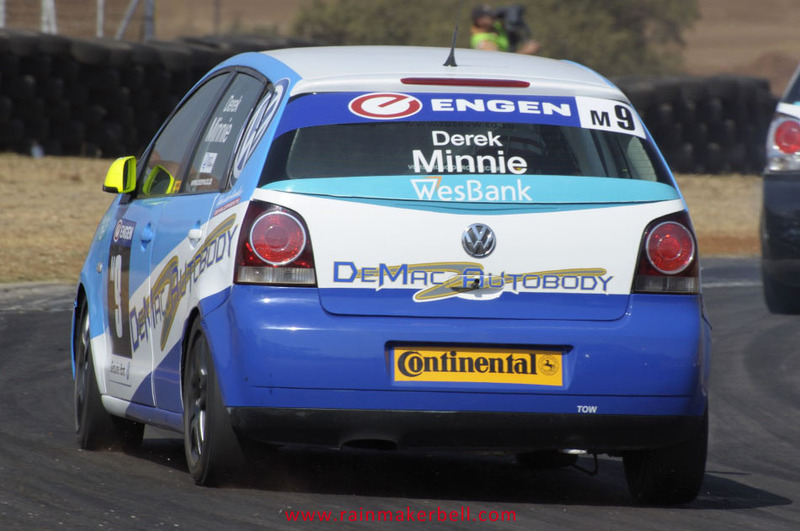 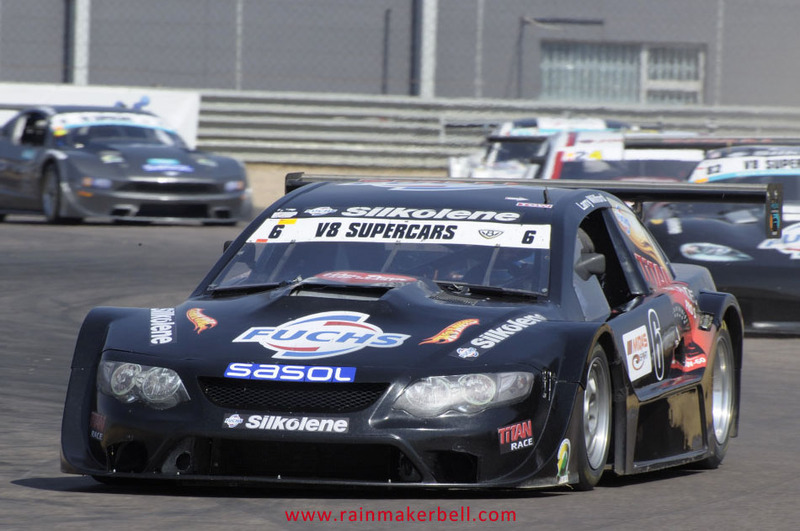 The Wesbank Super Series race programme eloquently pointed out that the Wesbank V8 Supercars and the Shelby Can Ams would share the track at the same time in both races, how disappointing. 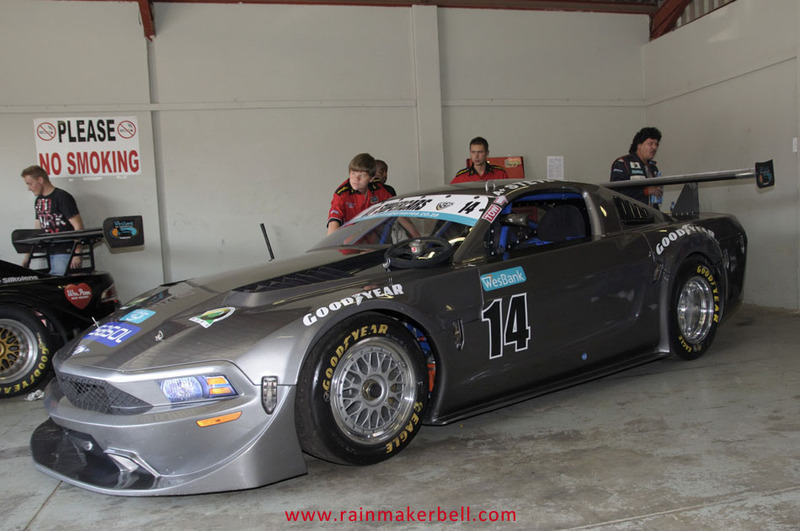 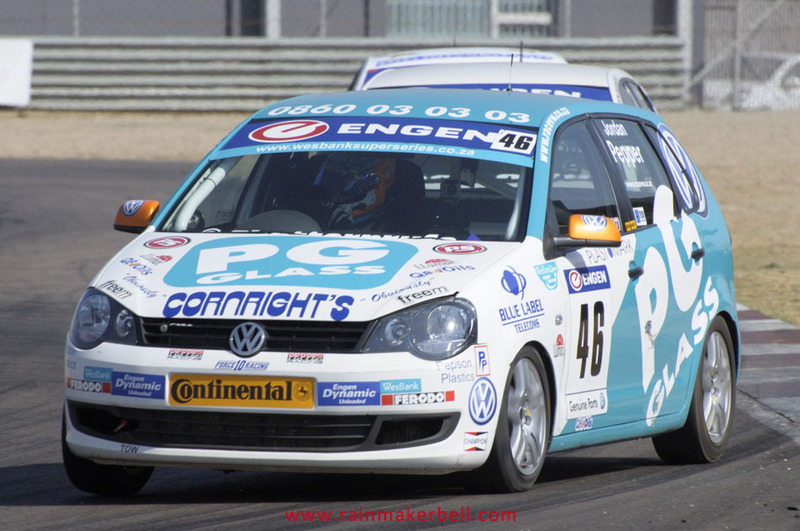 Back in the Pro Tour days, they were also used to fill up the starting grid alongside the GT Challenge class, or maybe it was the other way around? 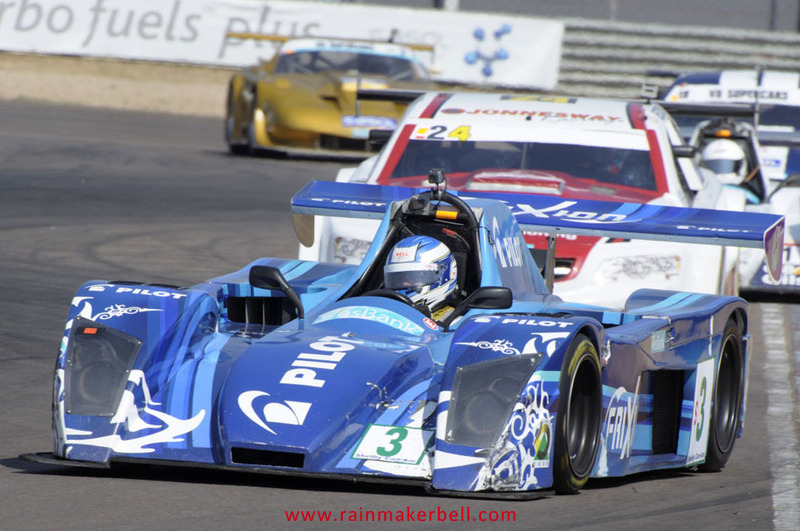 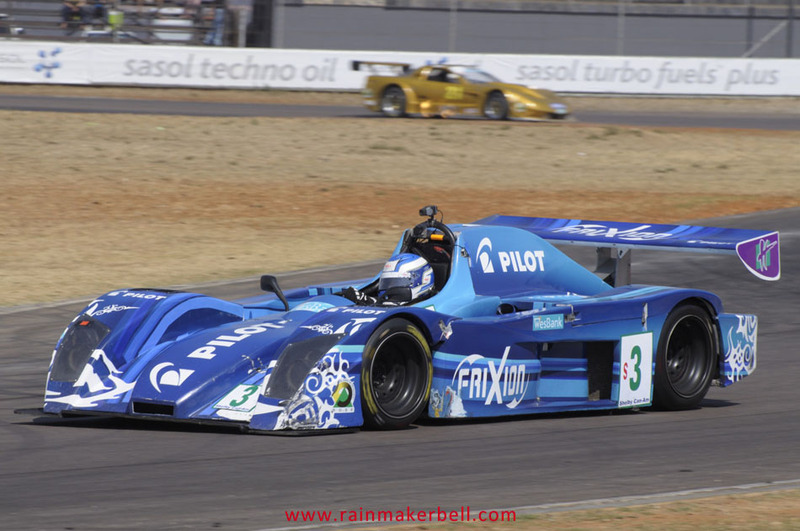 Whatever it is, these Cars-from-Mars deserve their own spot on the tarmac! 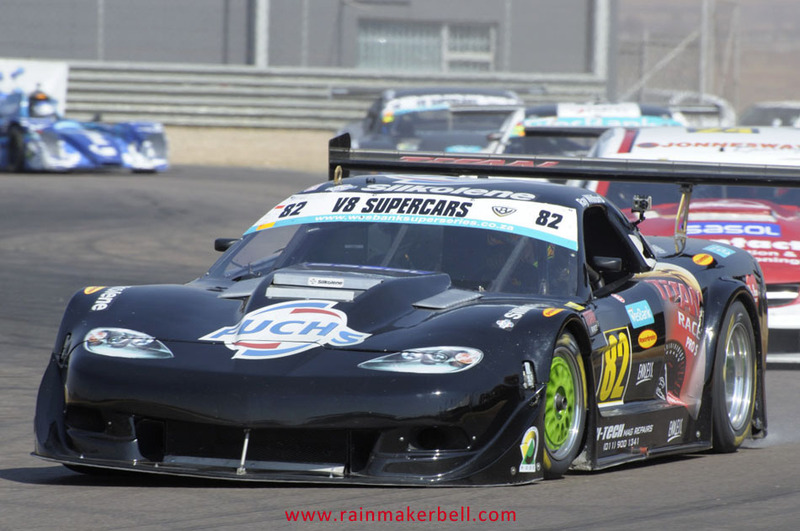 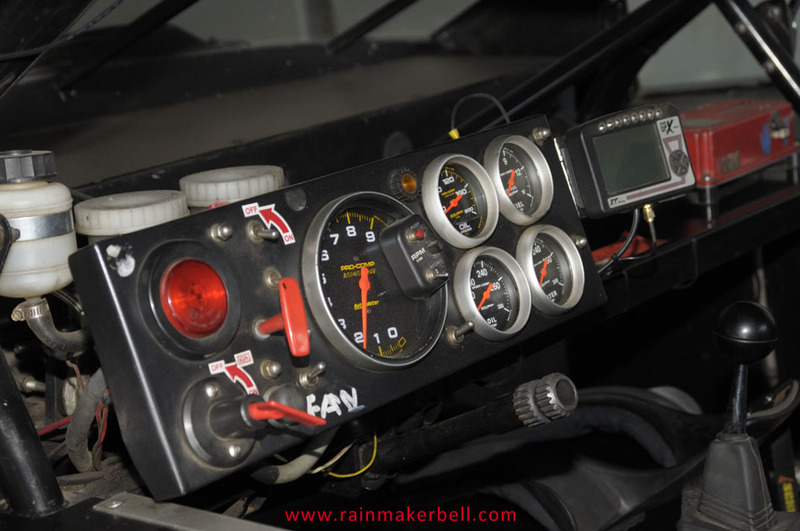 Overhead a few swallows proclaimed summer (and the high 30s); on ground level the race car action was even hotter. 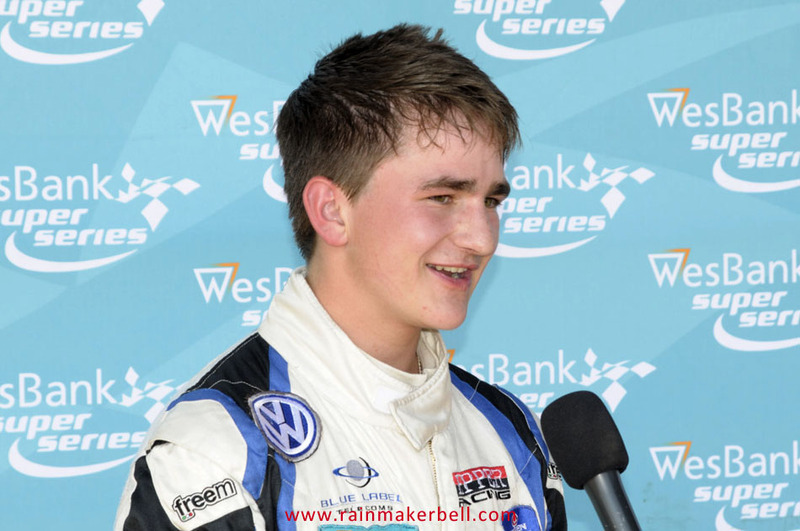 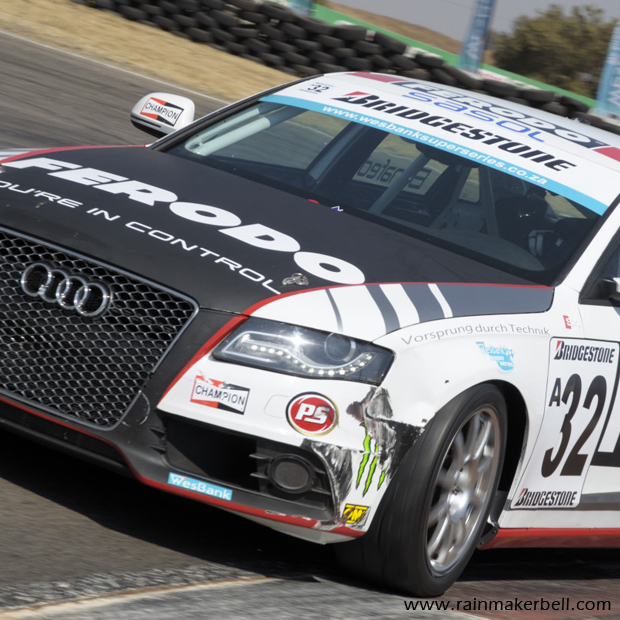 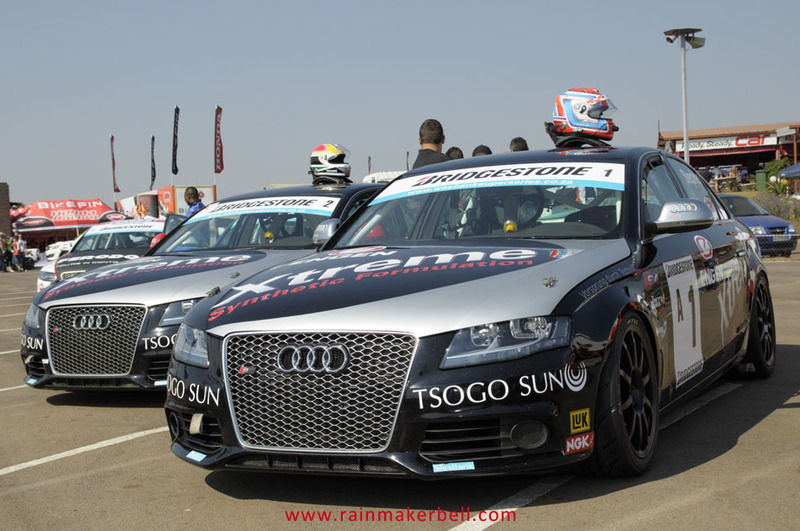 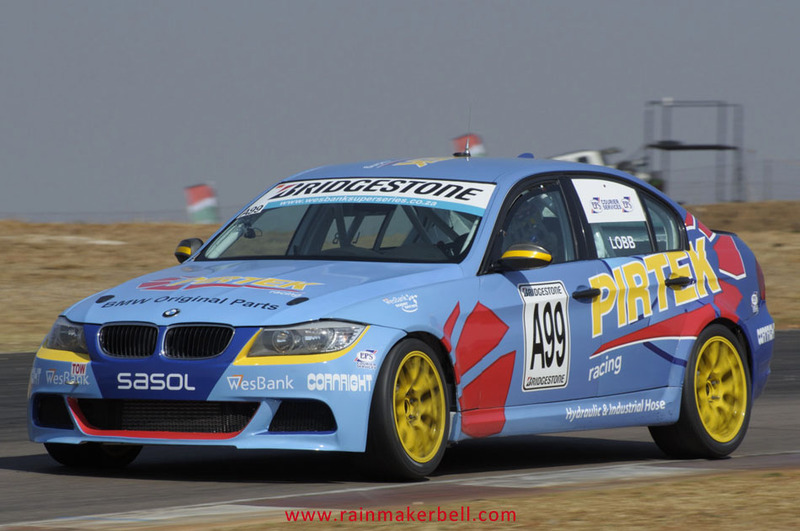 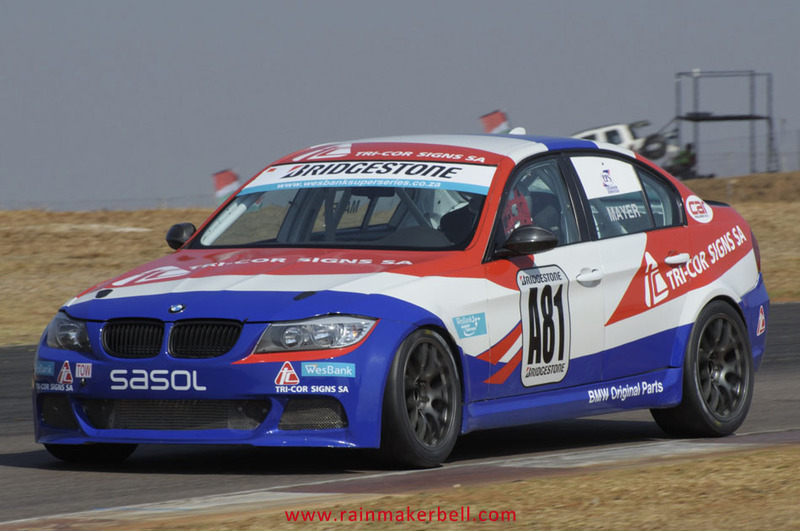 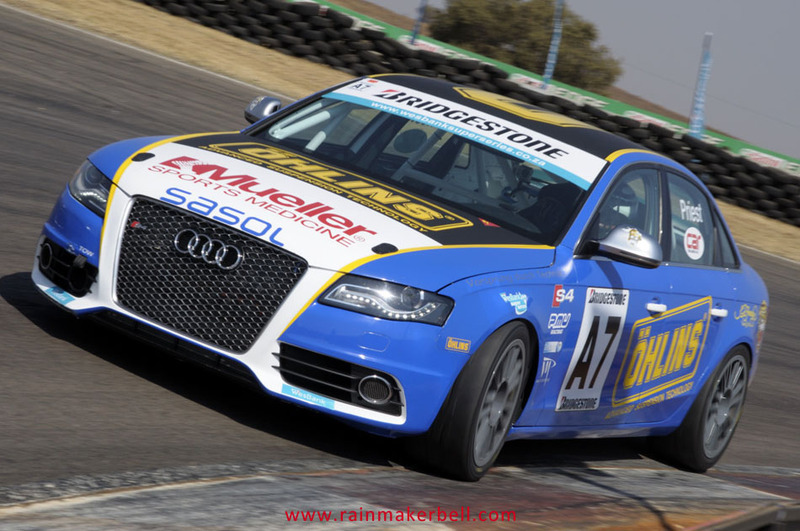 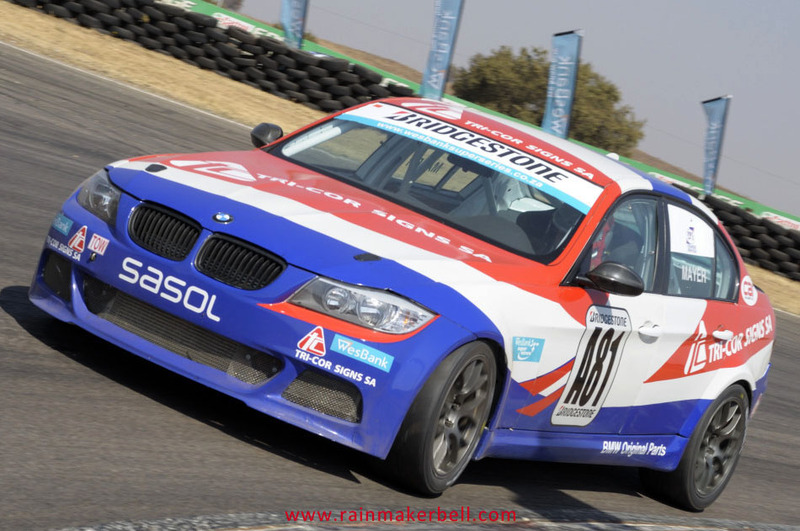 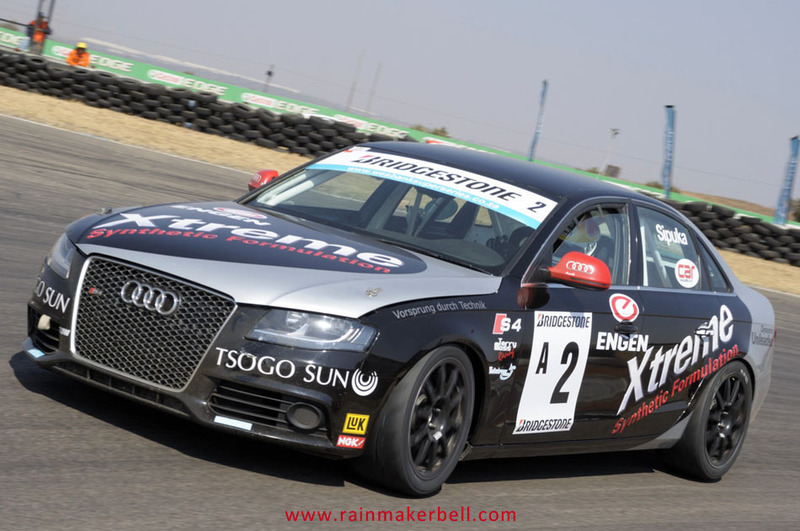 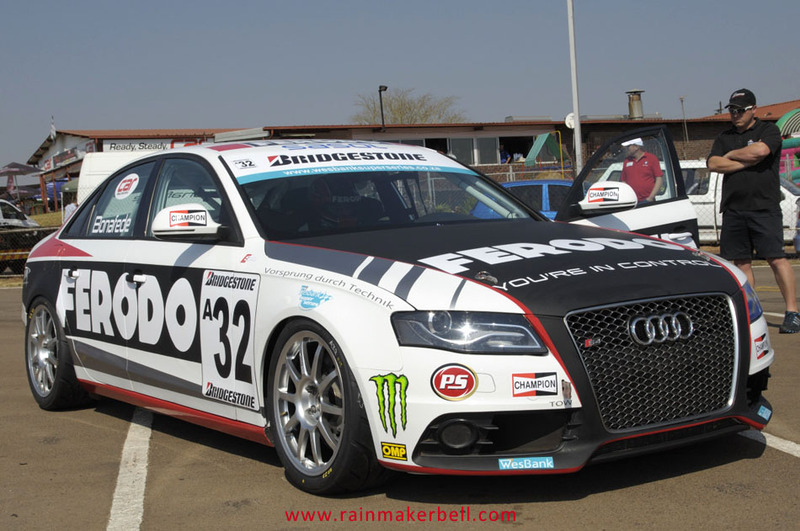 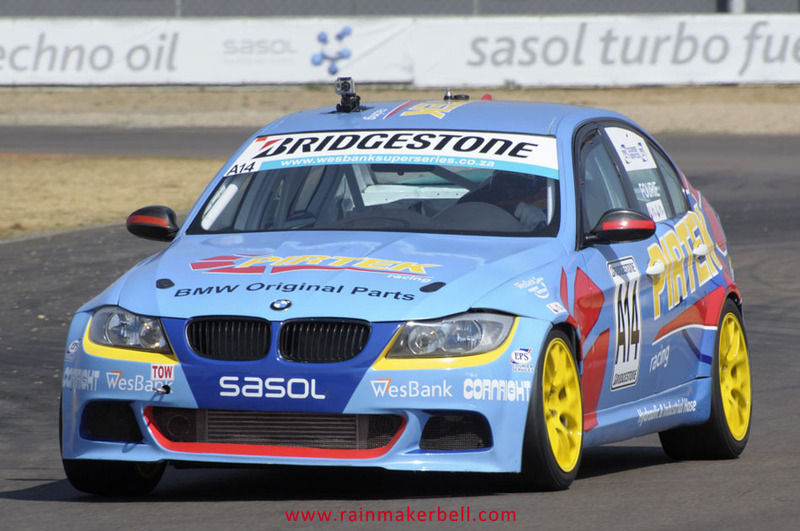 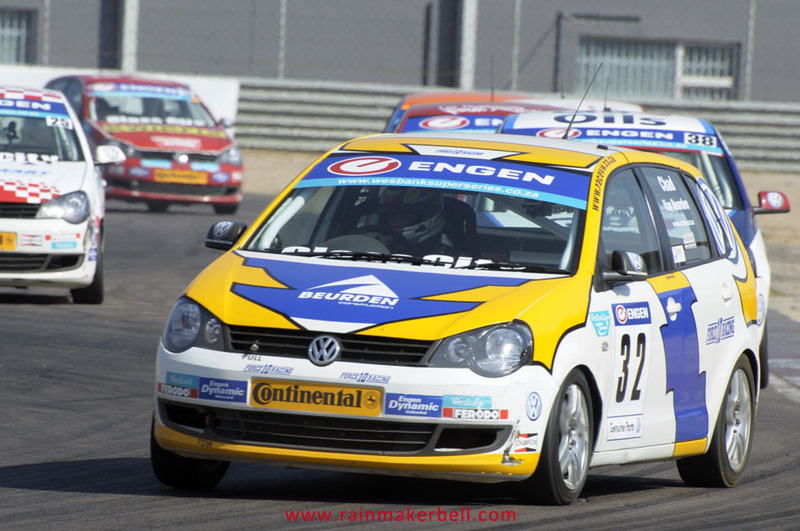 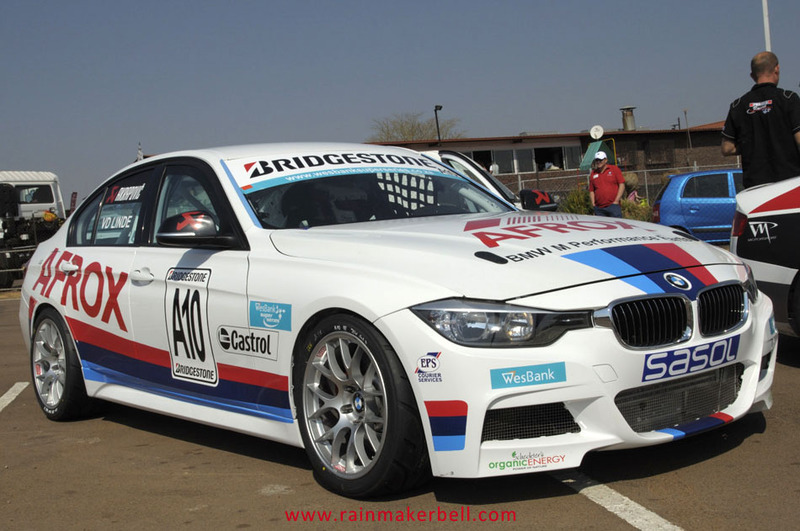 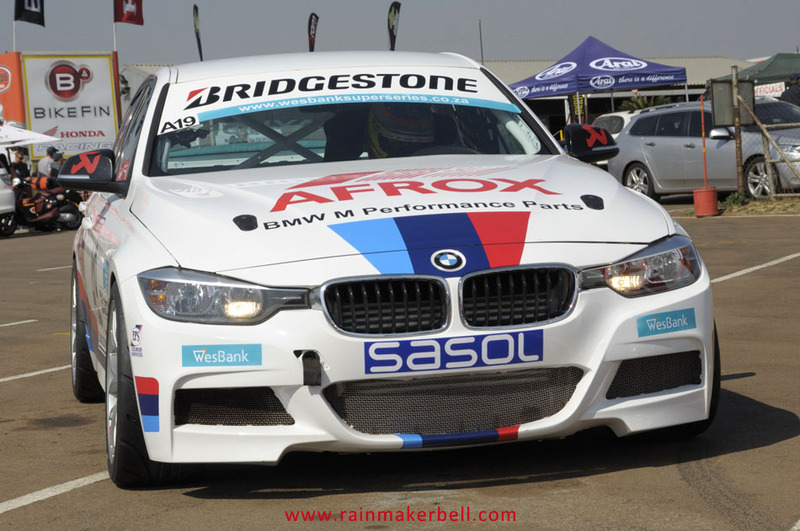 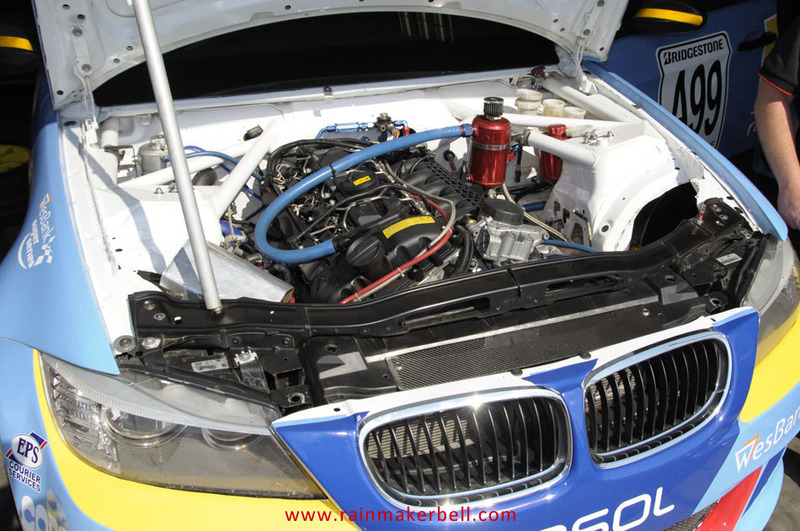 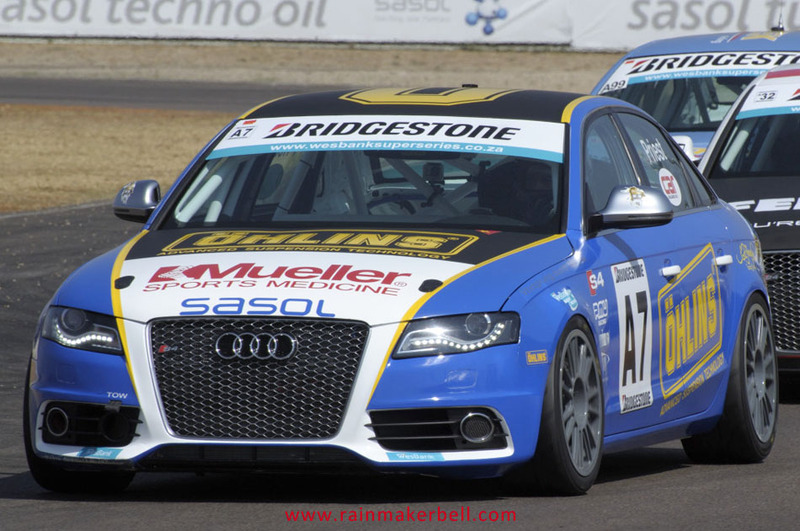 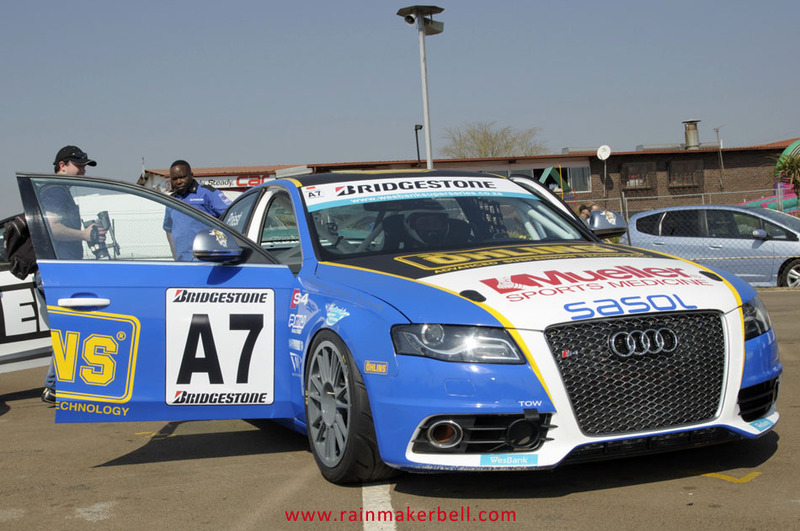 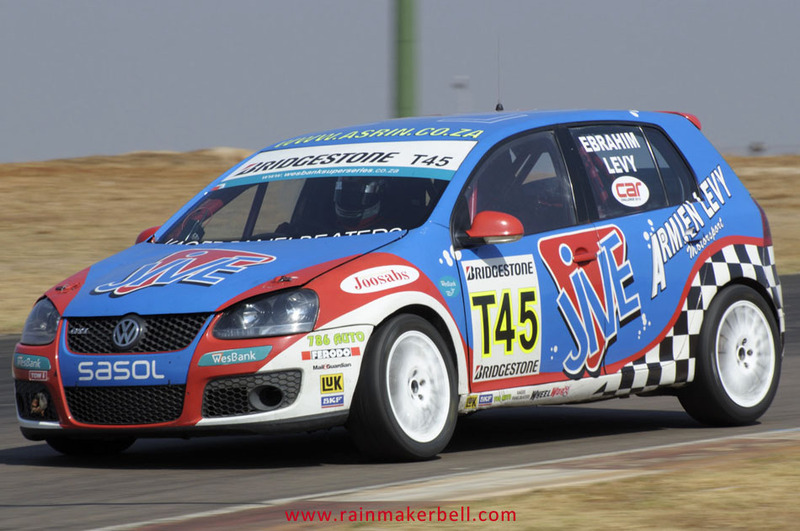 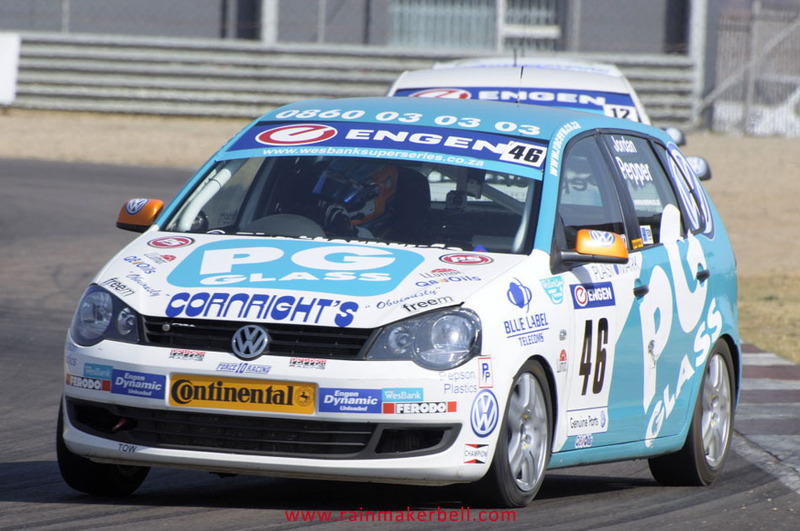 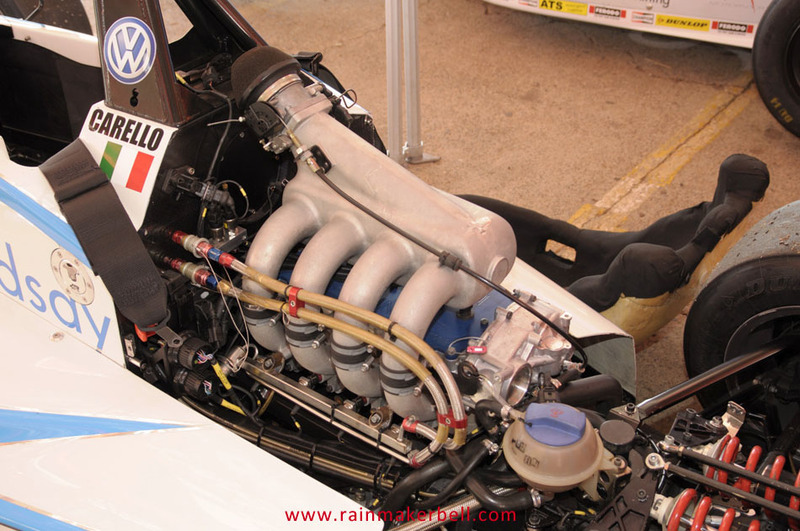 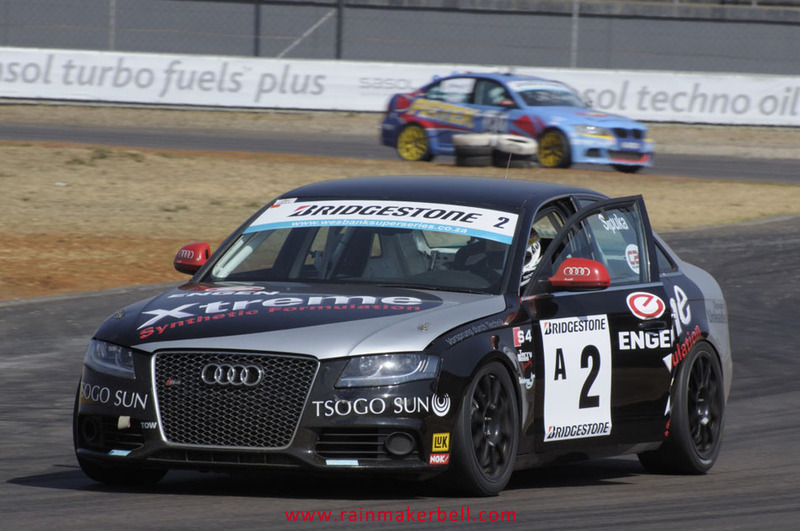 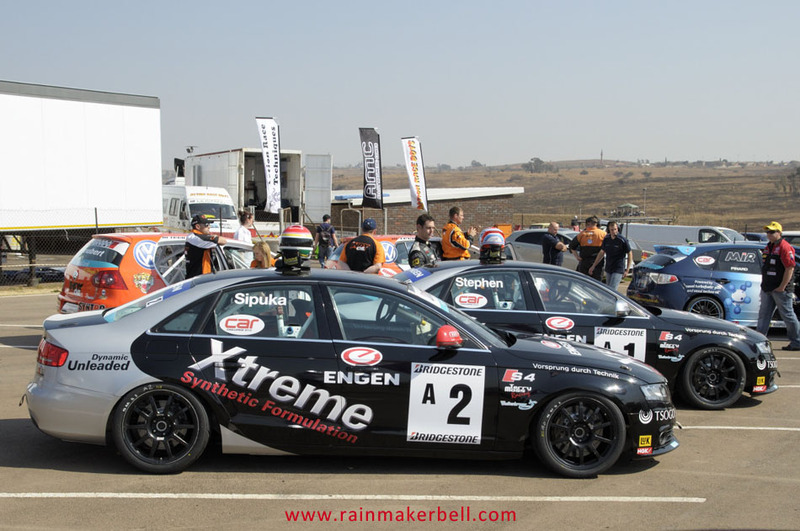 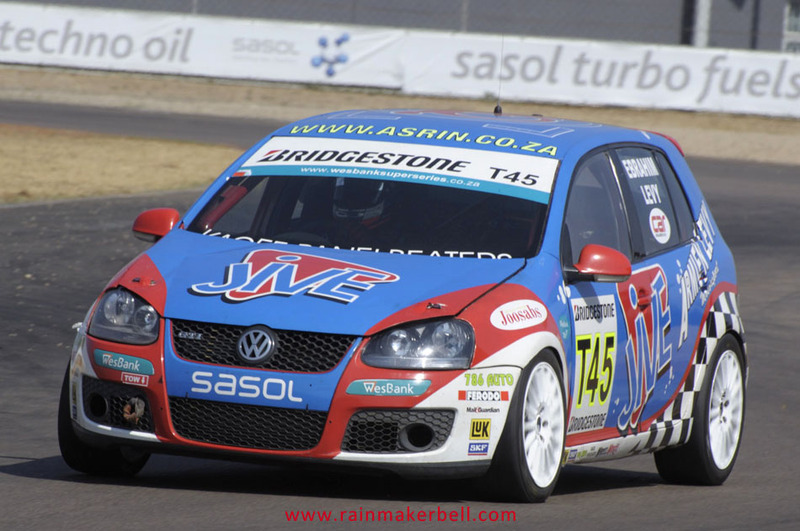 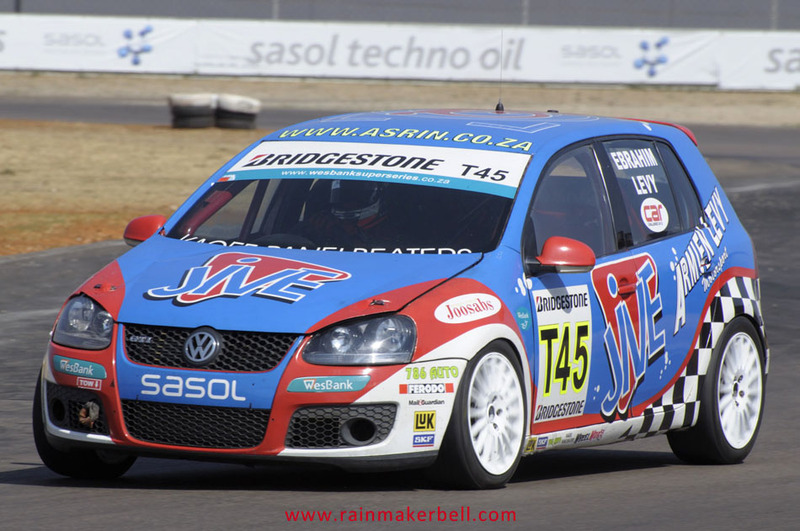 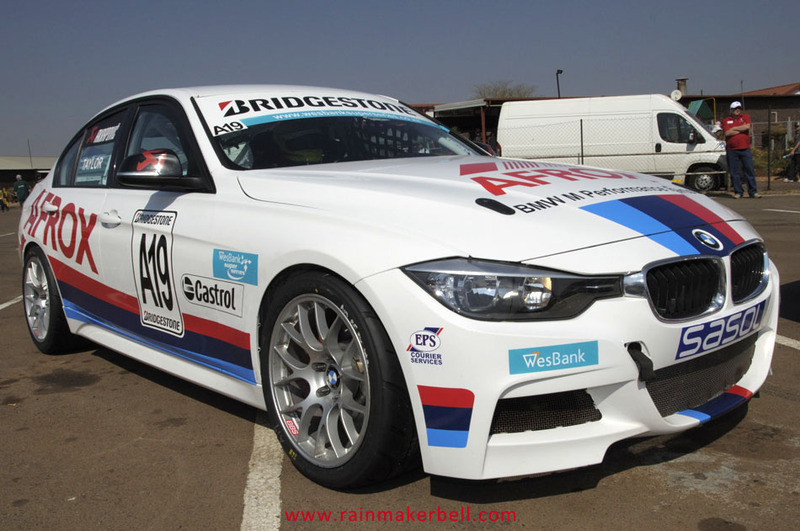 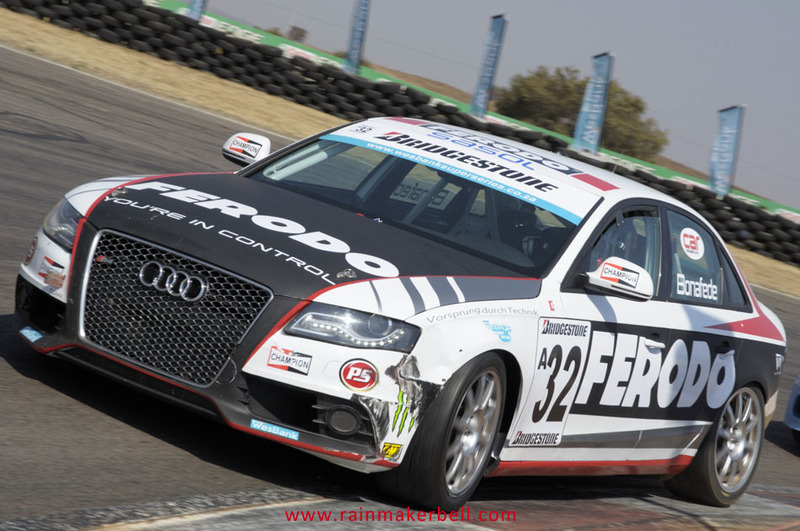 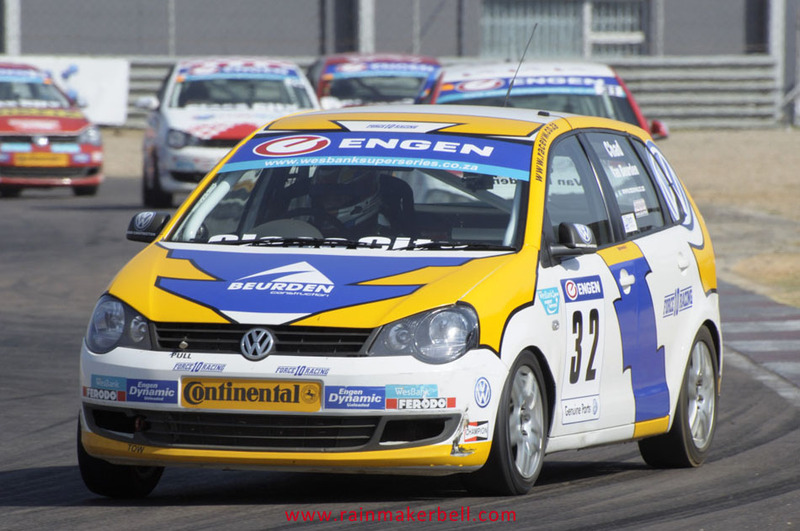 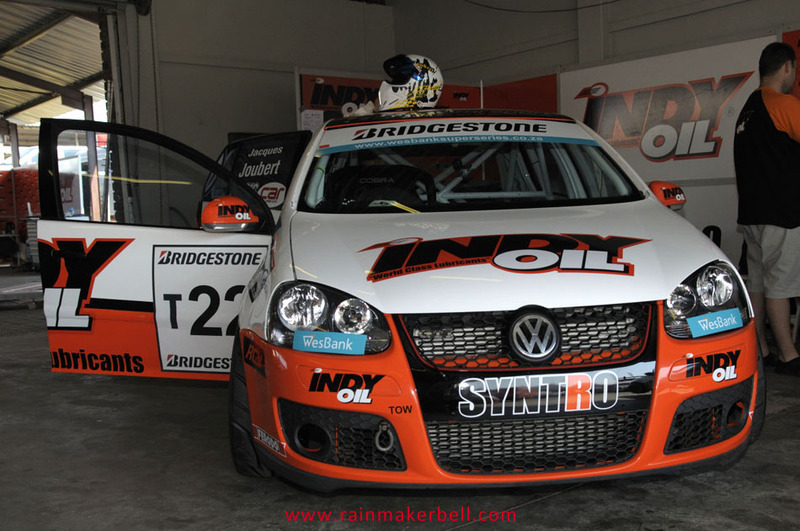 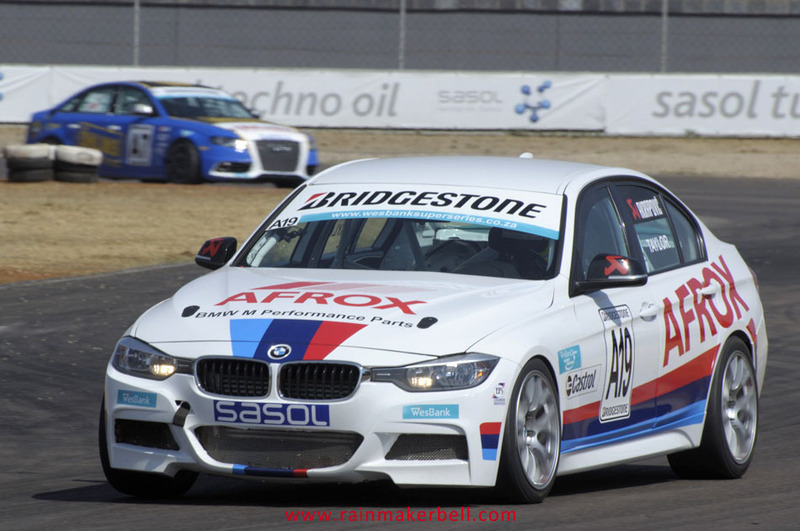 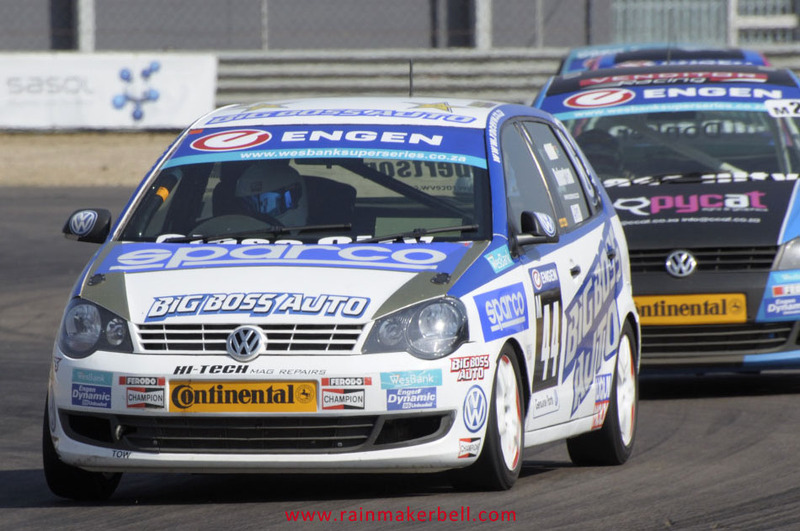 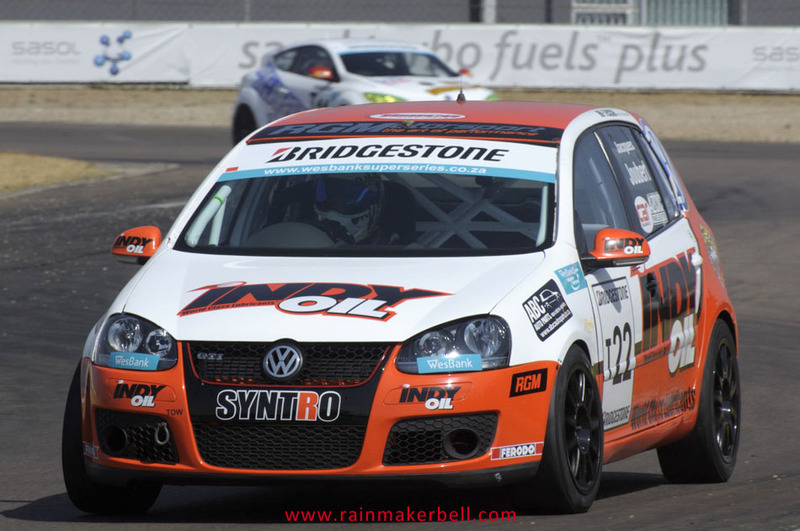 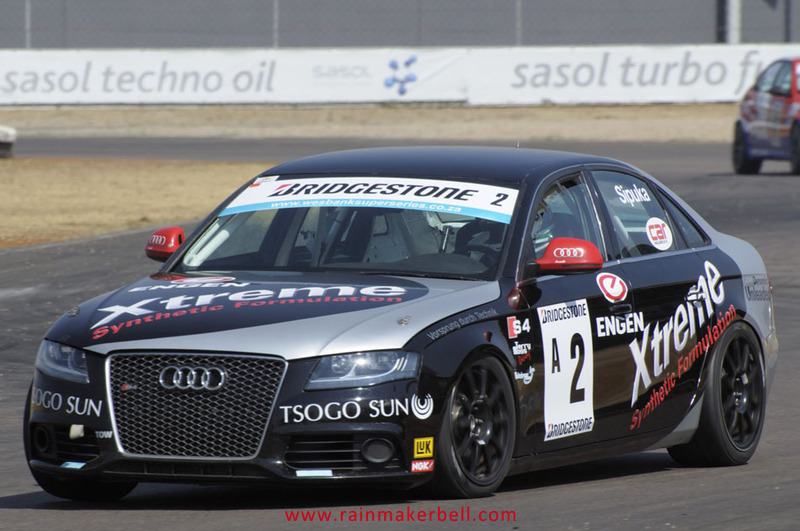 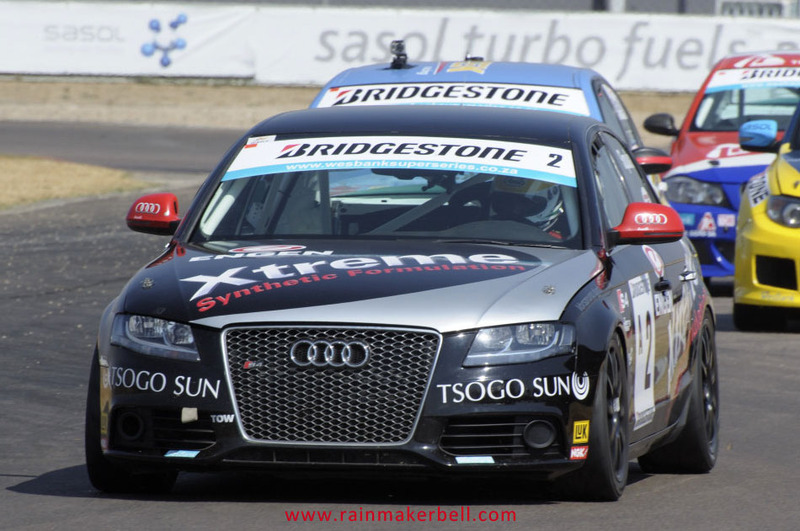 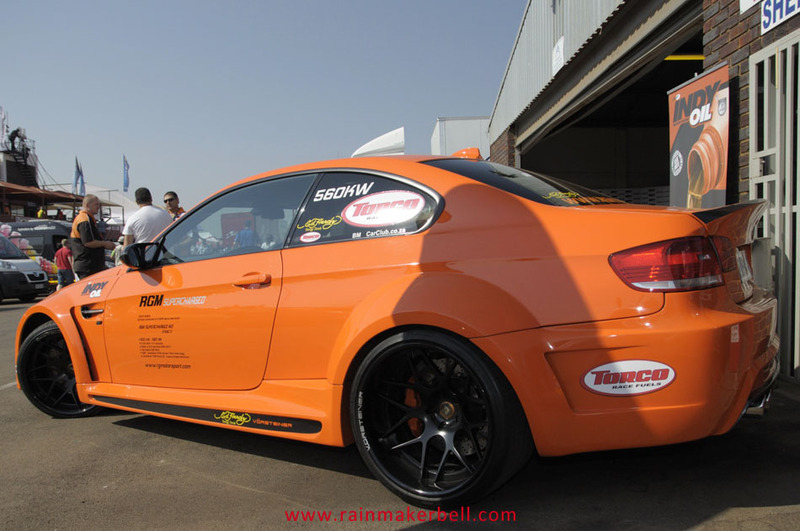 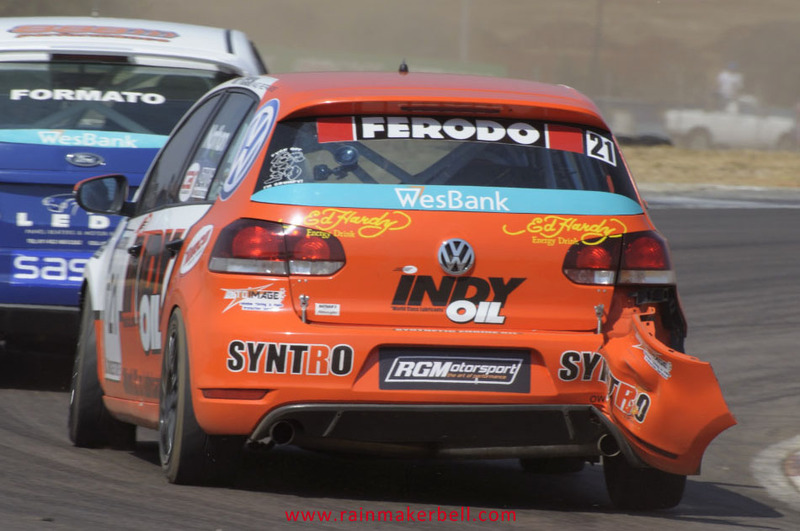 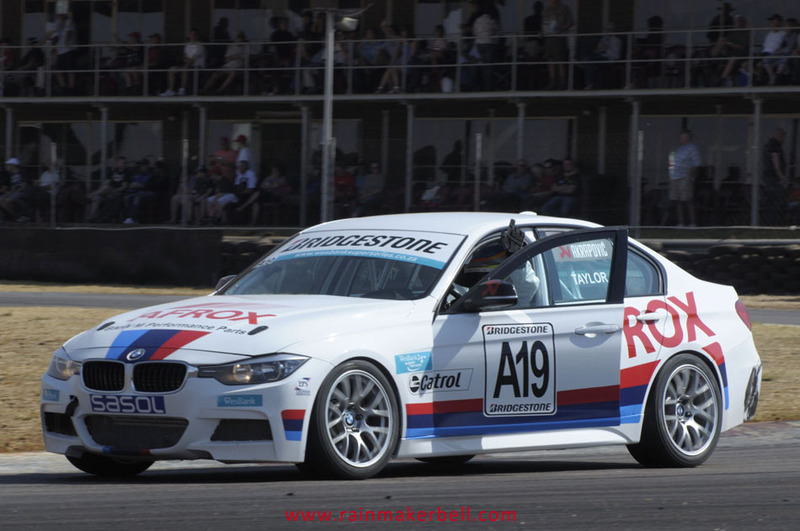 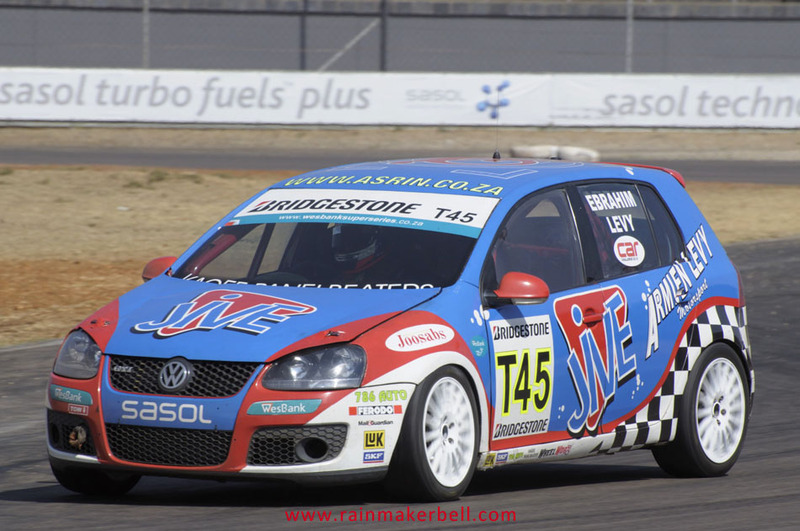 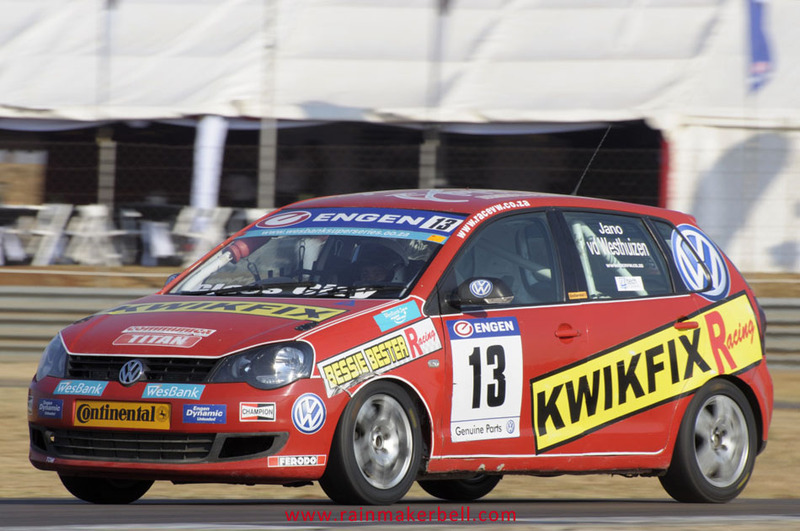 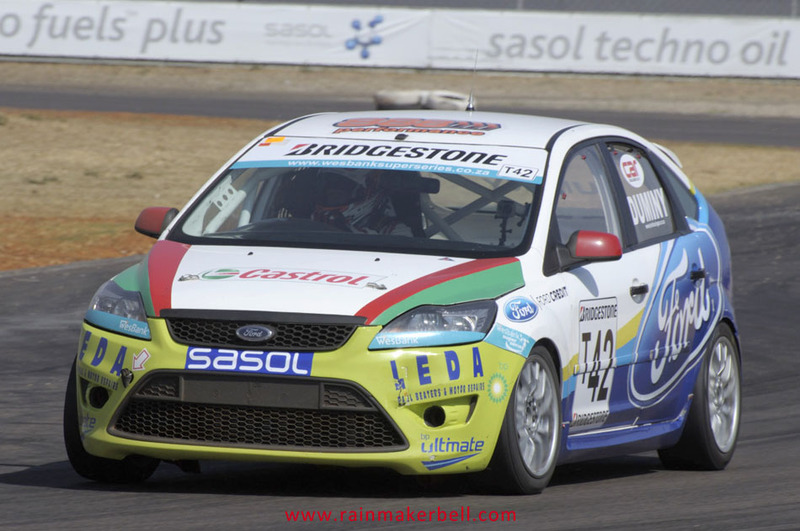 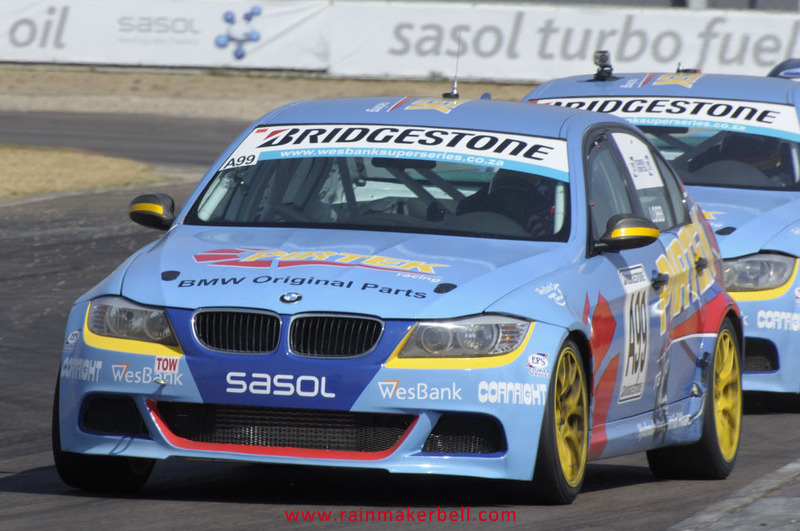 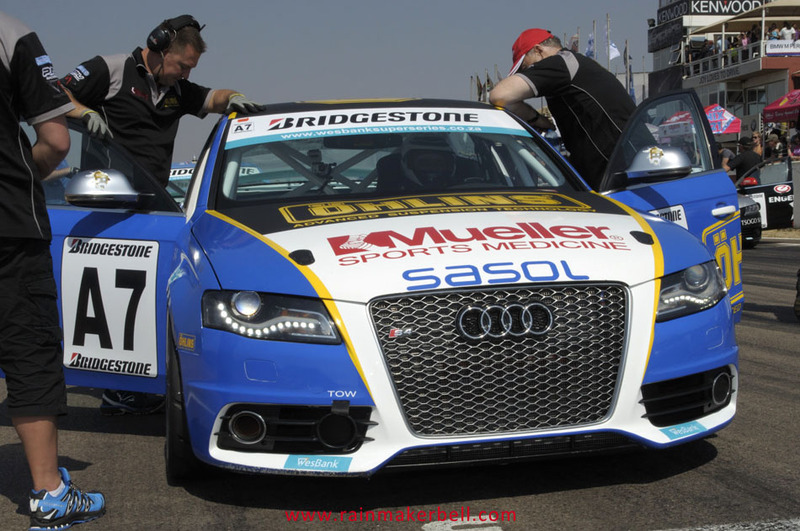 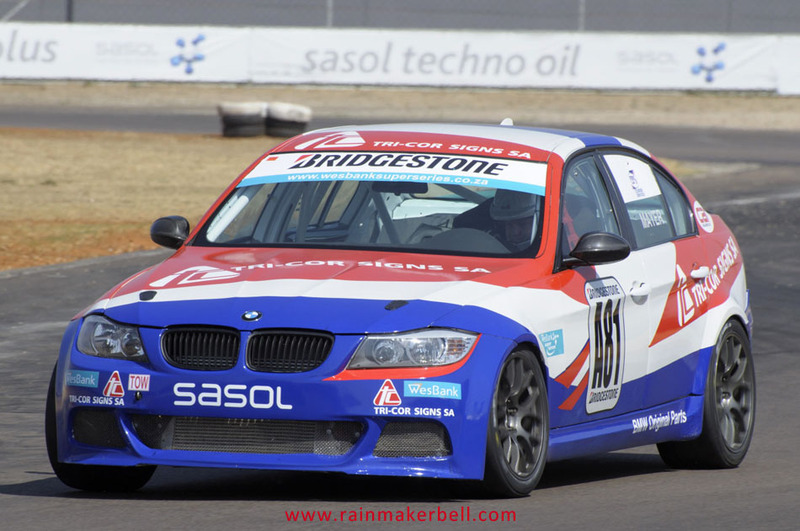 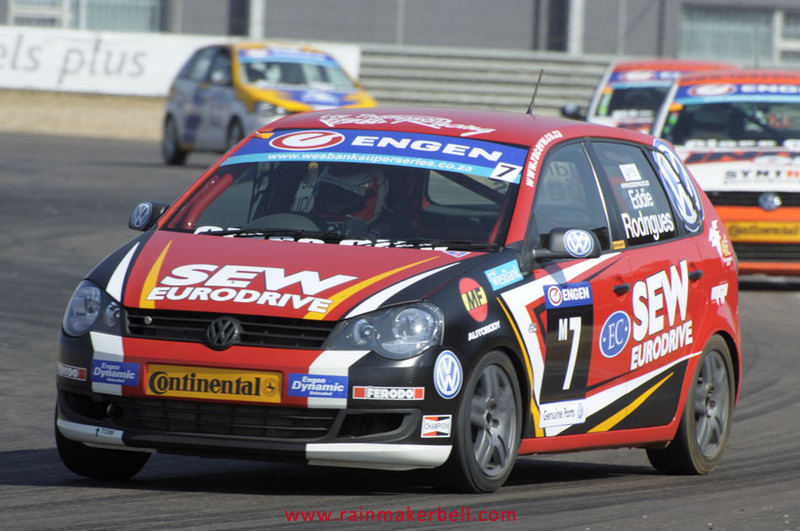 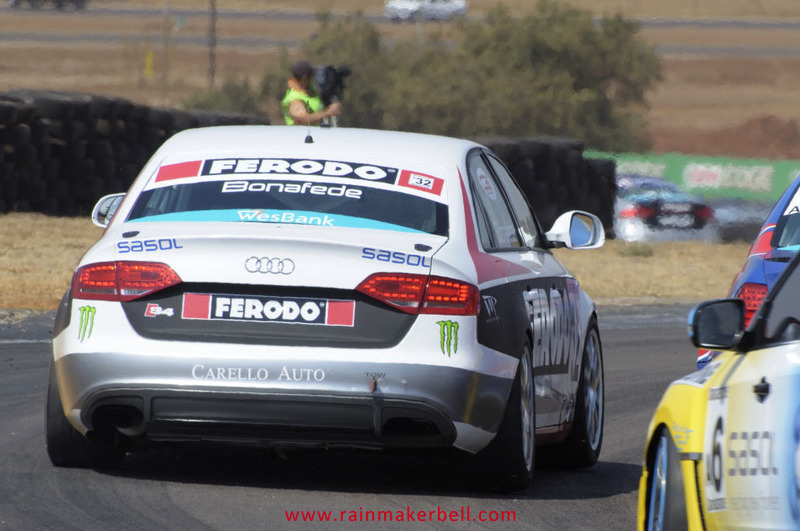 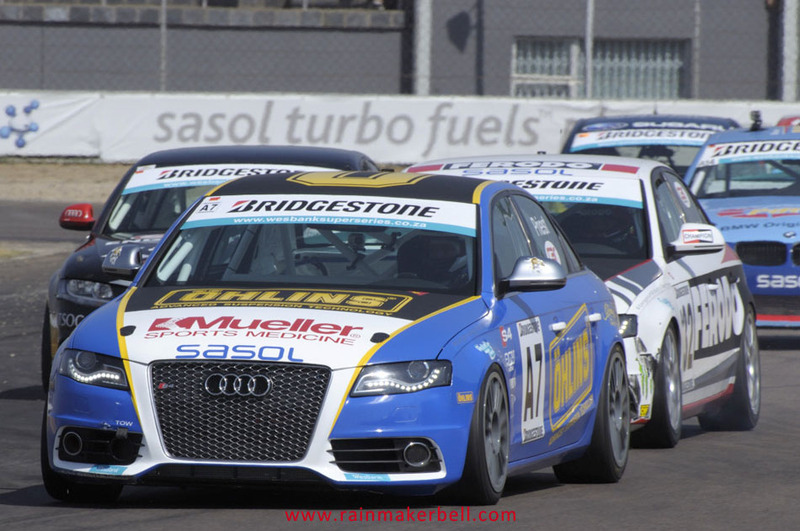 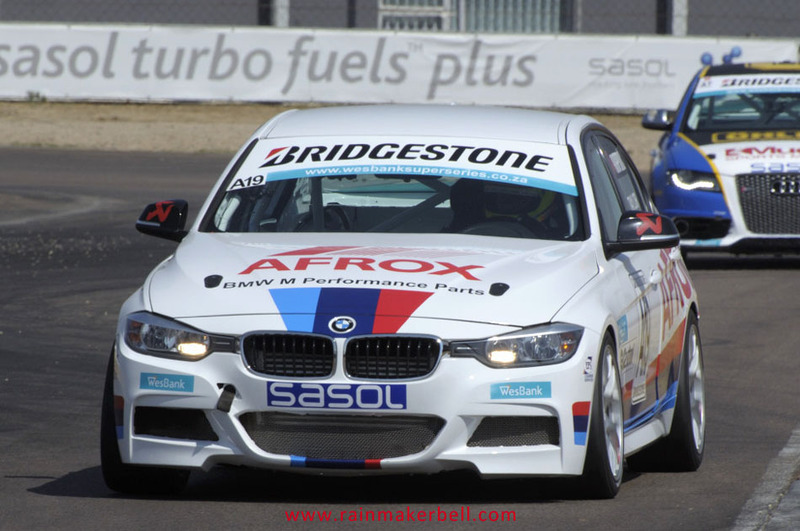 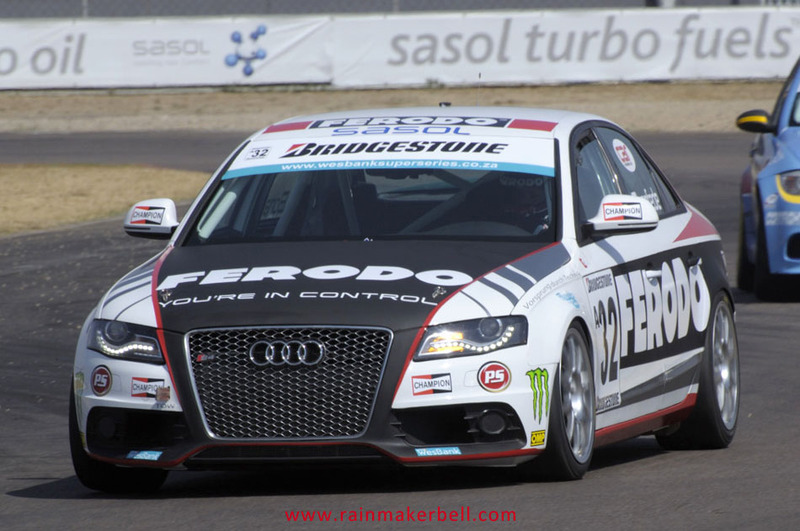 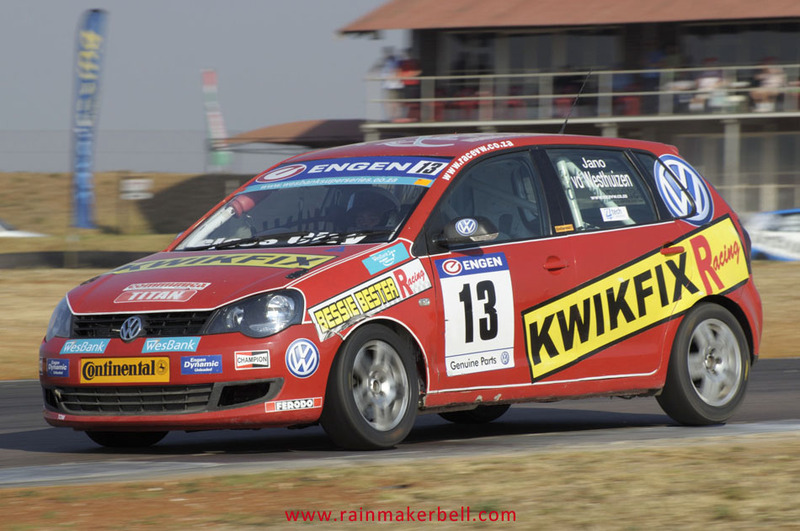 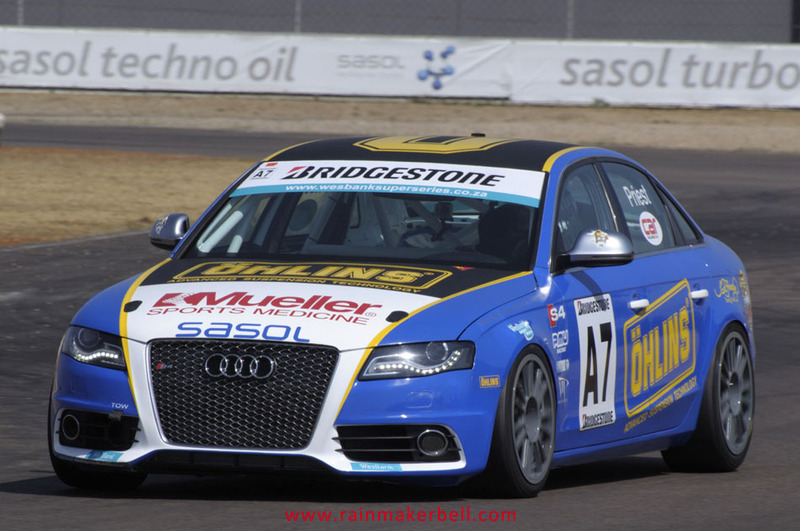 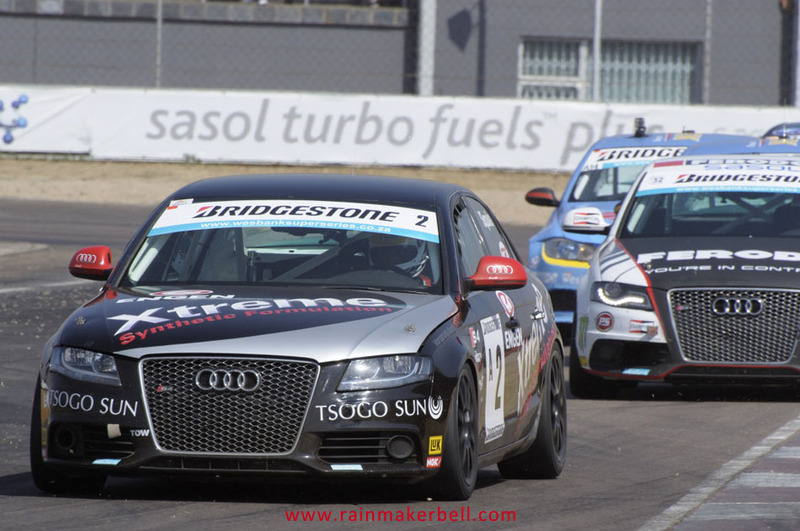 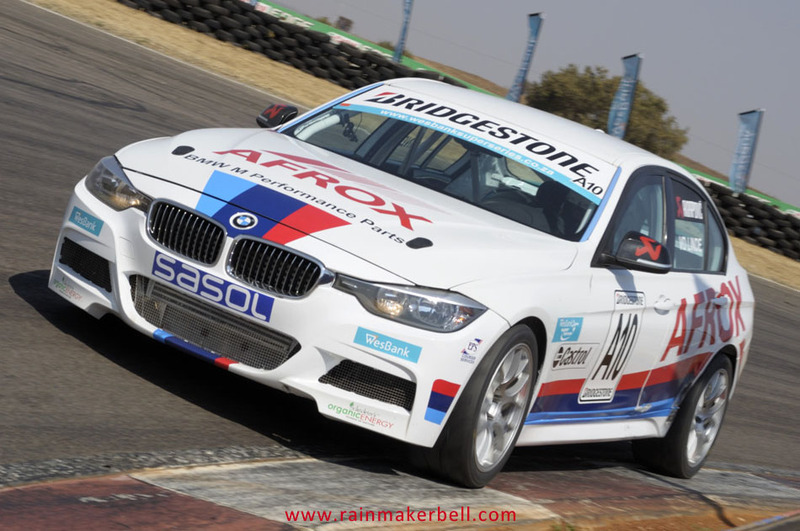 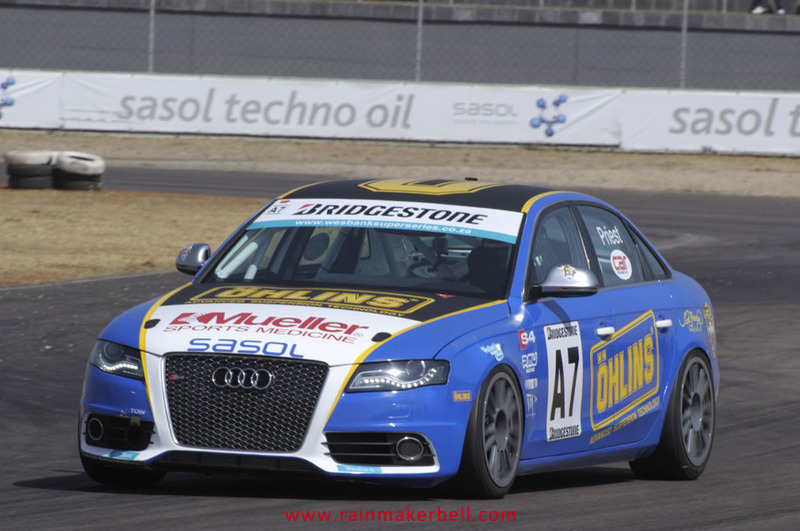 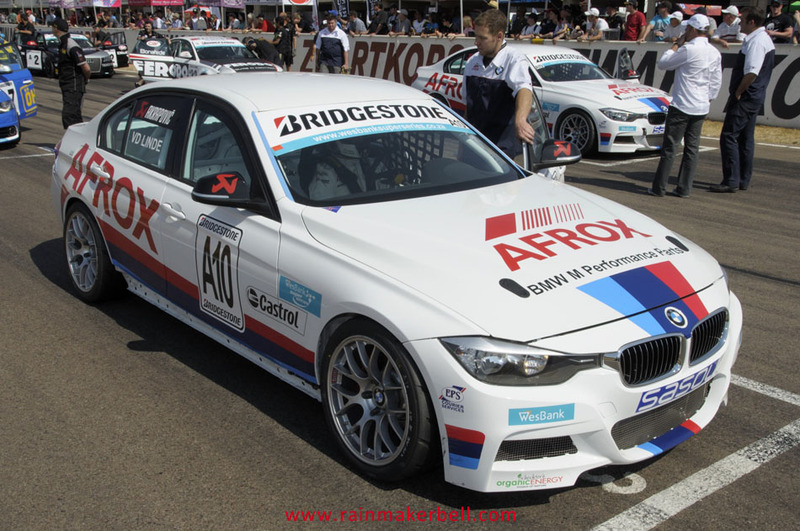 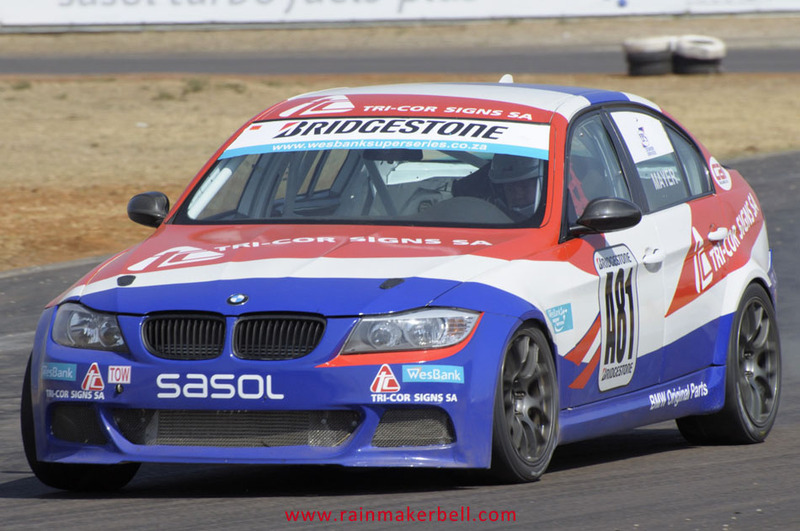 In The Bridgestone Production Cars class Gennaro Bonafede #A32 was now driving Johan Fourie’s Audi S4, while Johan made a dash for a BMW 335i. 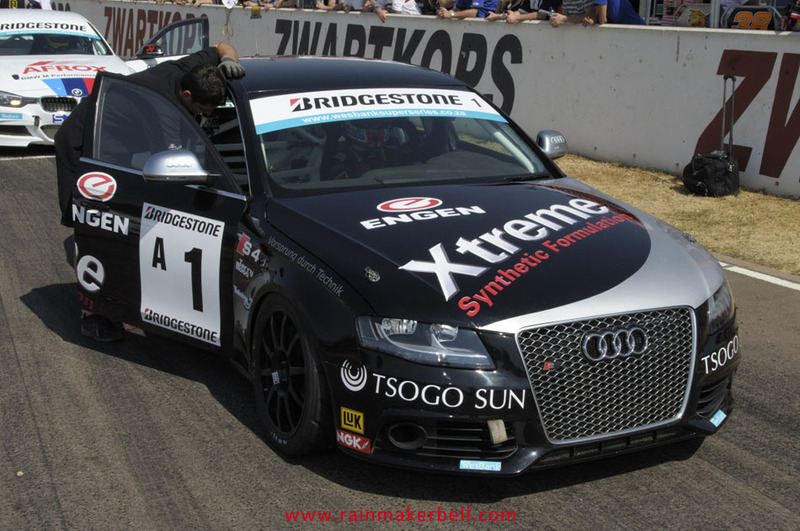 I can just imagine how the die-hard Audi- and Johan Fourie supporters must feel. 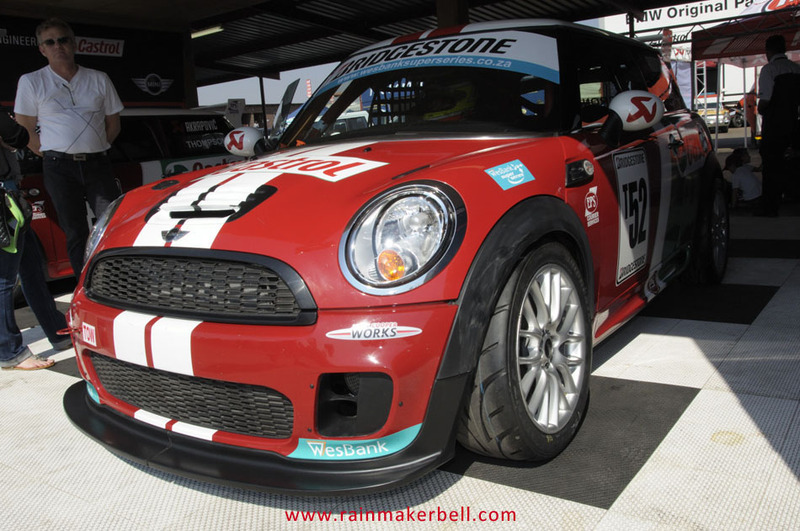 At the front of the main pit complex the noses of the red Minis were stealing all the attention. 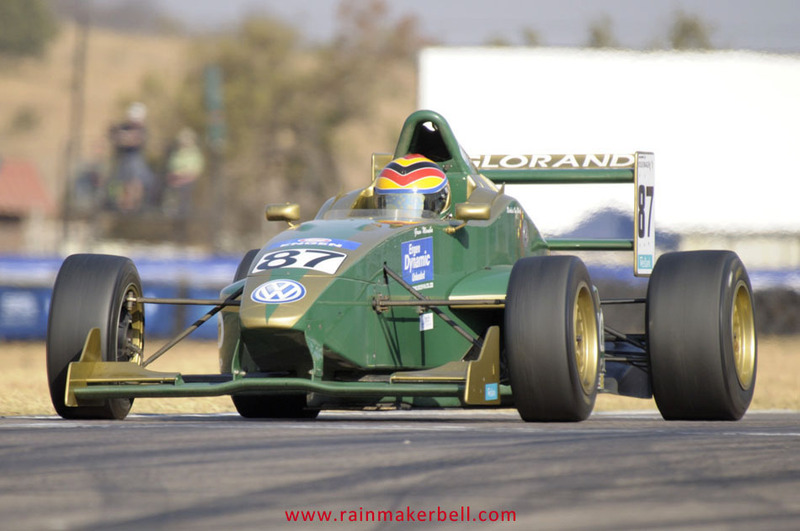 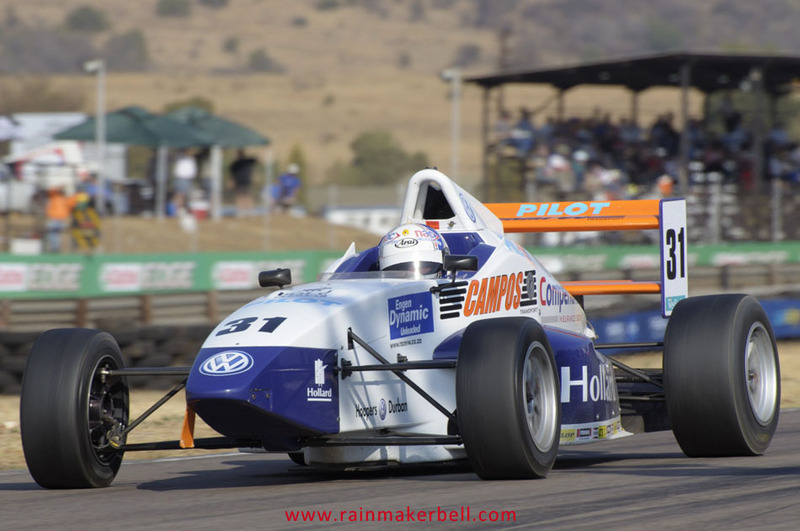 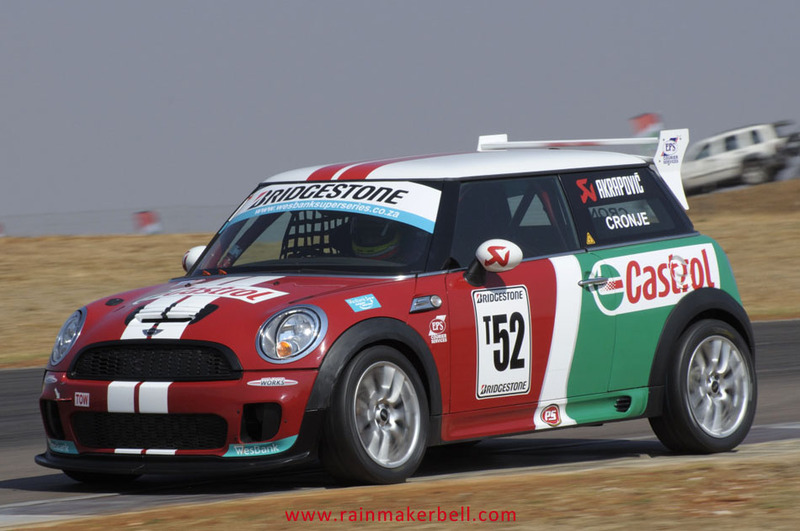 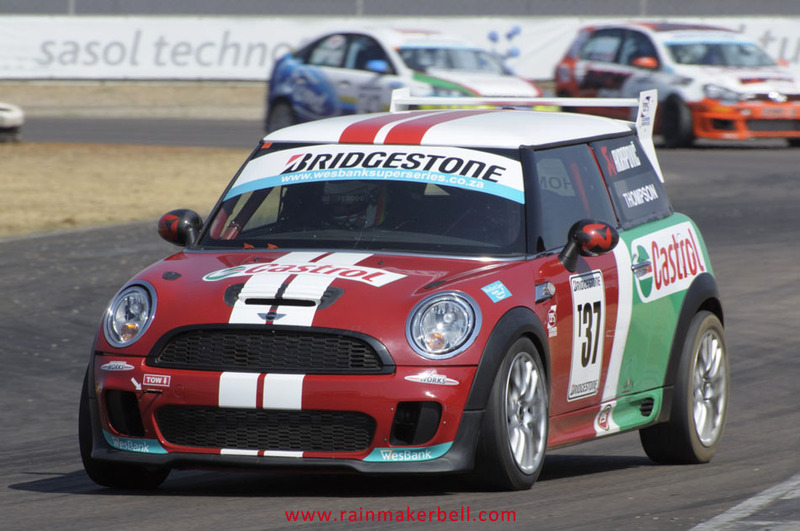 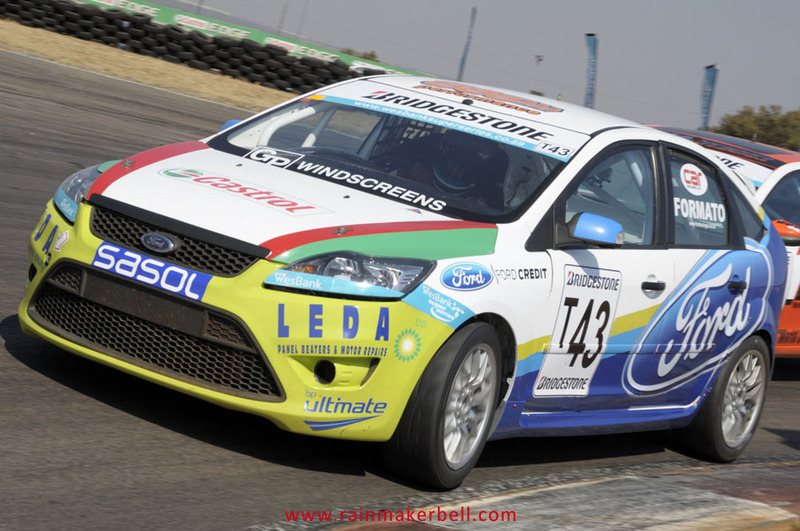 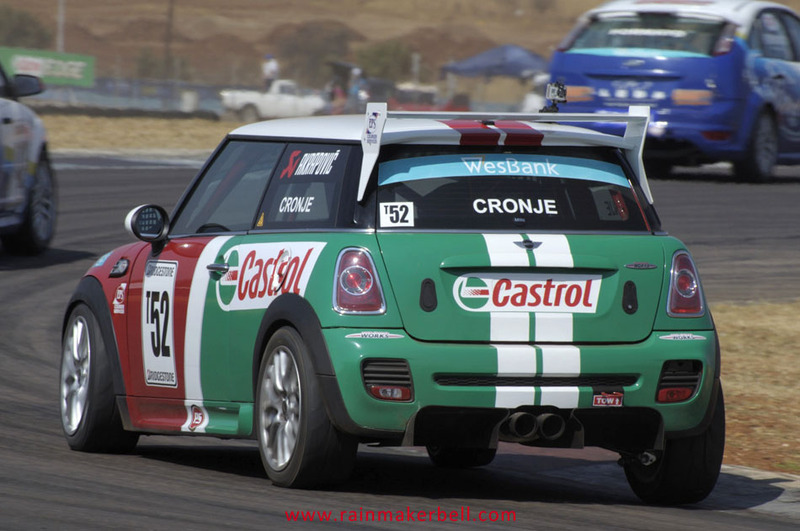 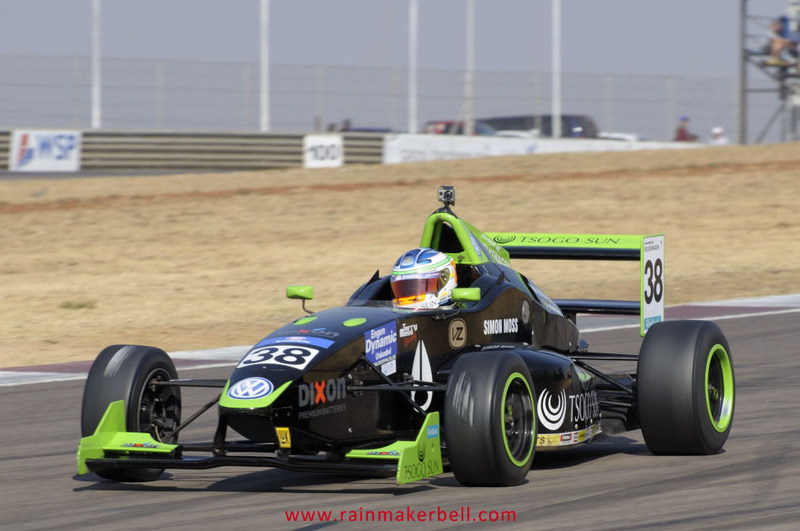 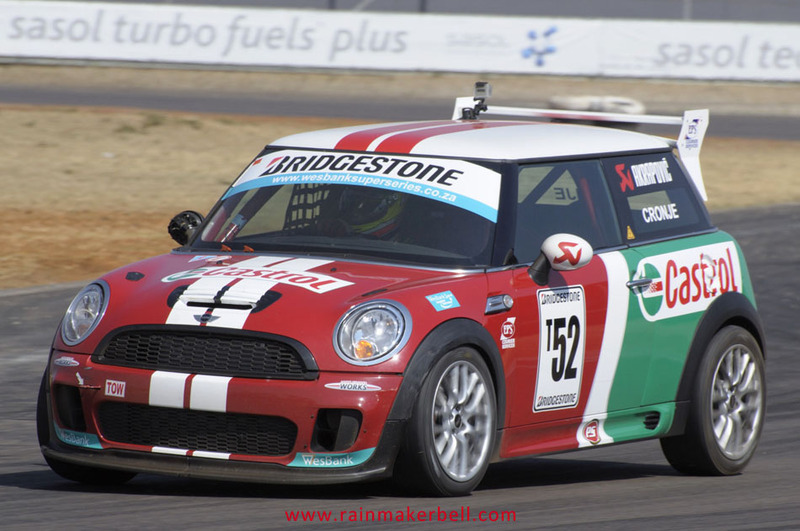 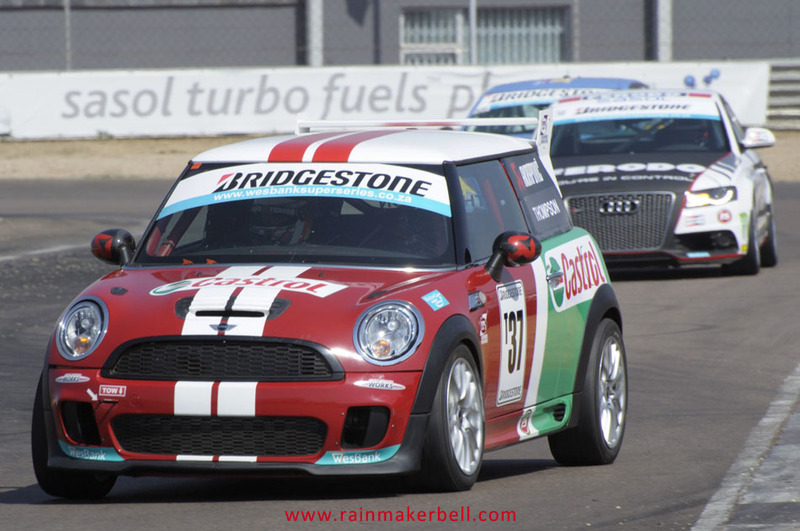 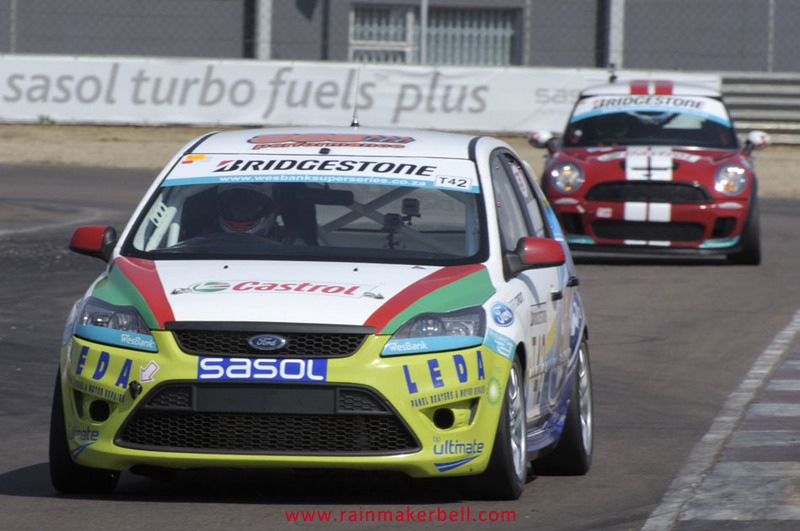 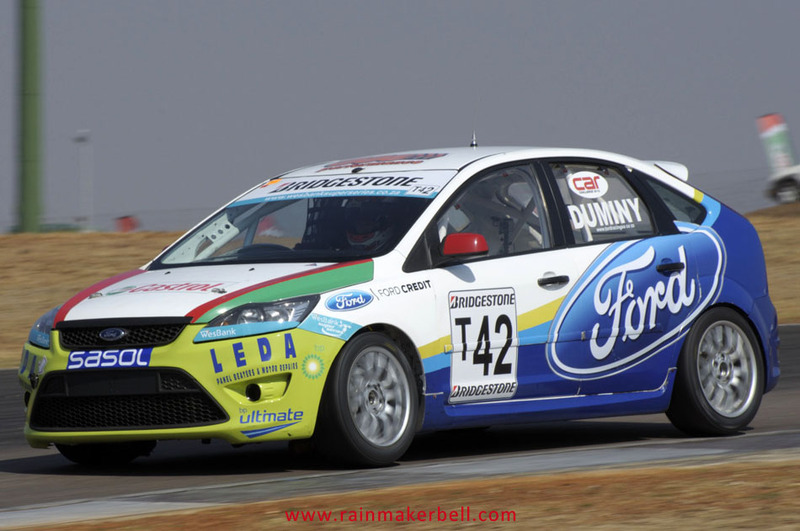 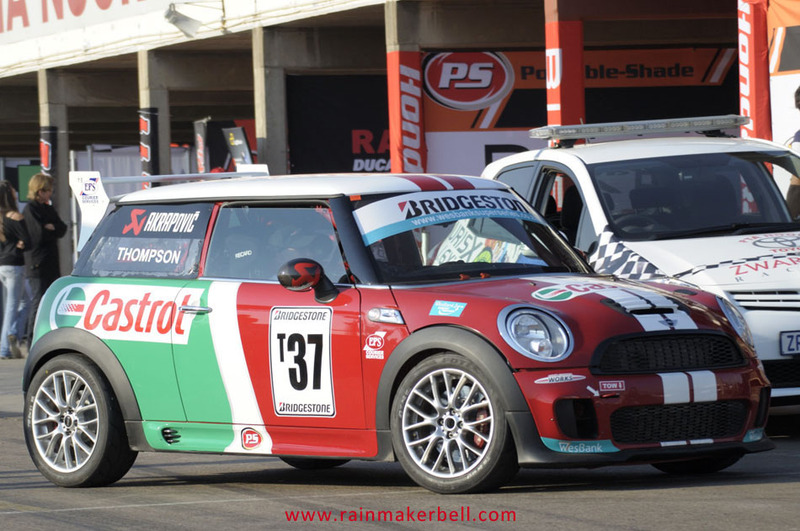 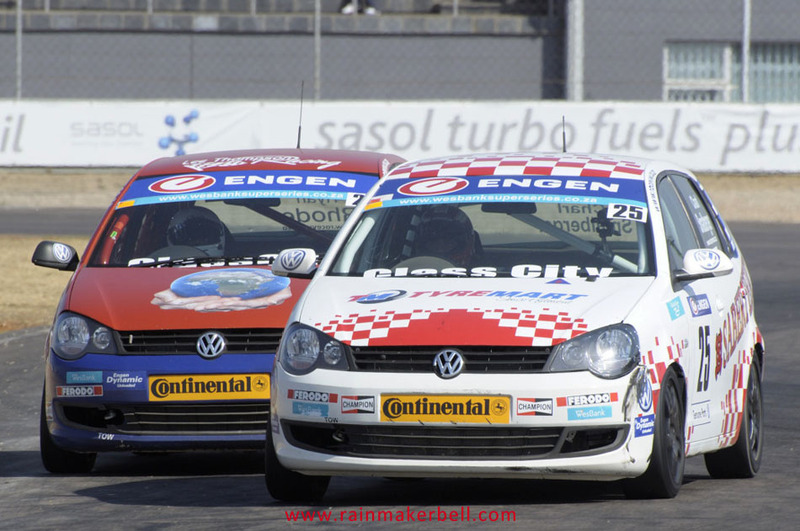 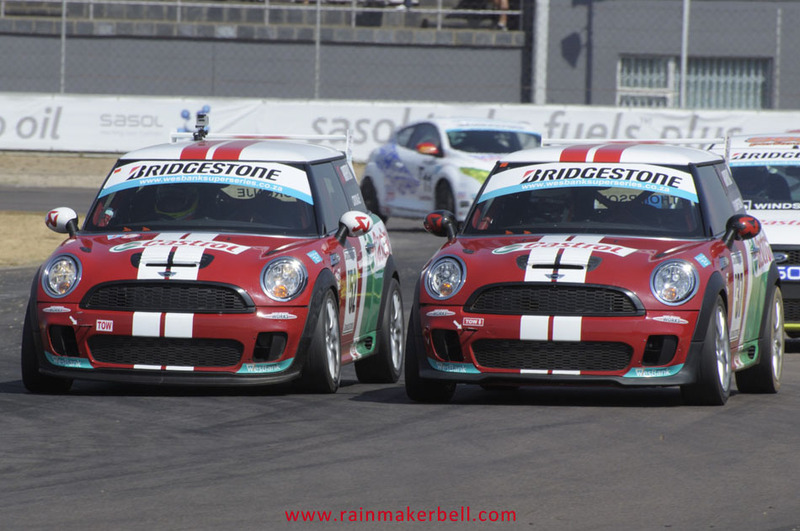 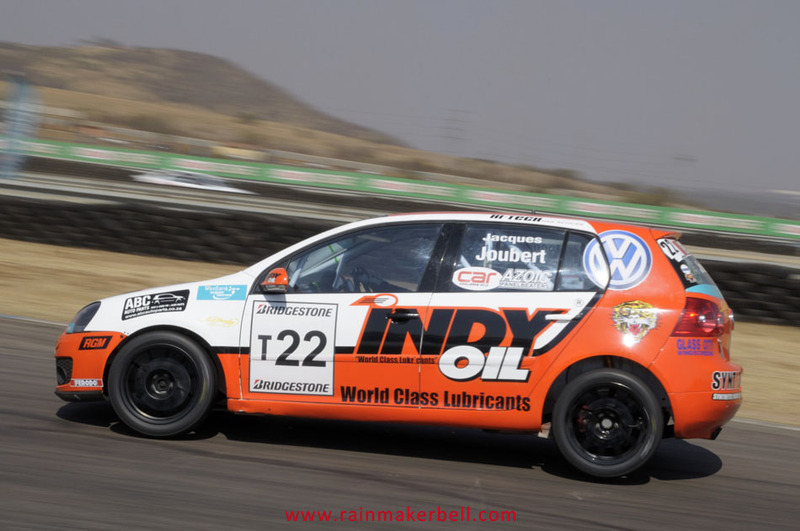 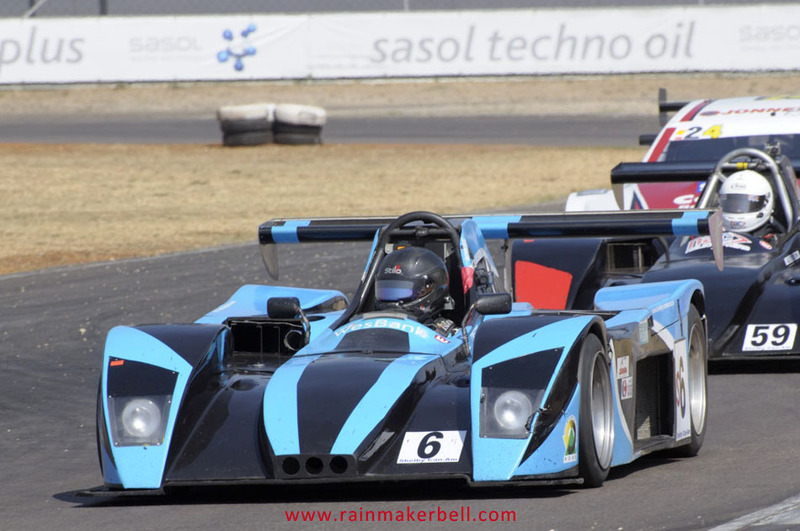 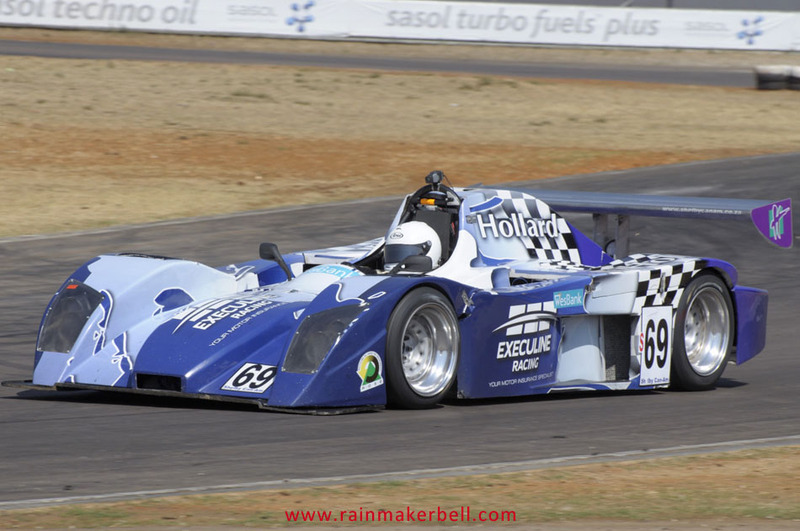 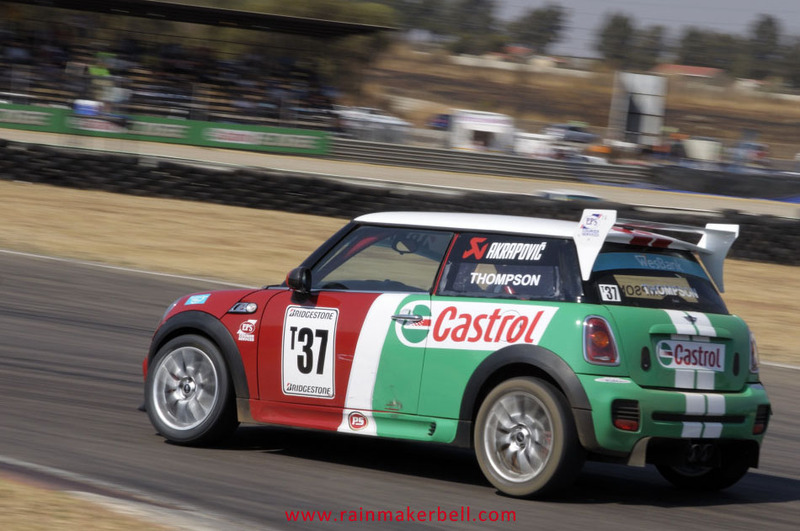 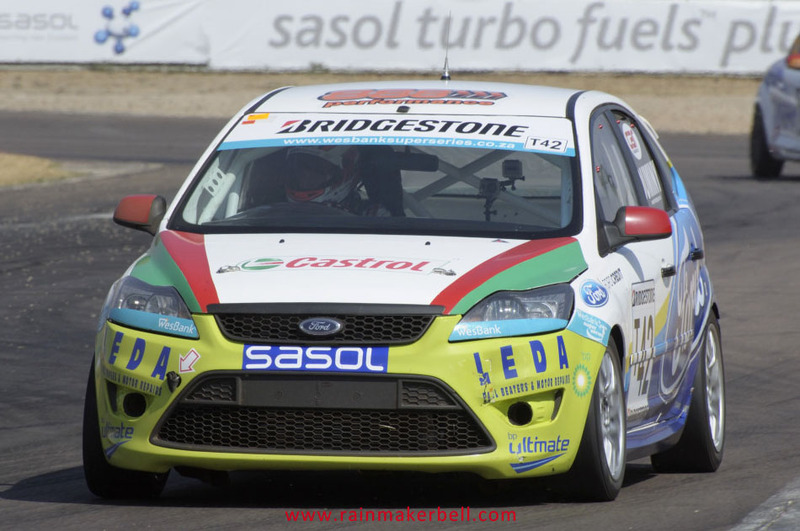 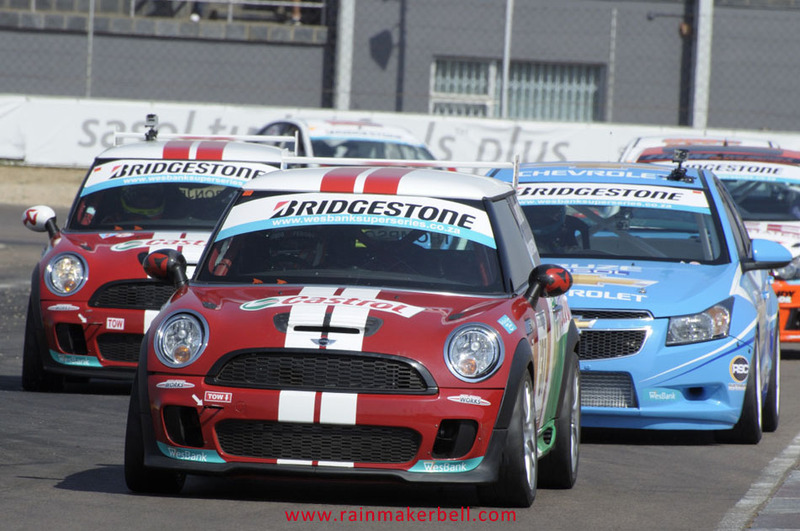 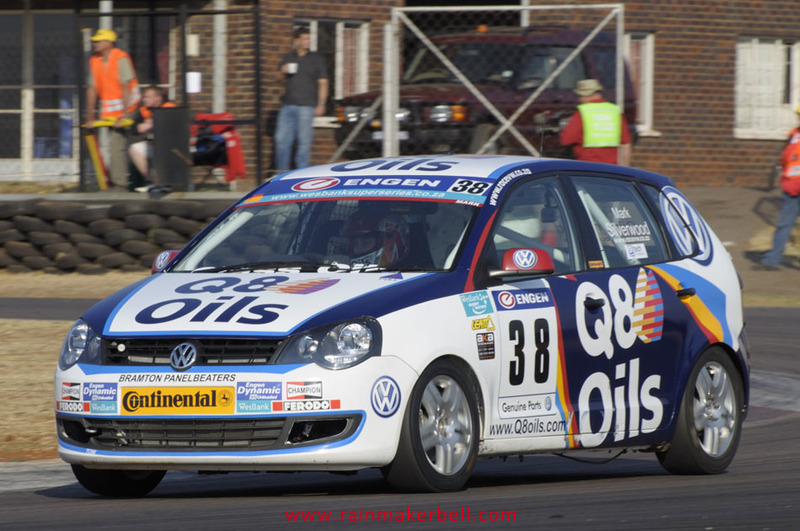 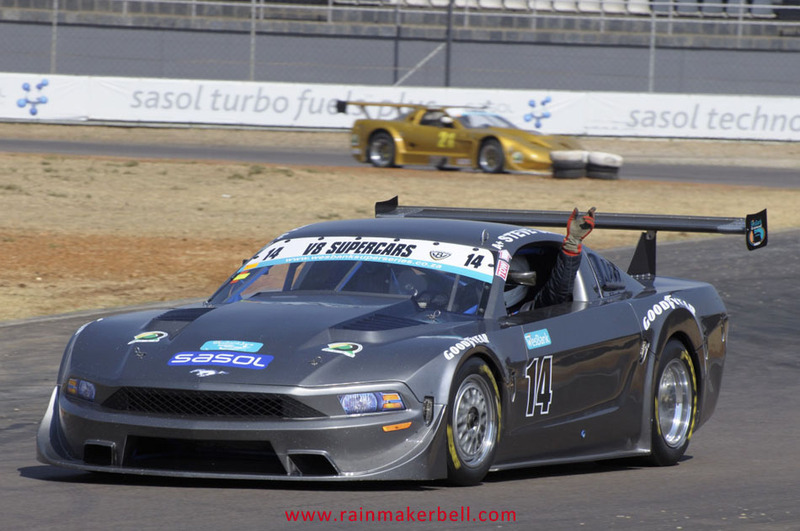 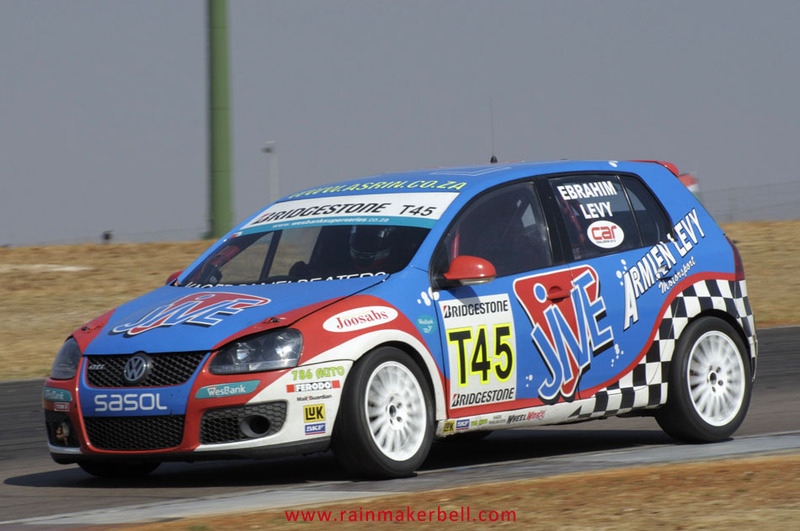 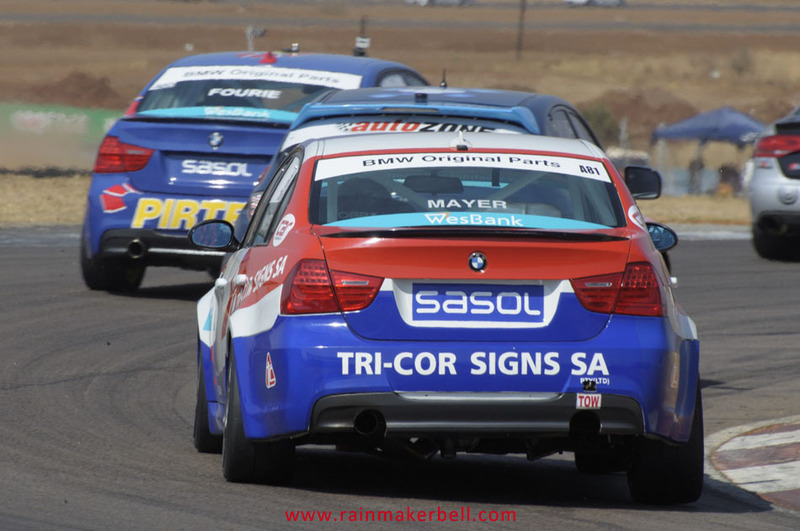 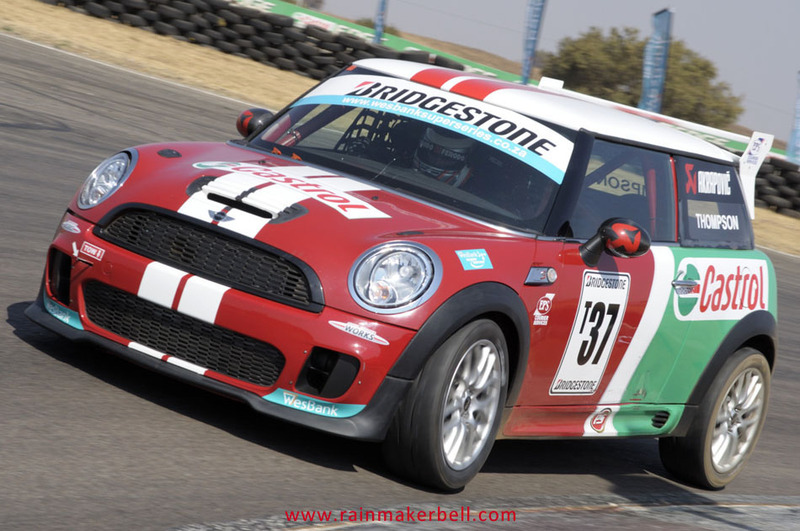 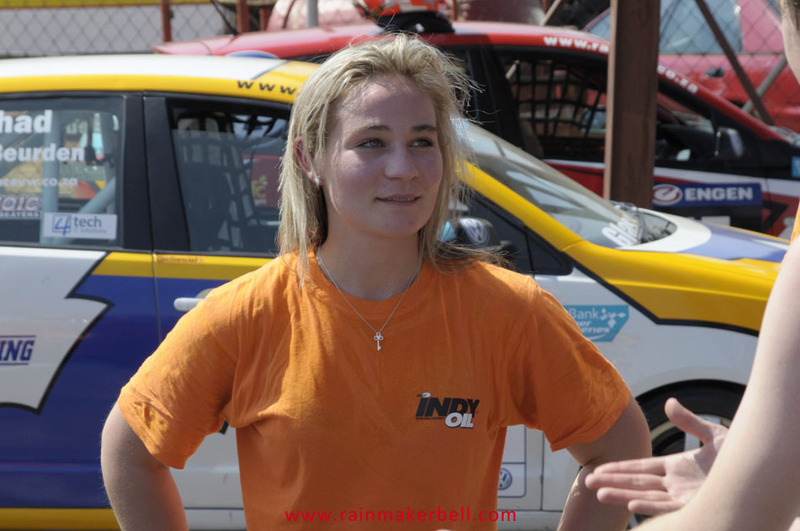 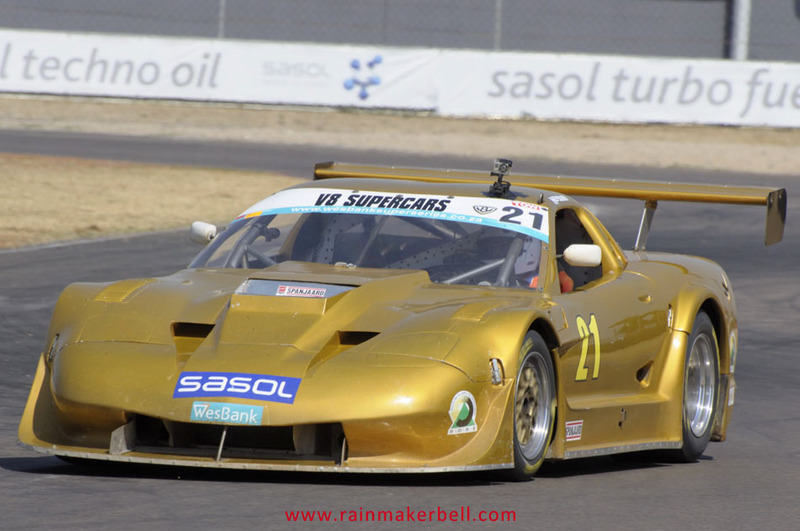 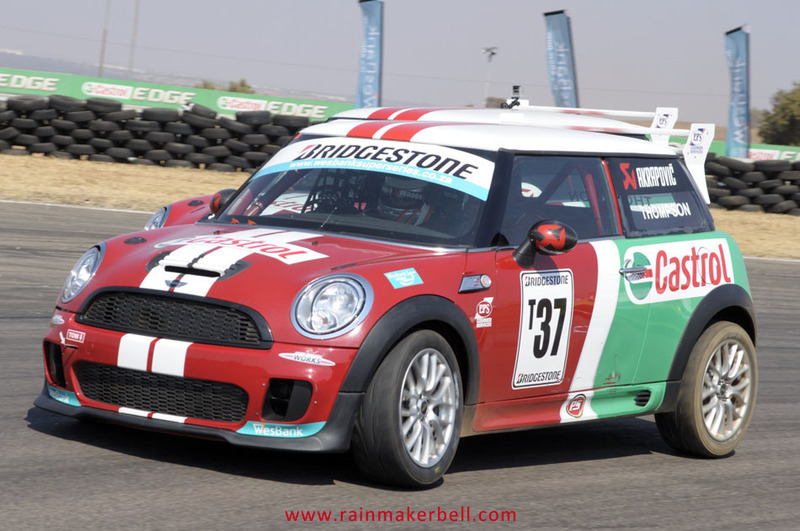 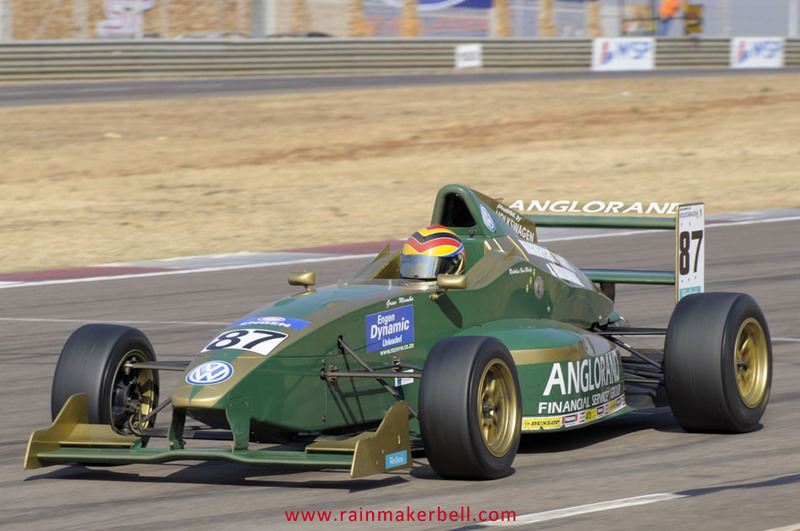 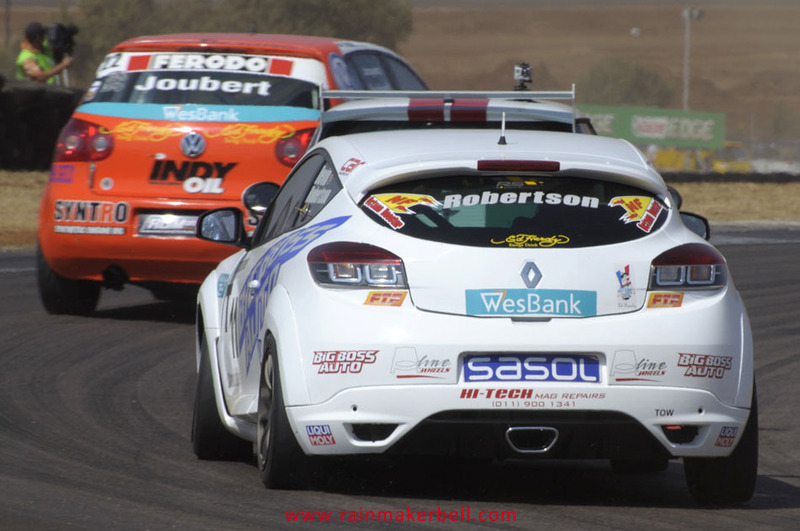 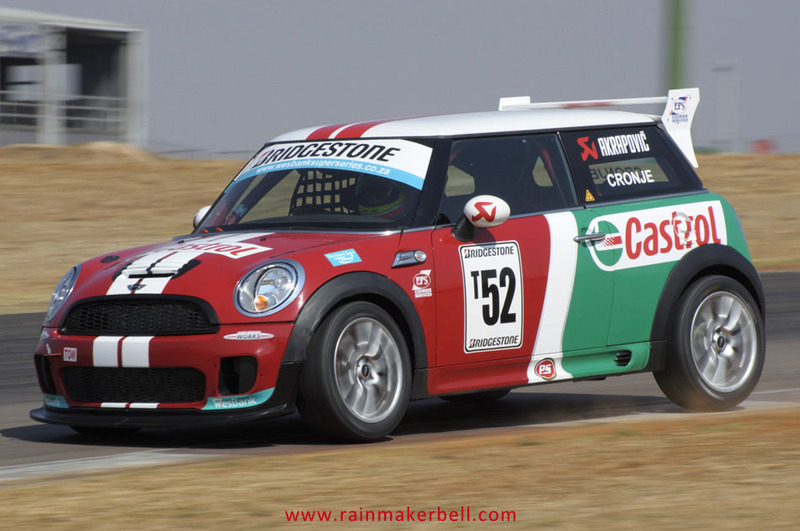 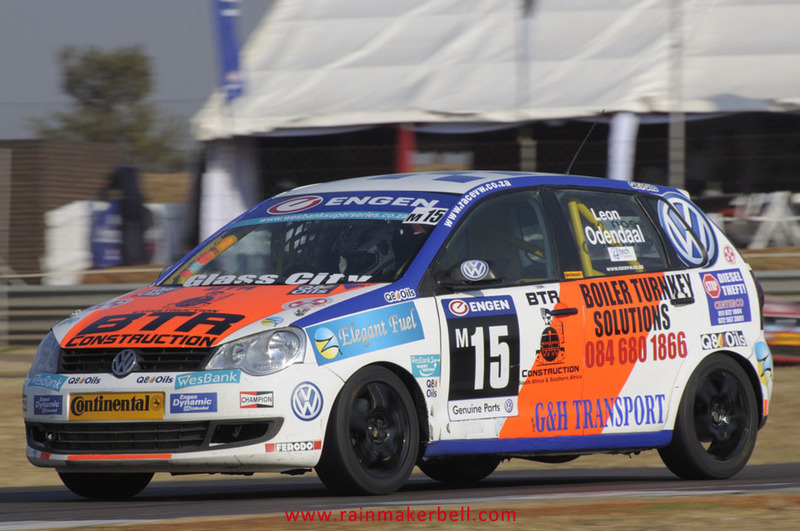 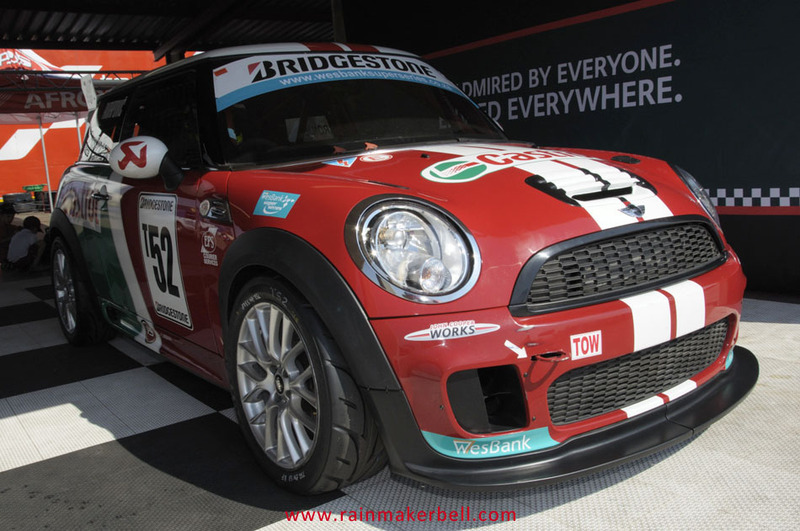 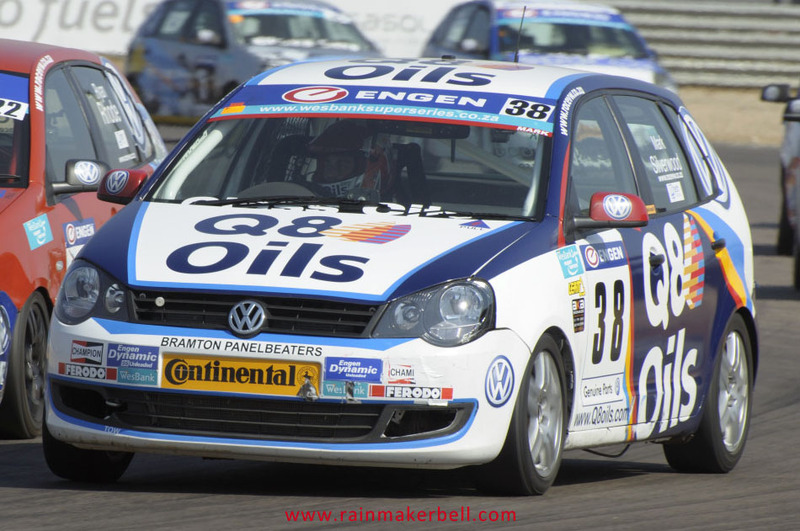 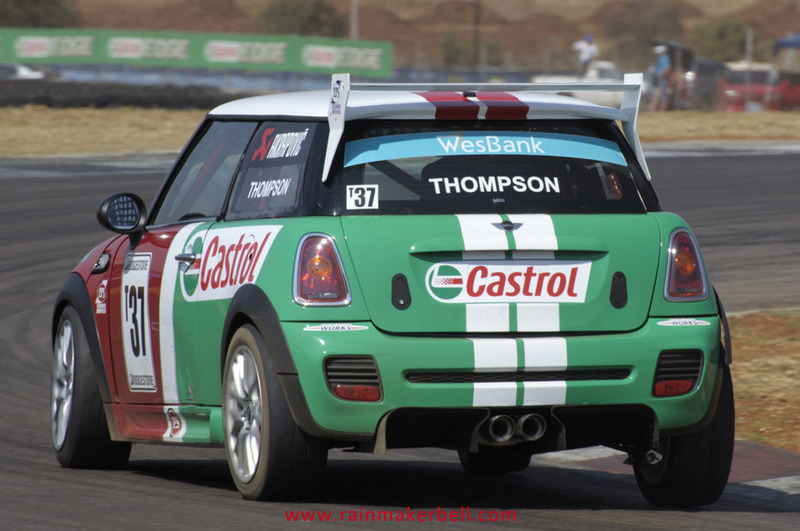 Lee Thompson #T37 and Gavin Cronje #T52 would be causing a stir once these Cooper S Castrol babies (e.g. 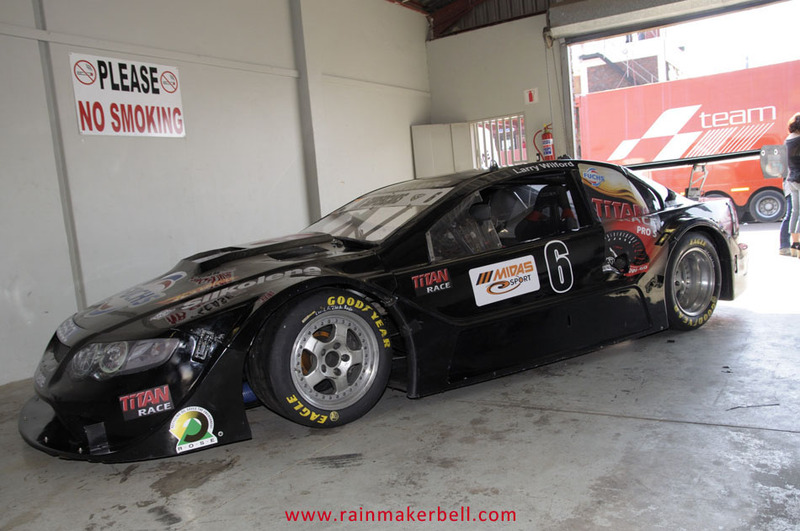 hot wheels) hit the tarmac. 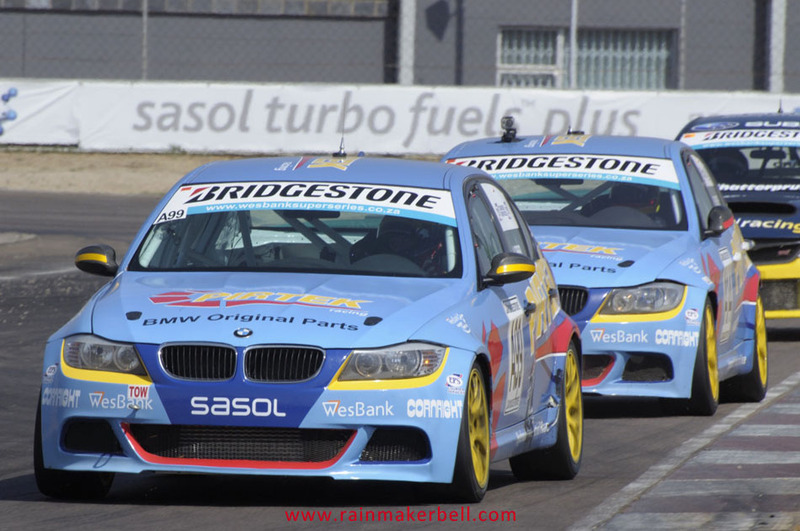 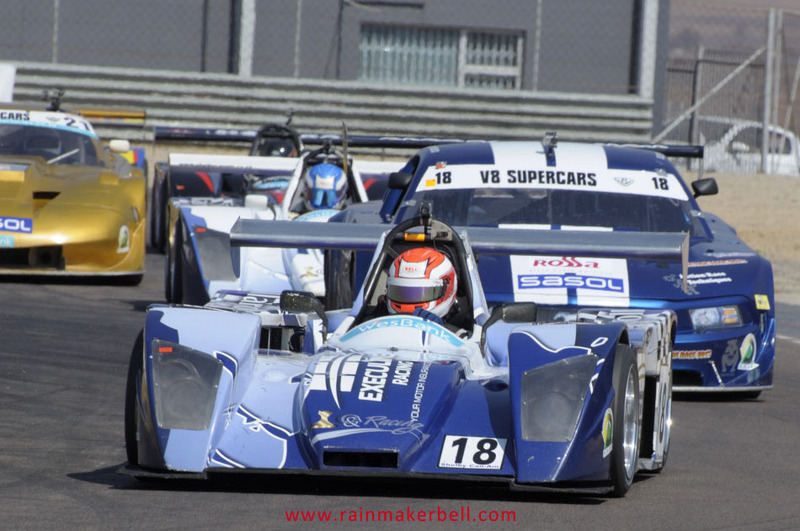 The Bridgestone Production Car races went down like pudding after a Sunday lunch. 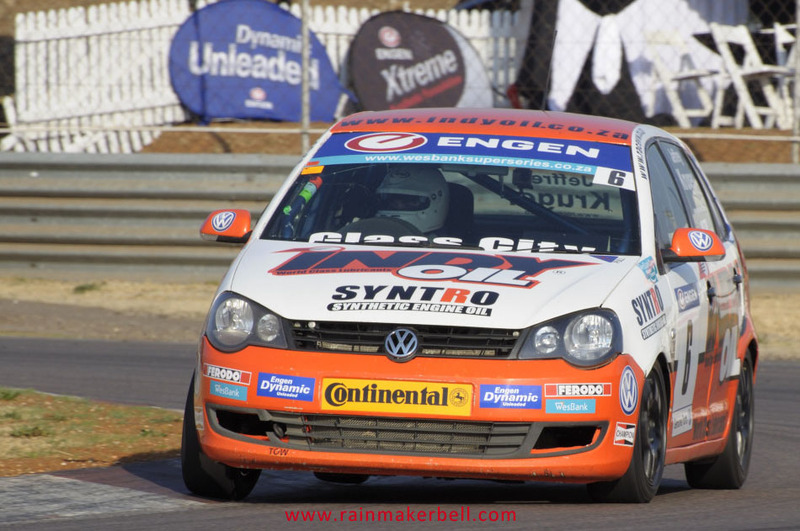 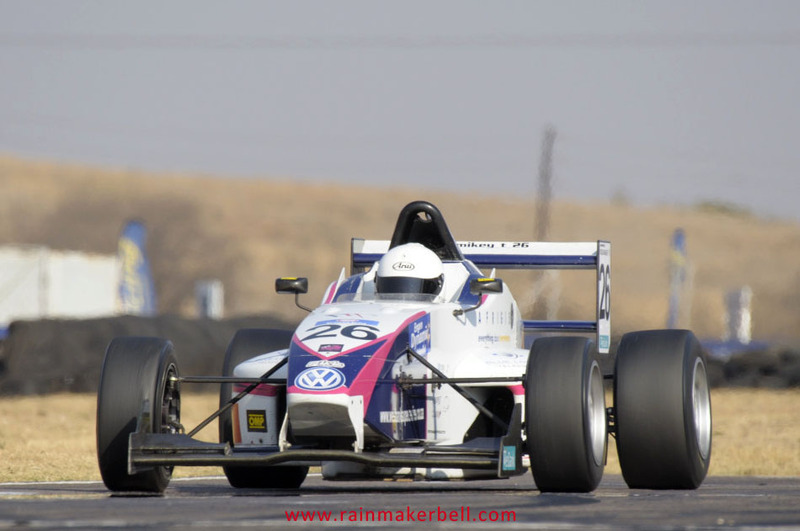 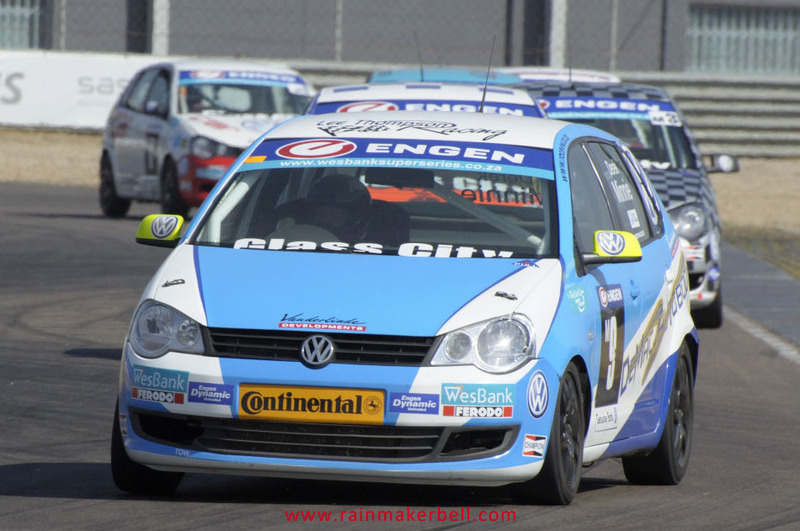 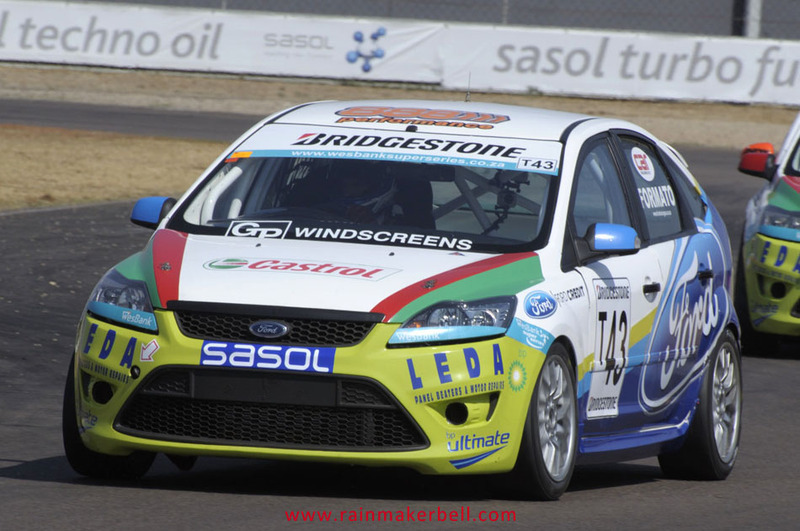 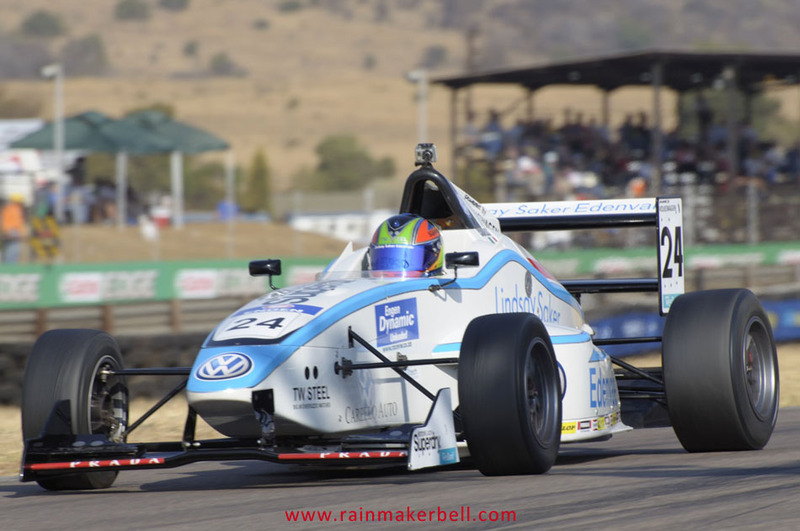 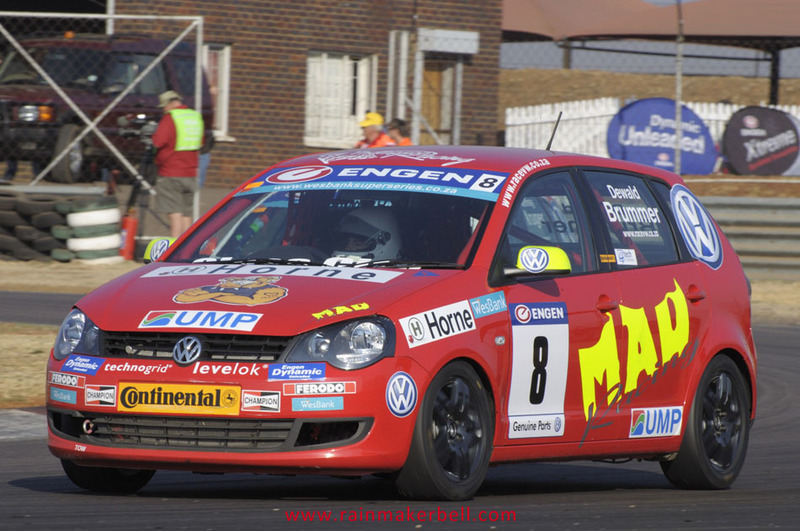 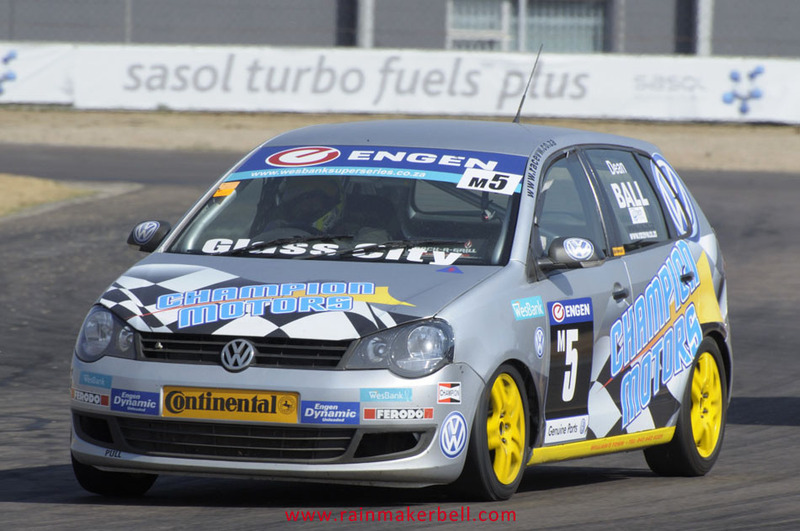 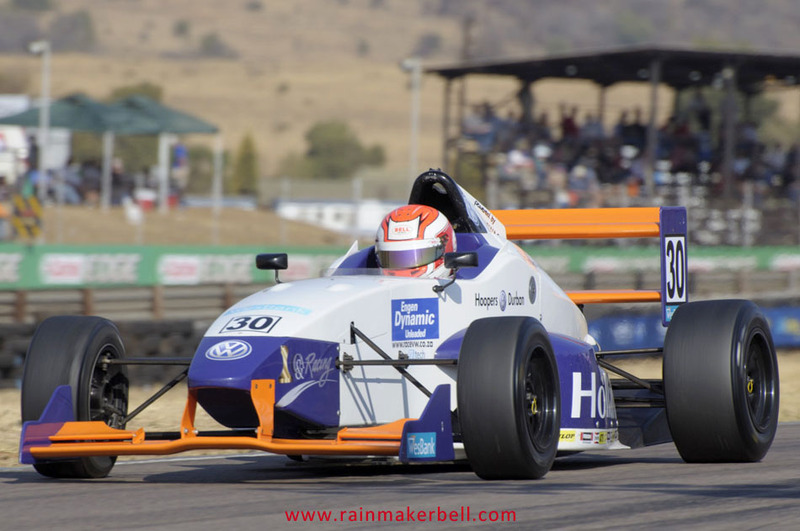 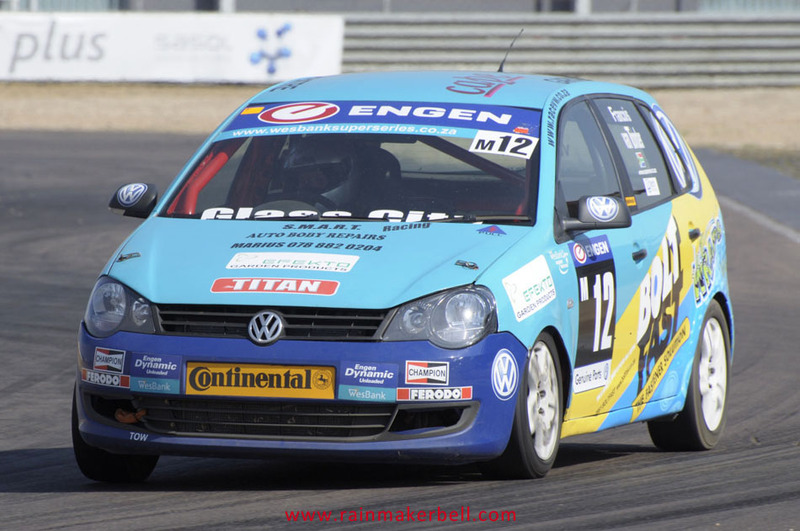 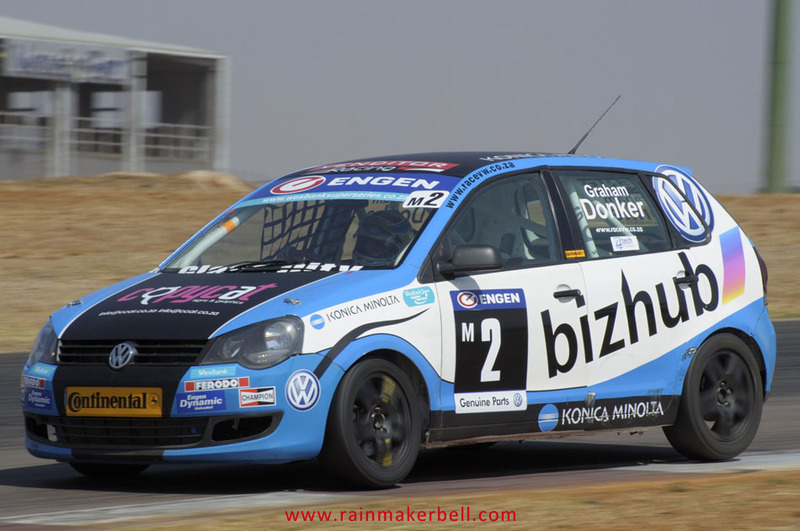 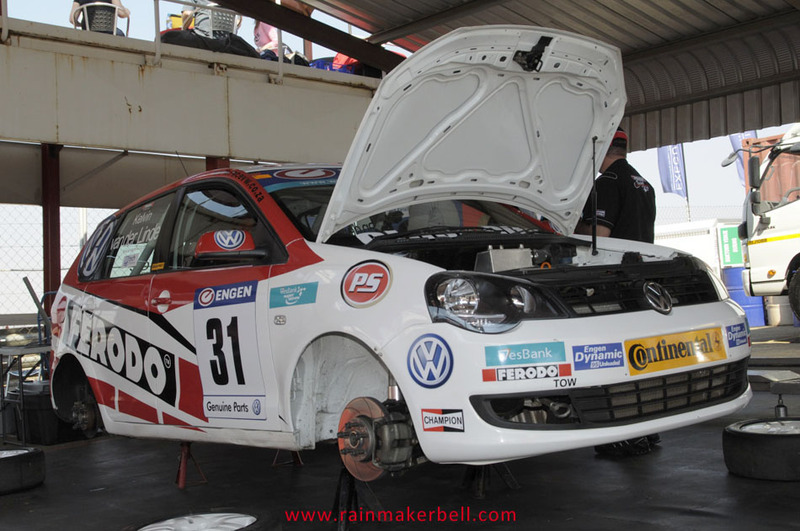 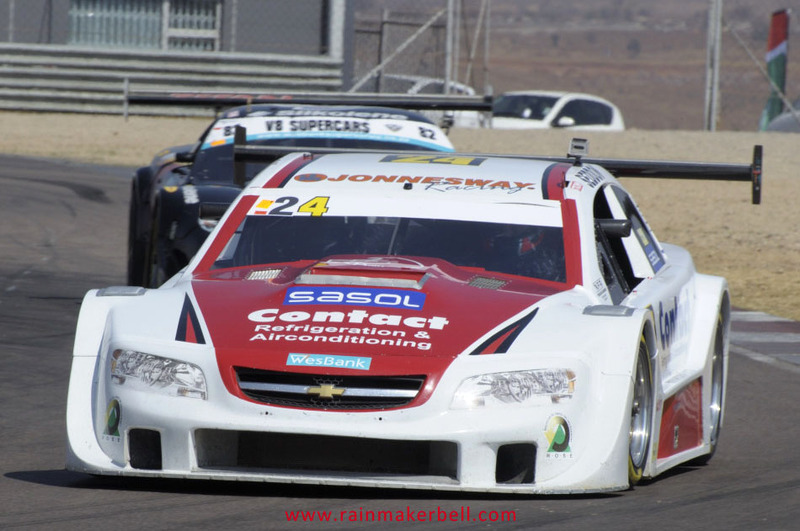 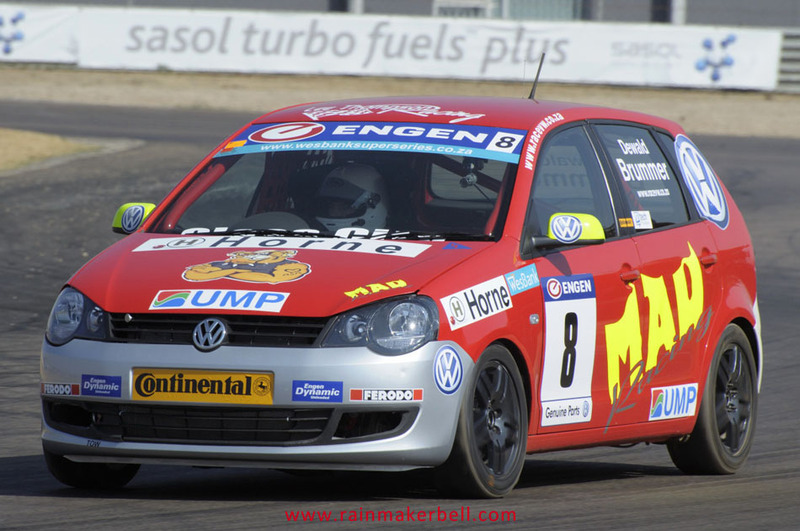 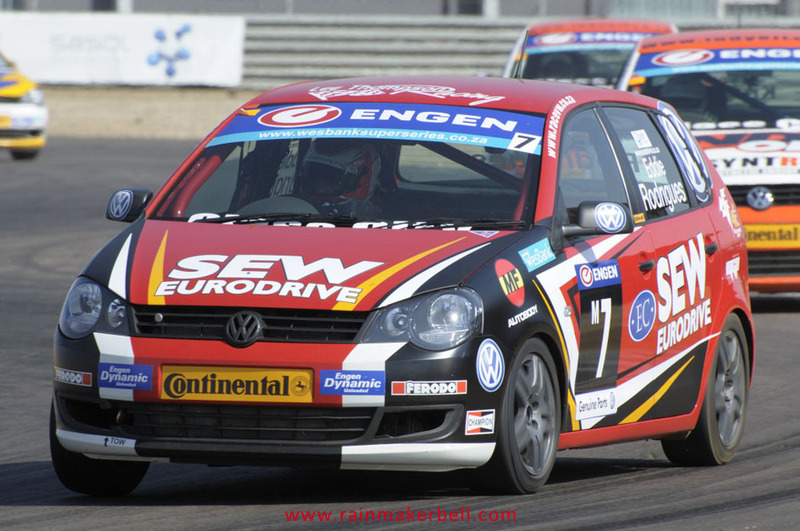 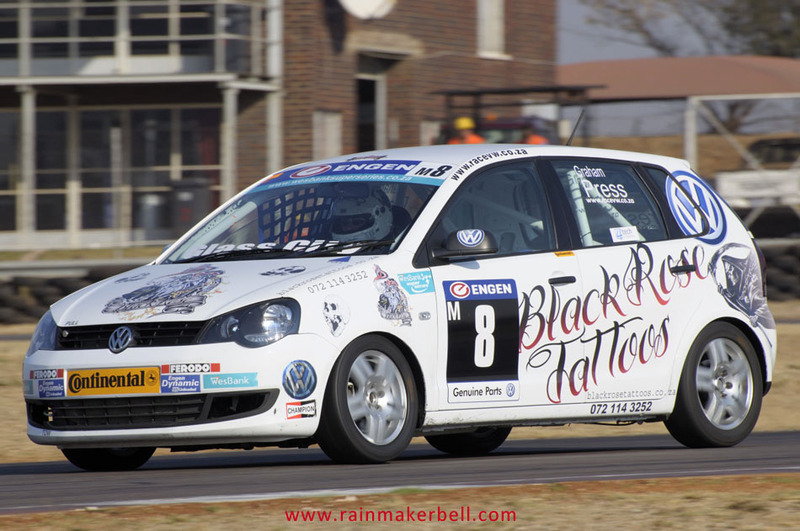 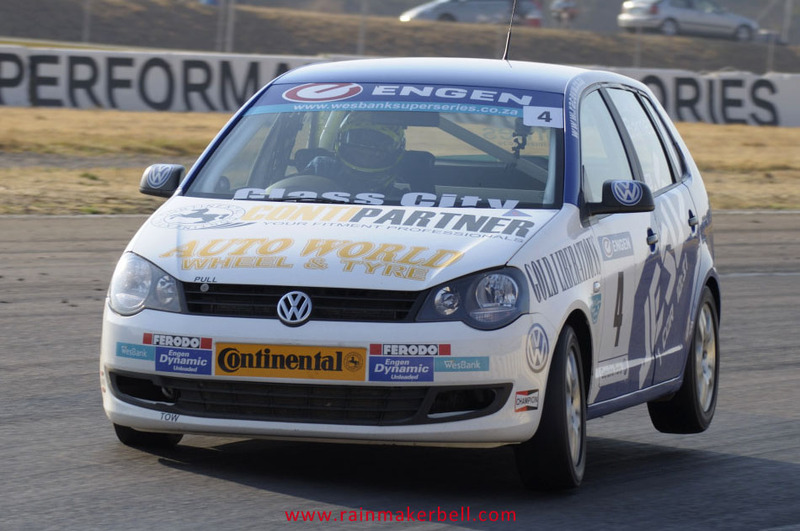 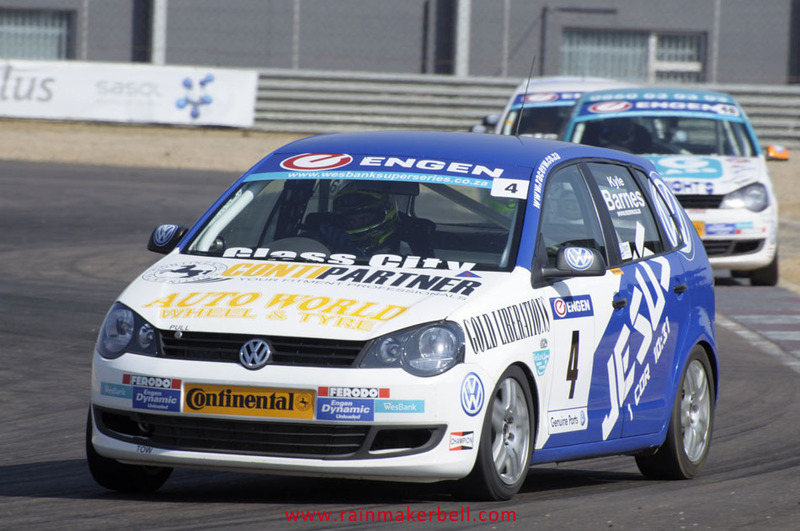 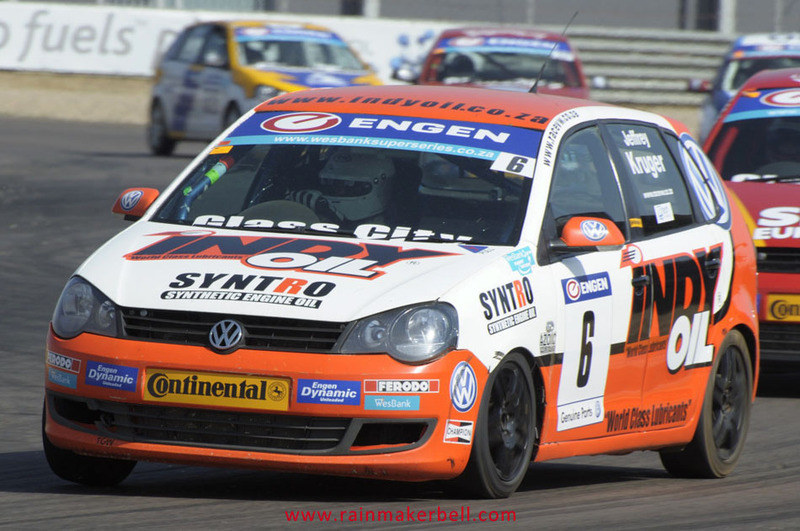 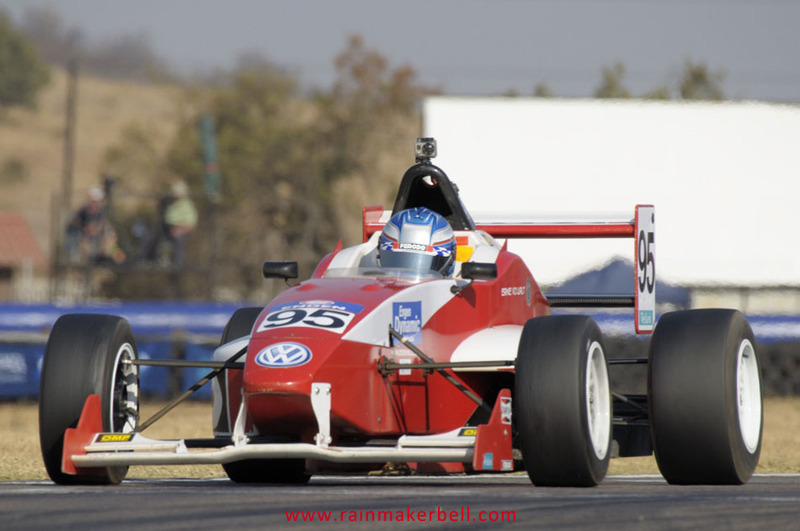 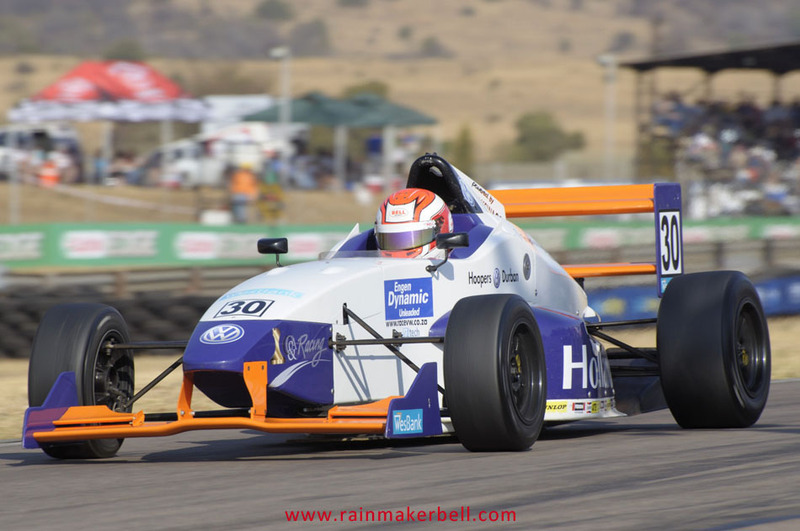 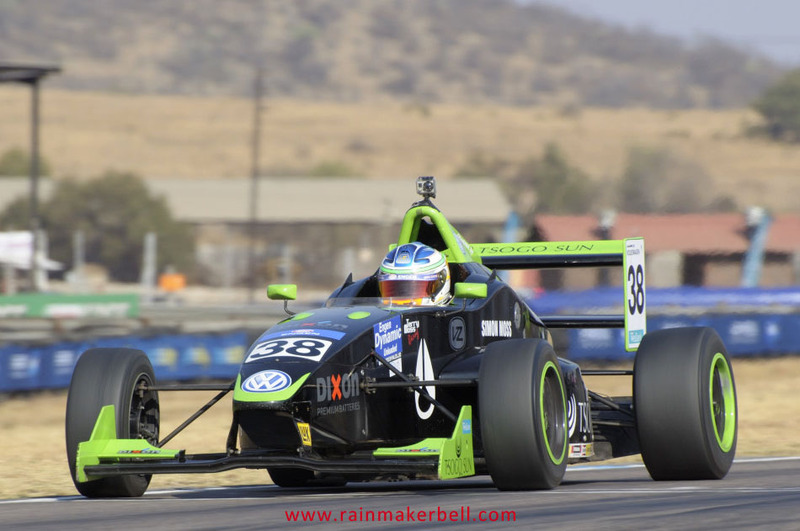 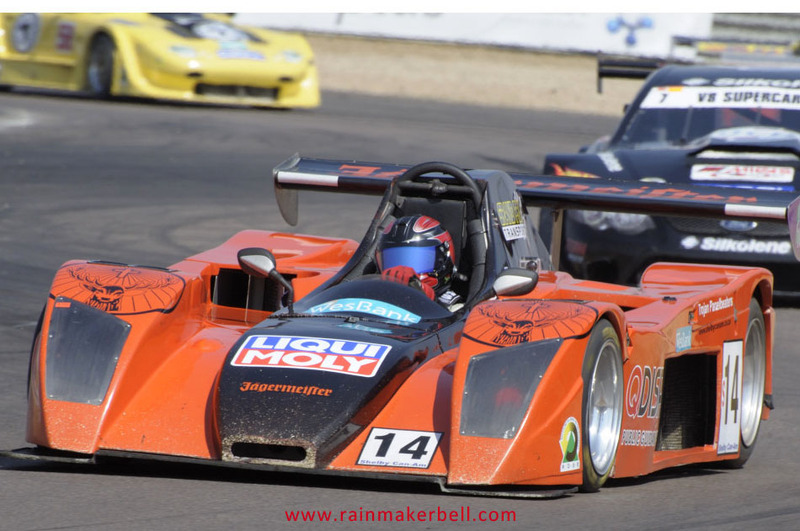 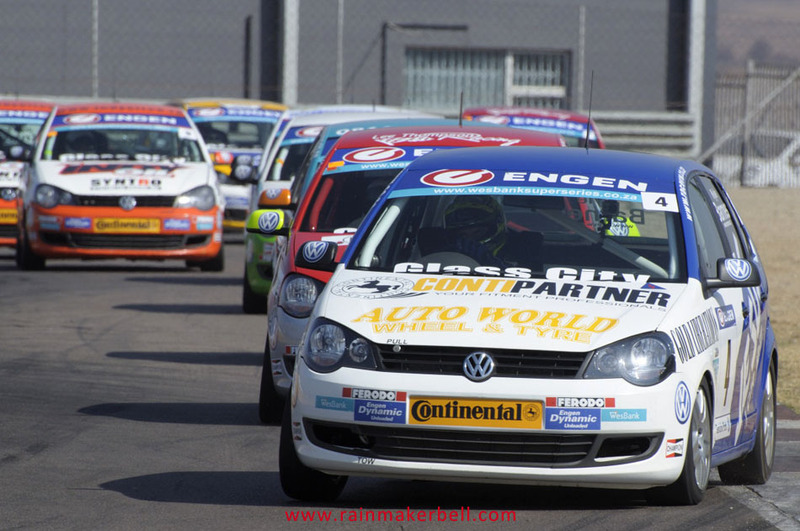 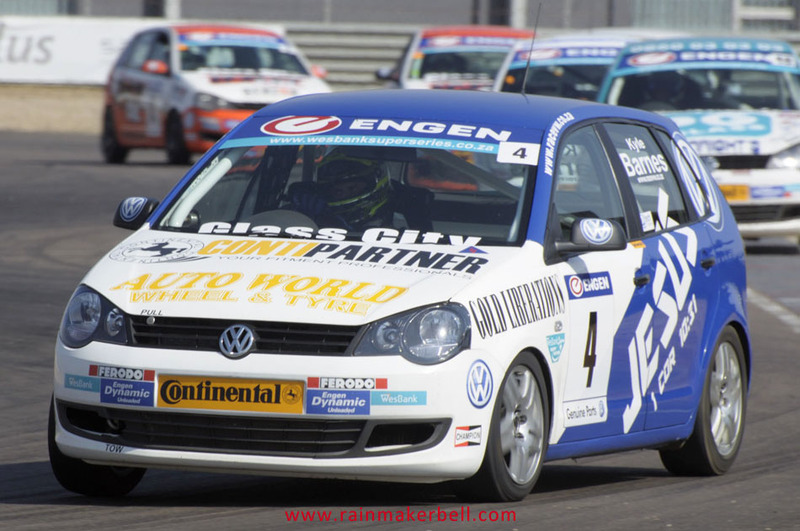 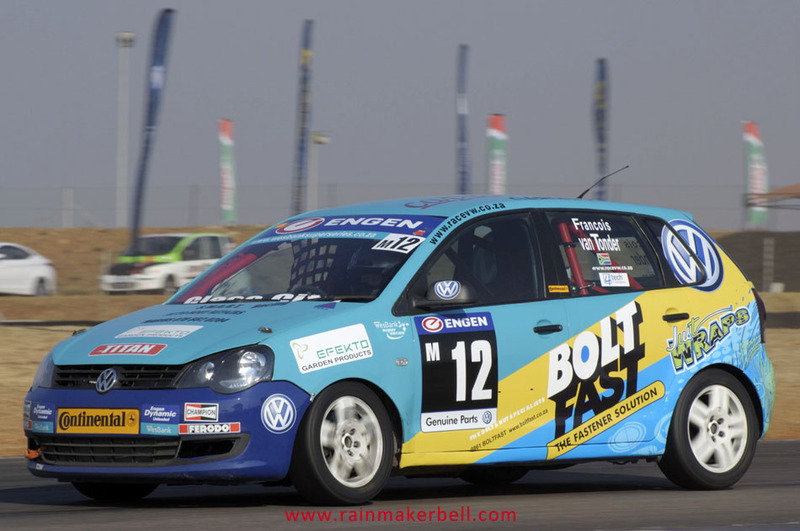 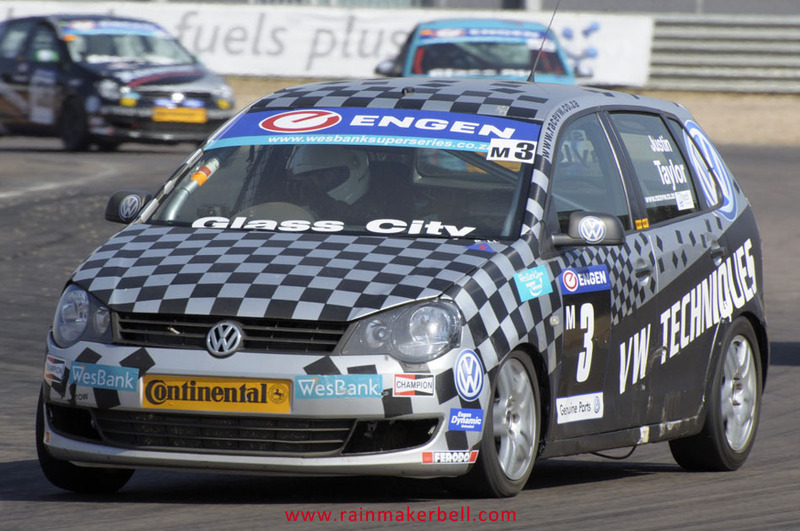 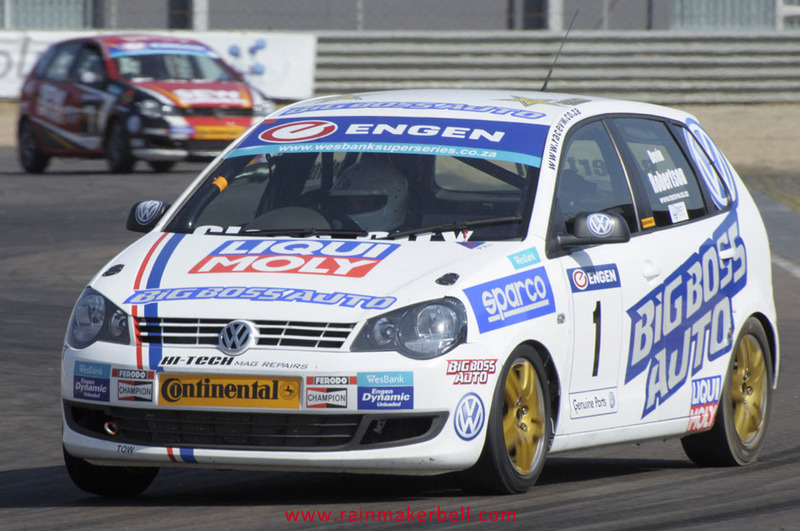 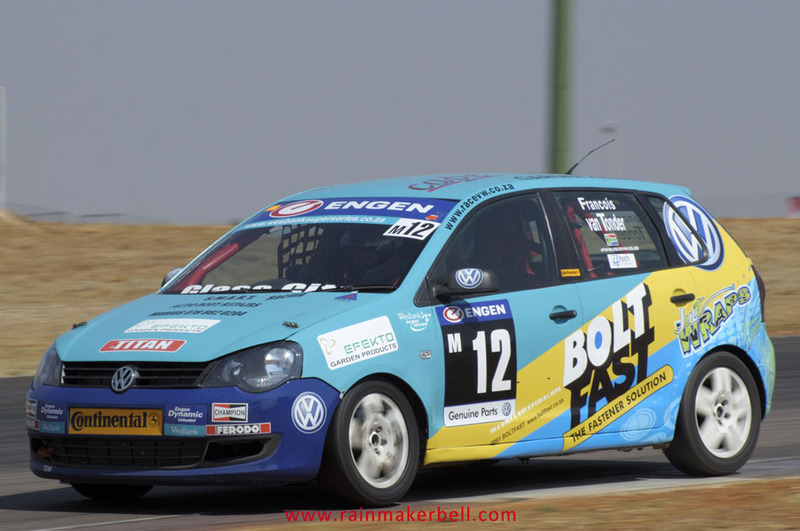 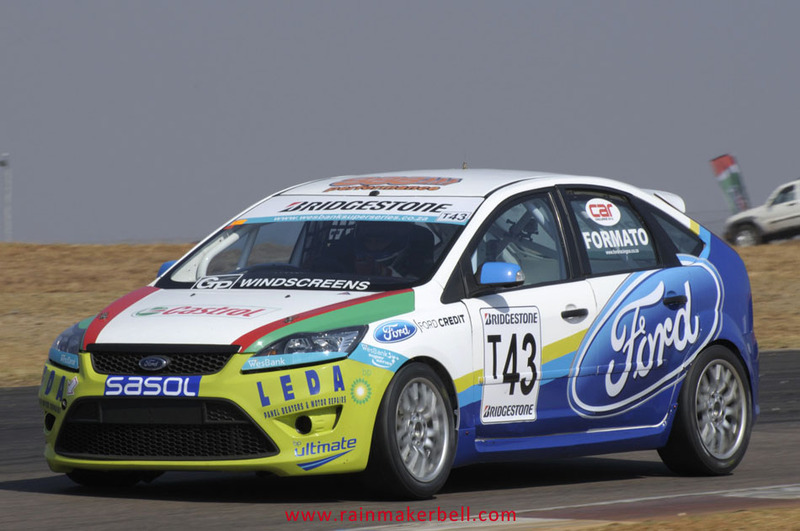 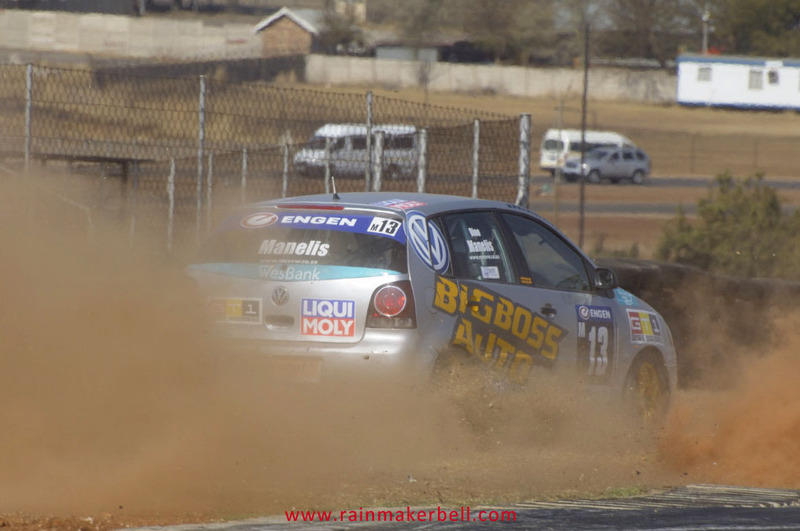 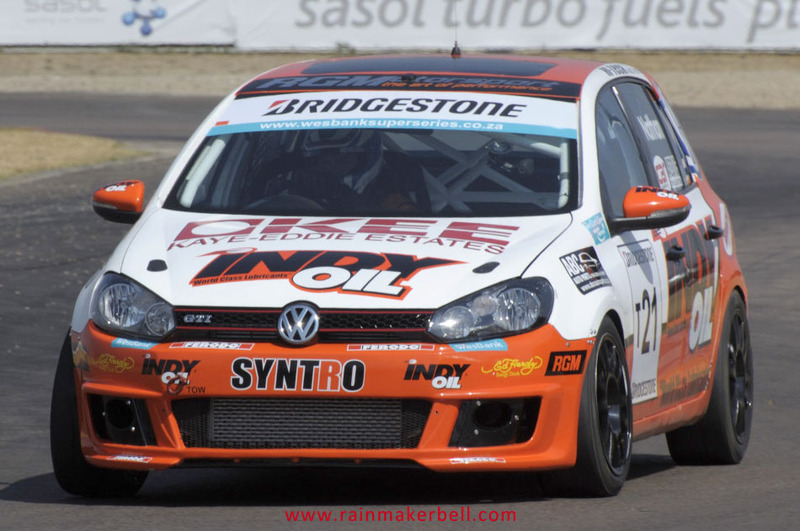 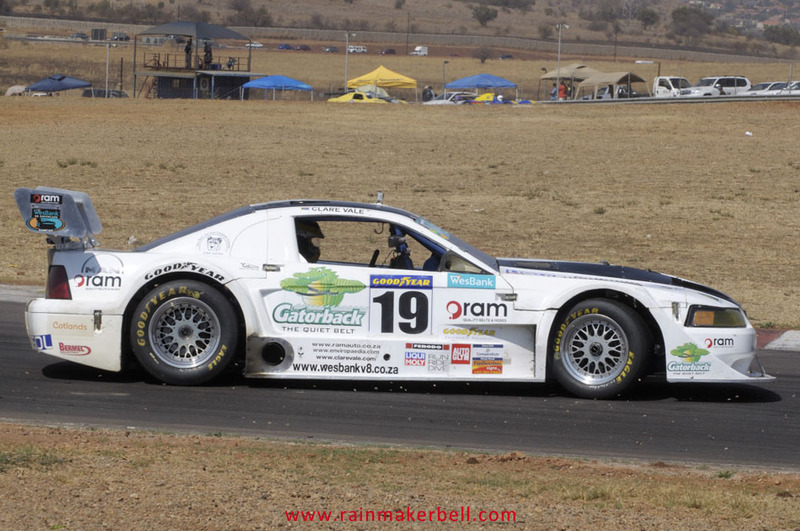 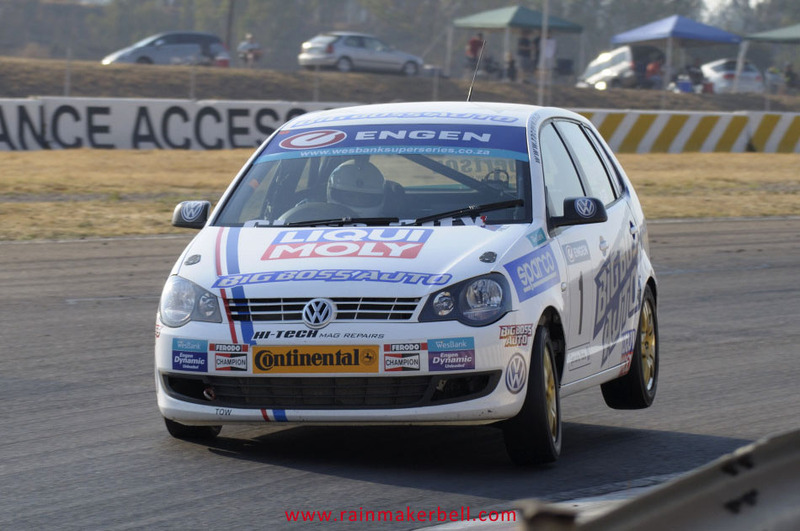 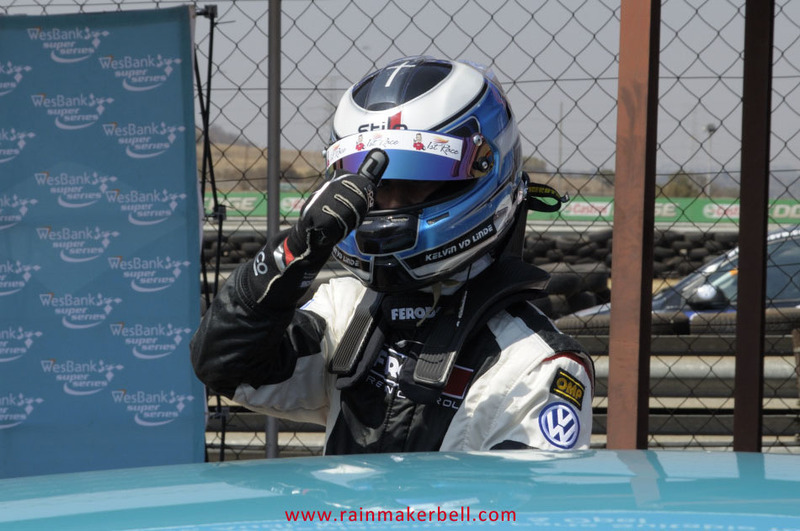 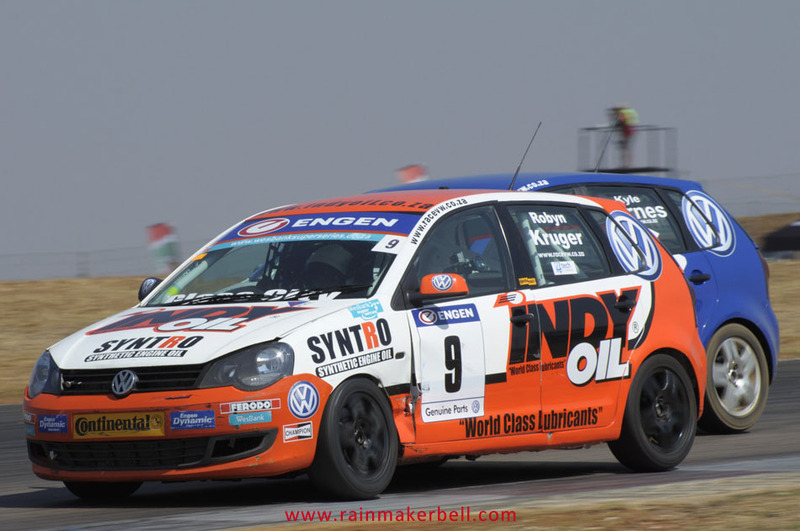 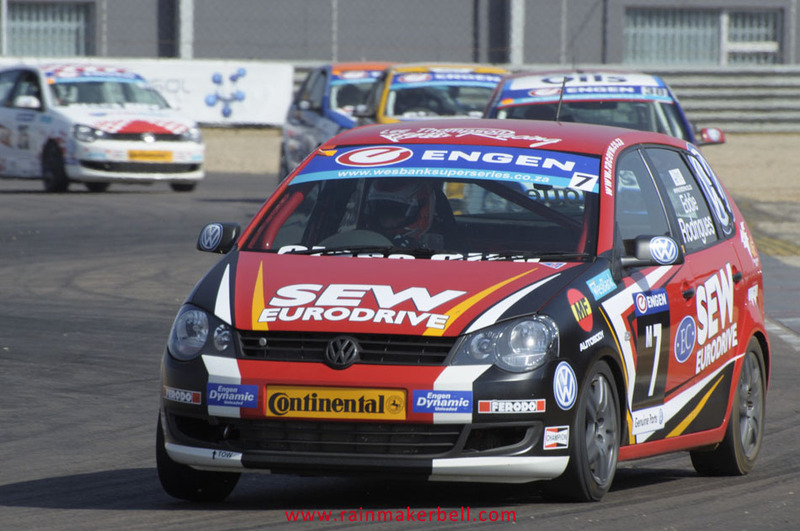 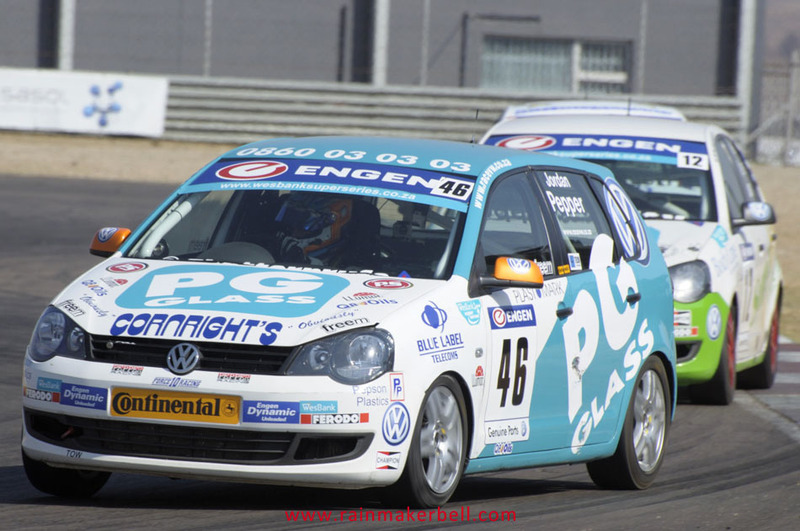 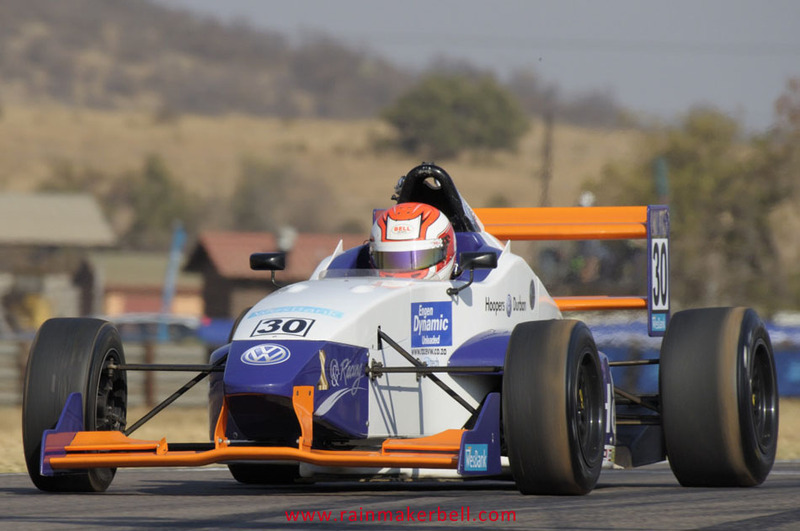 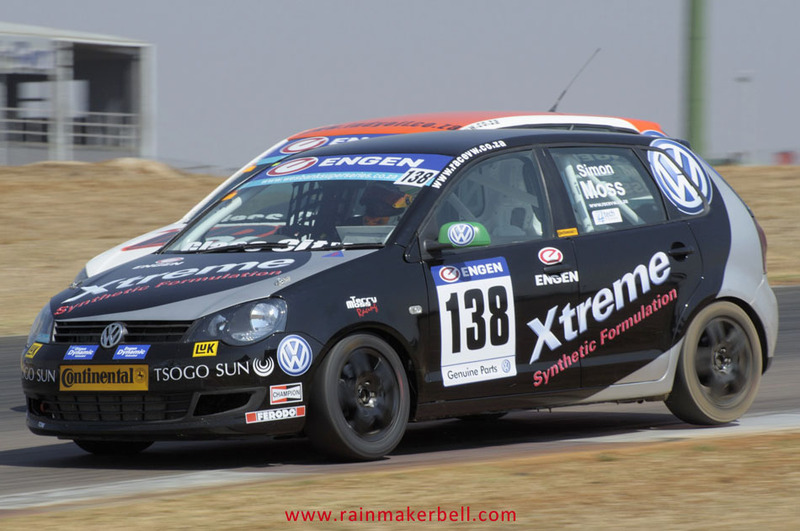 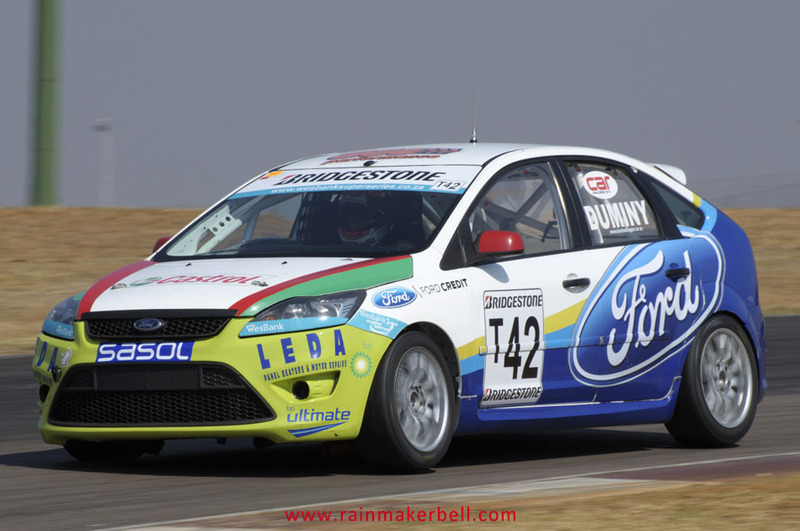 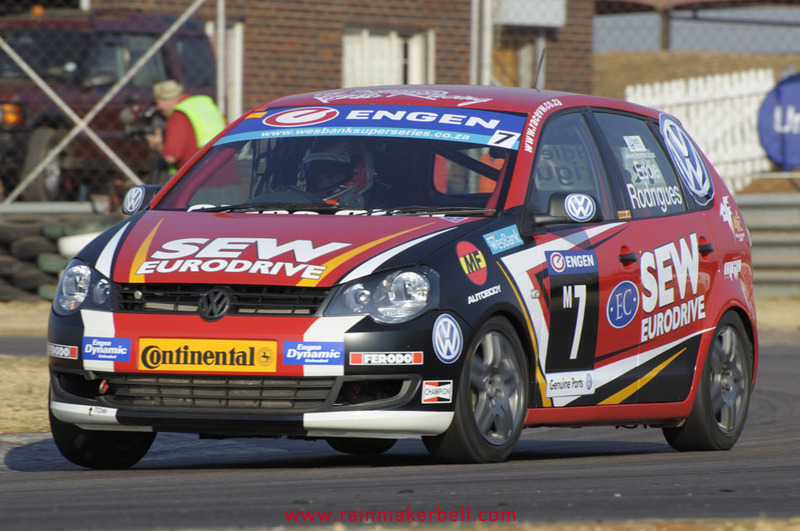 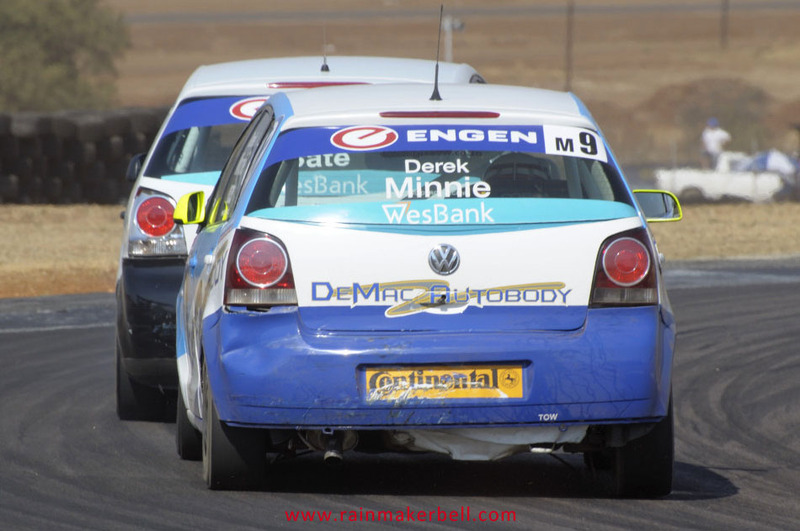 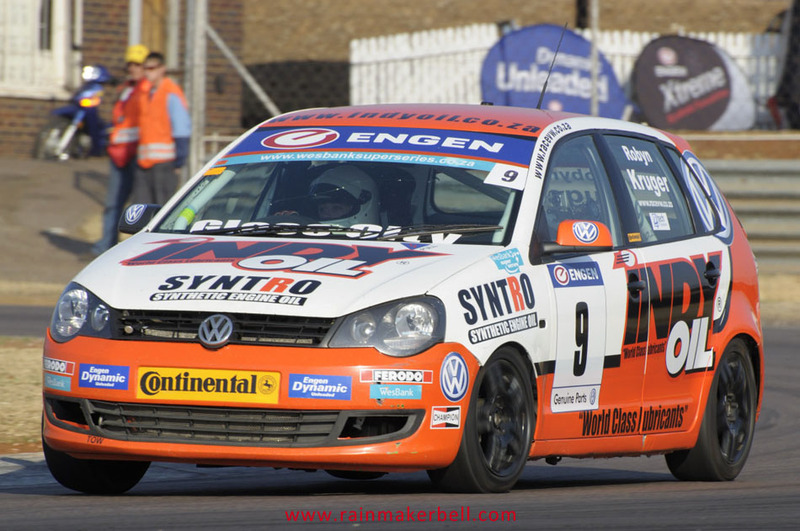 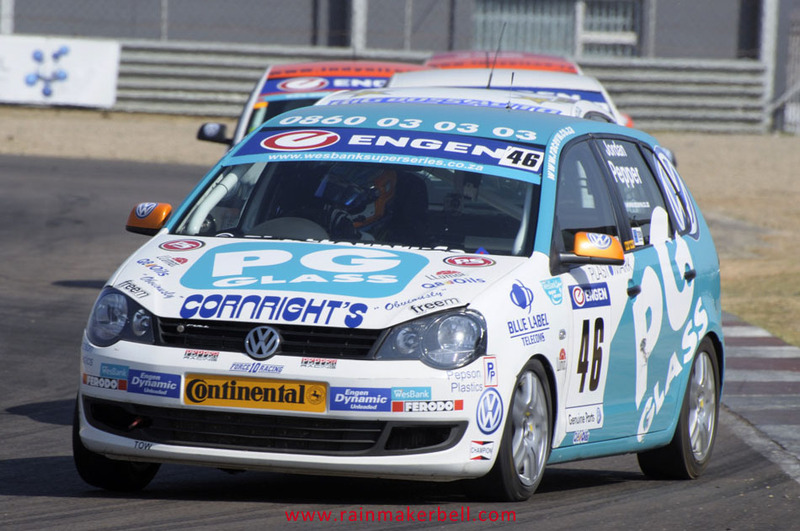 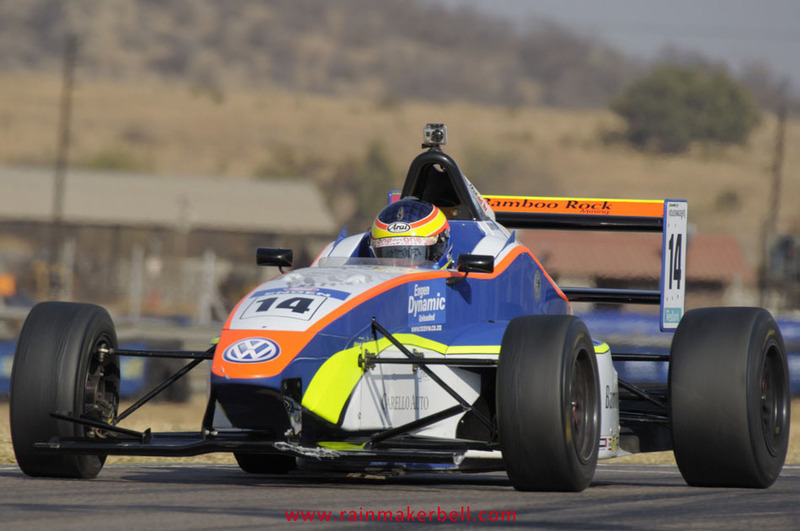 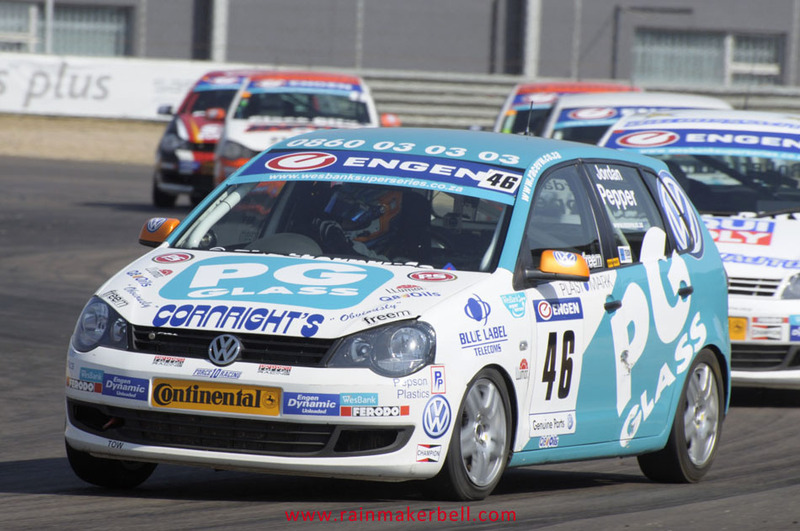 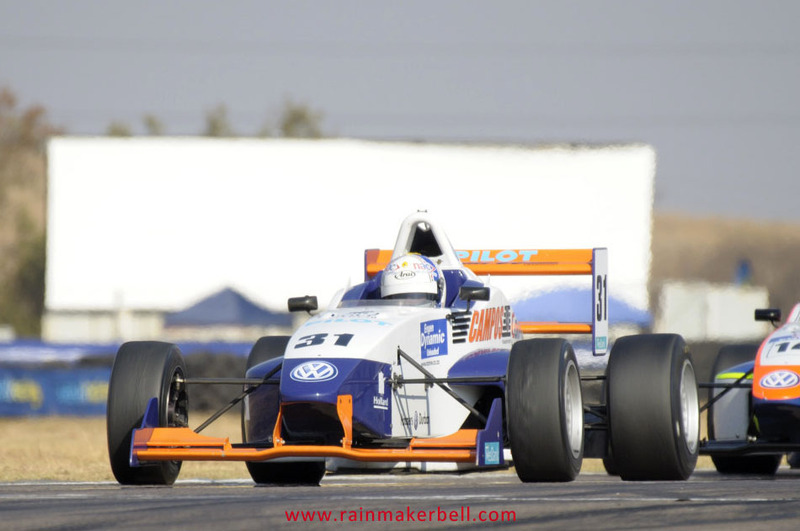 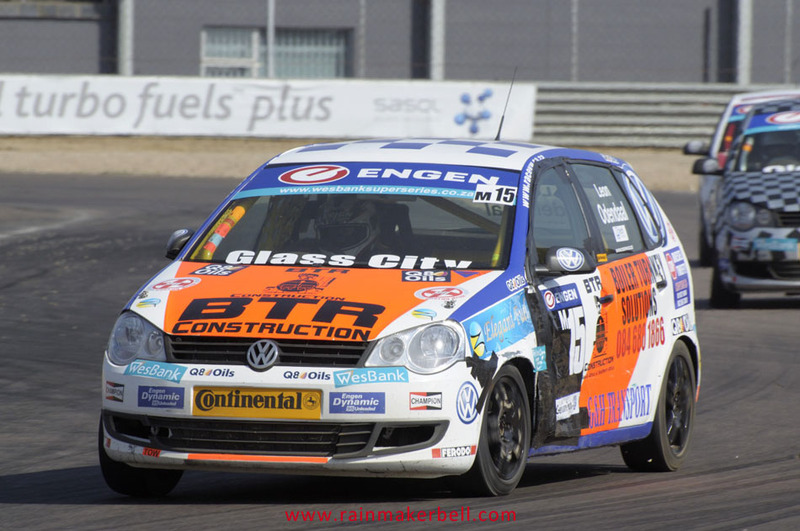 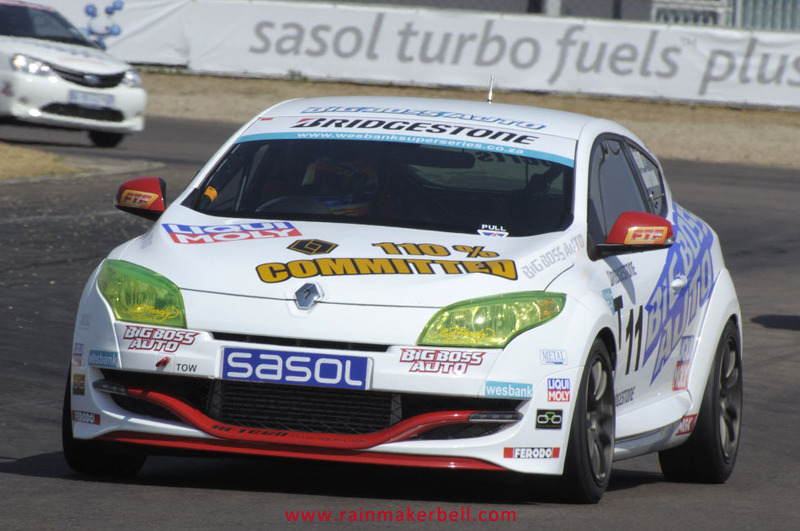 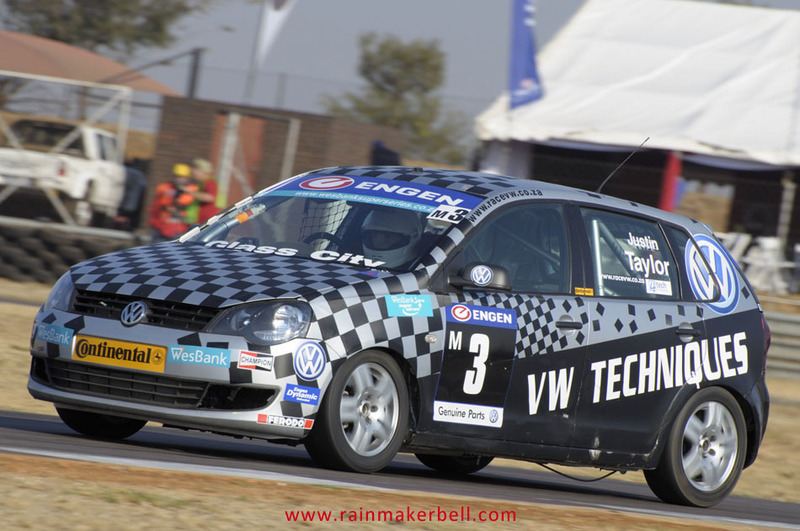 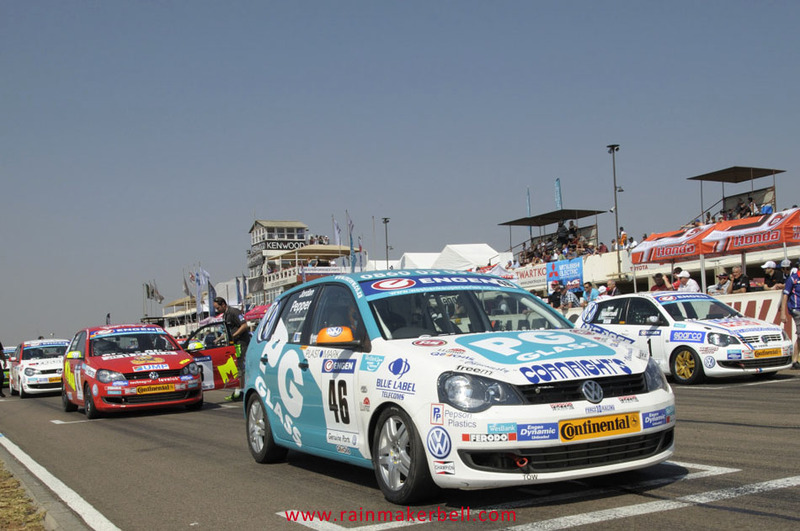 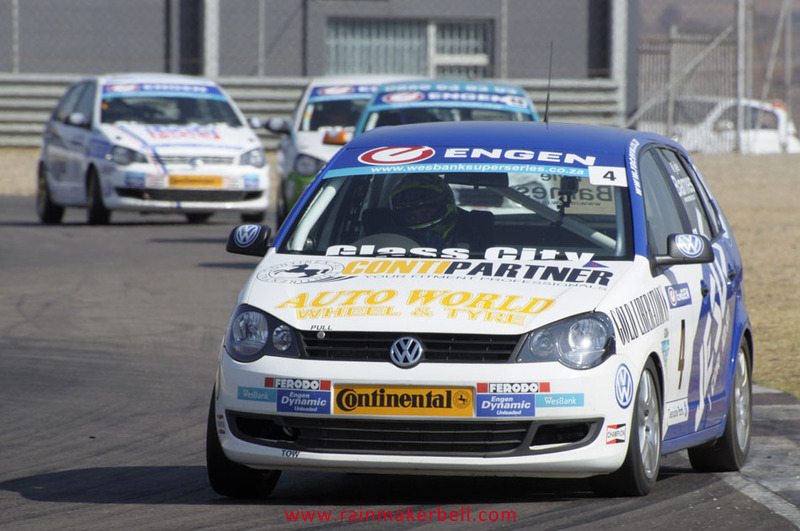 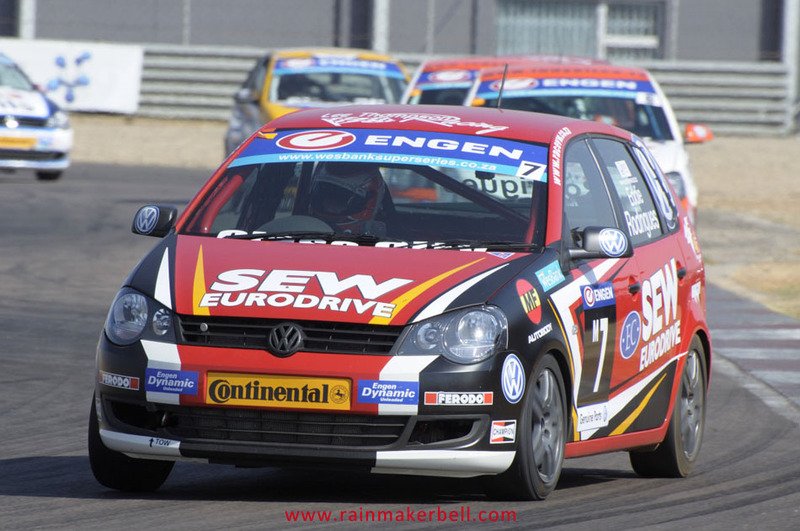 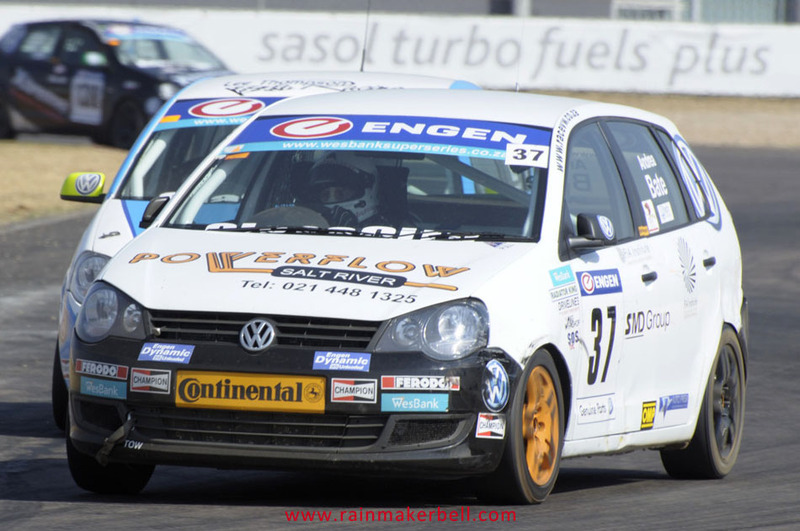 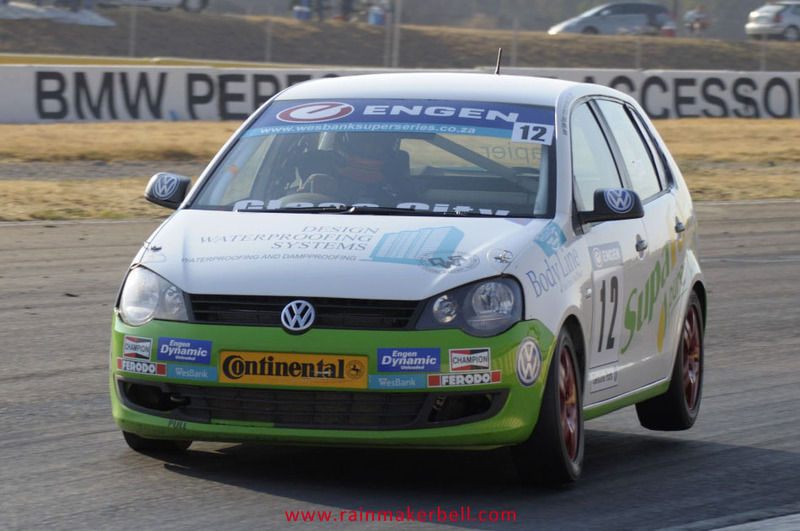 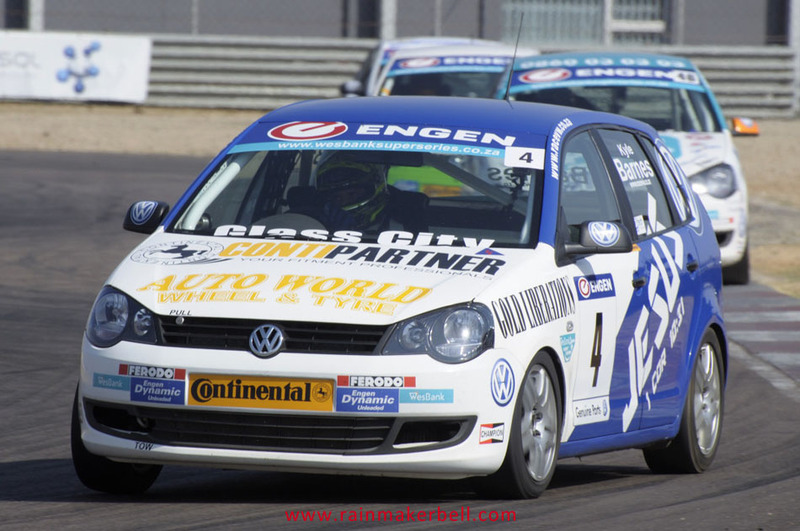 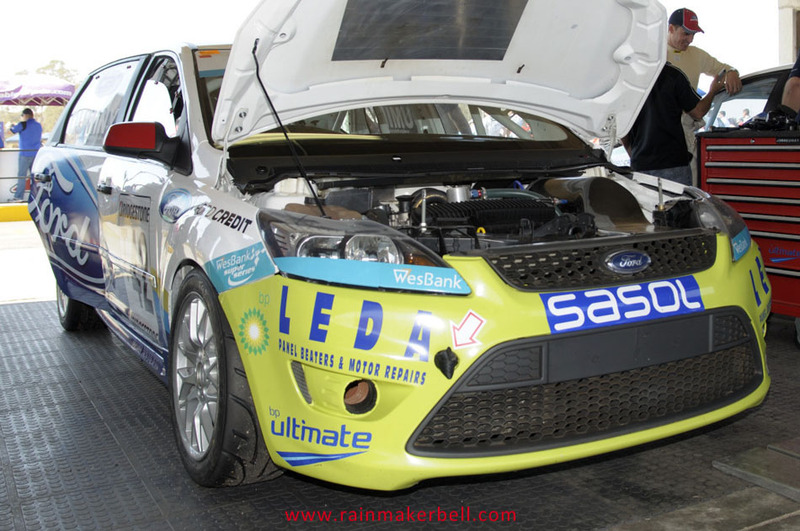 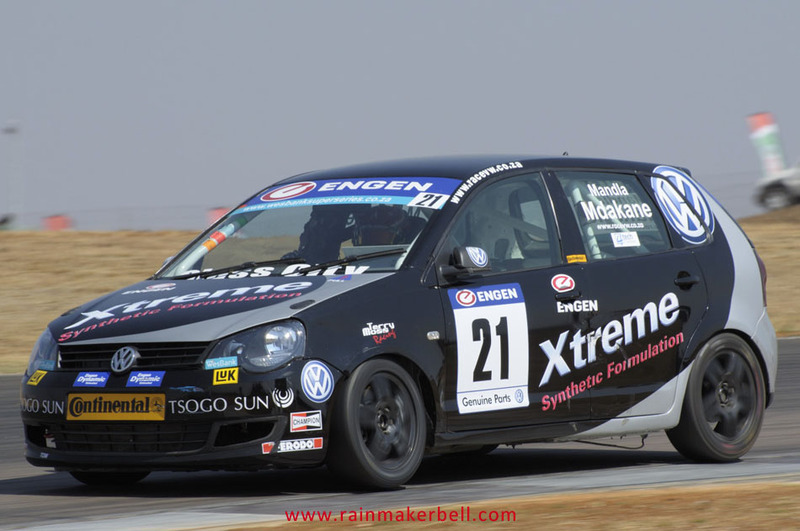 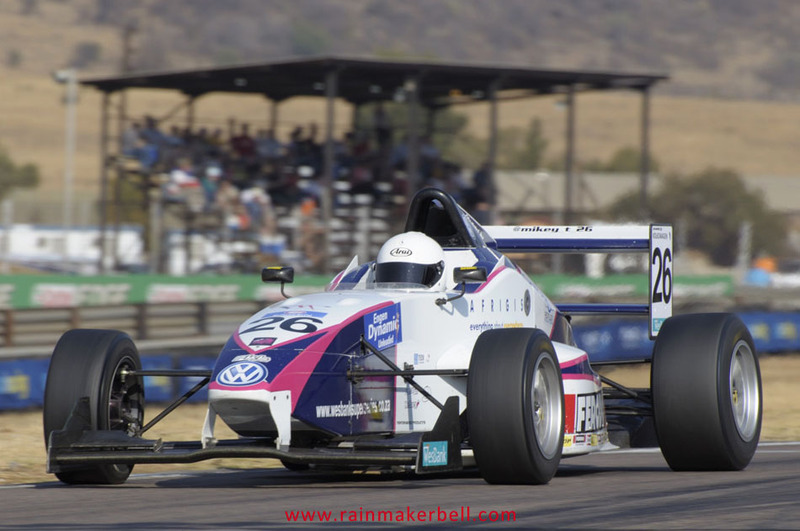 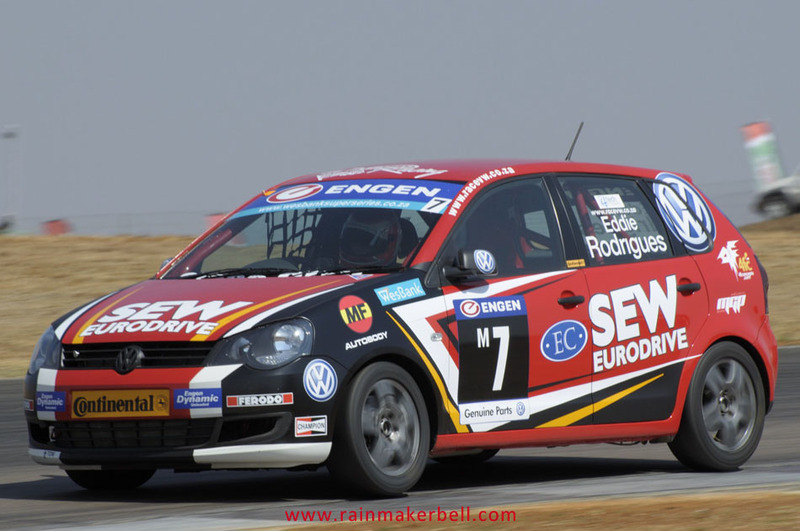 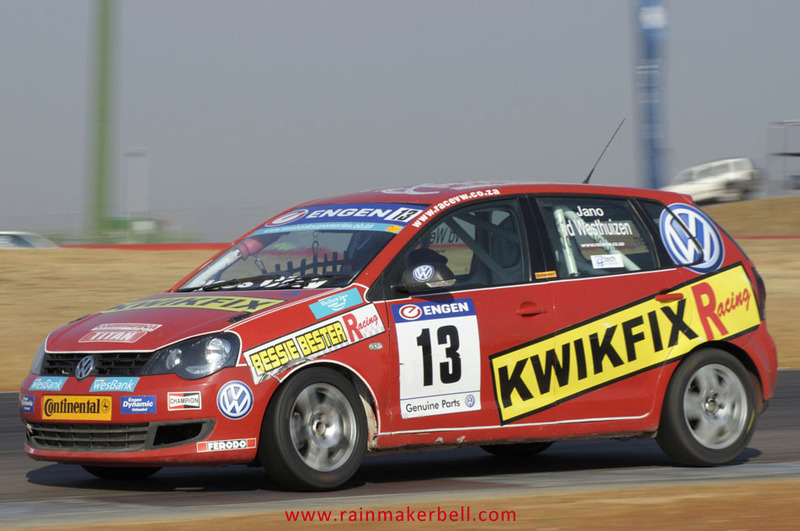 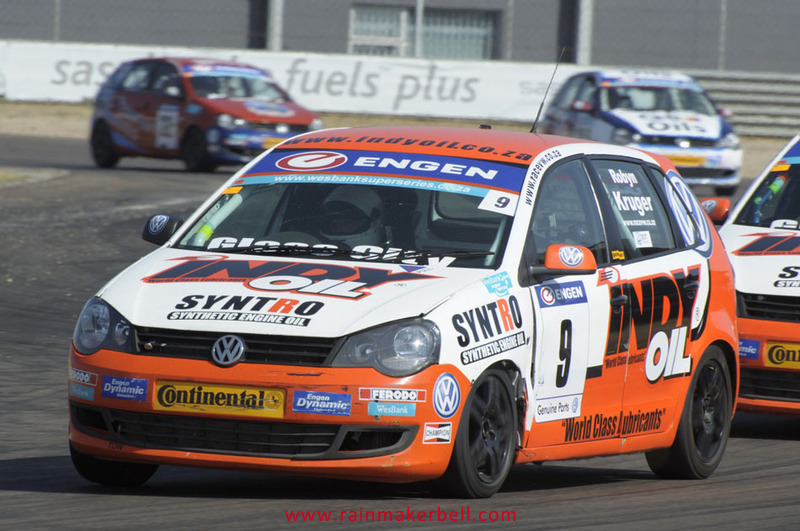 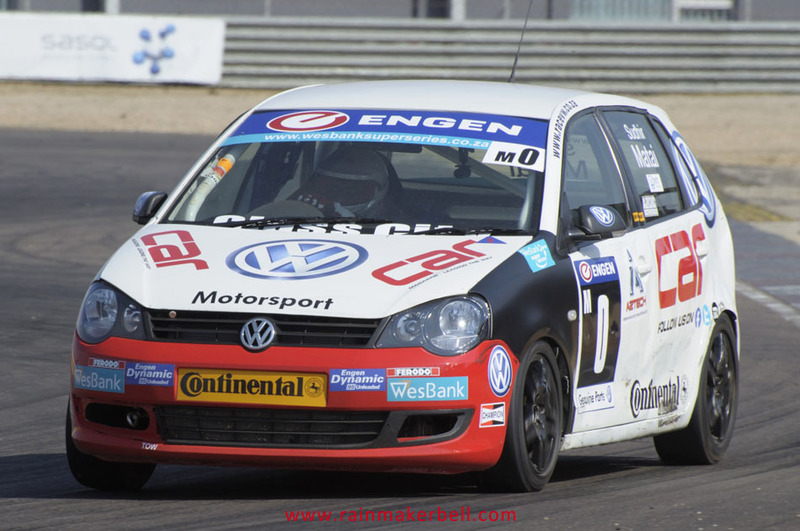 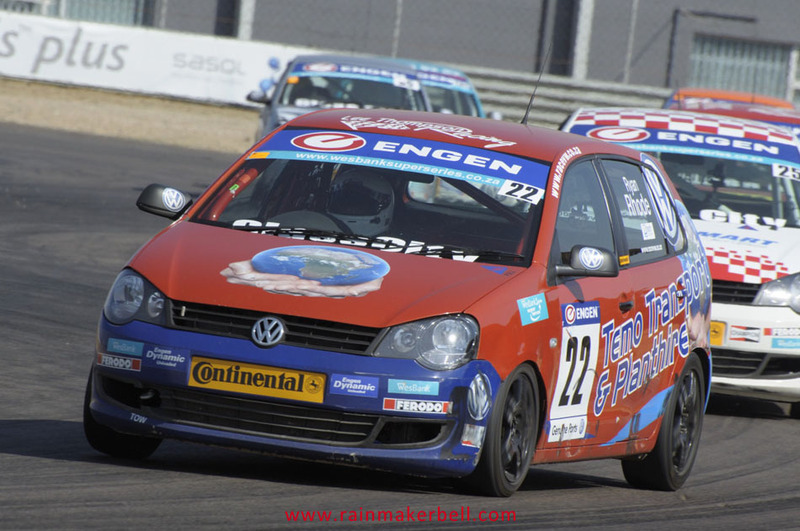 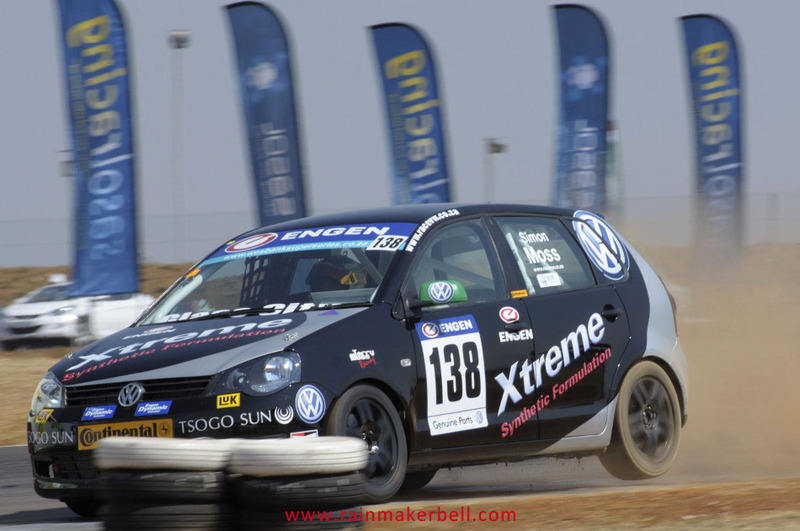 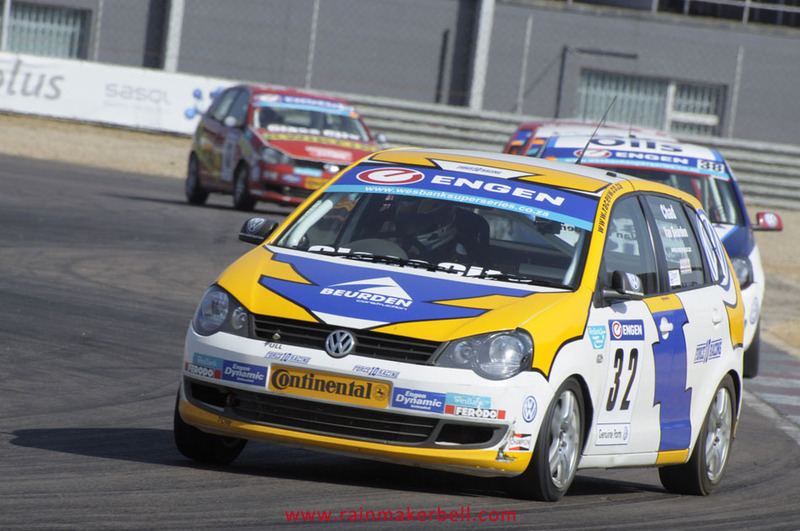 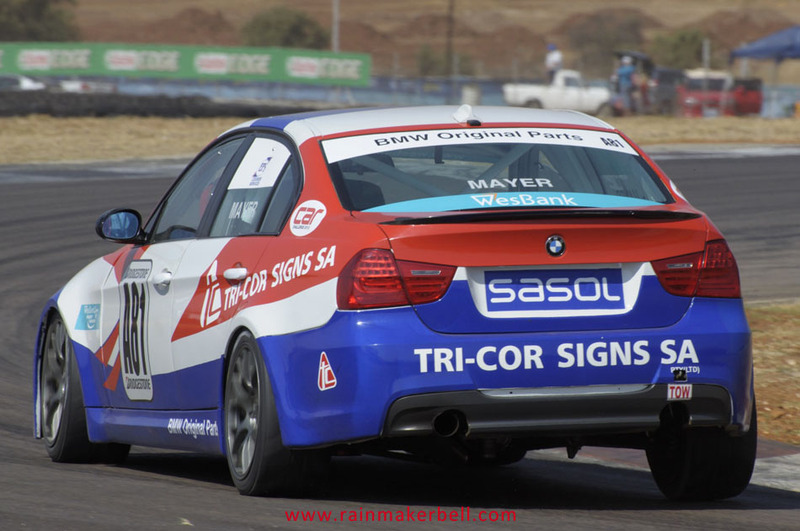 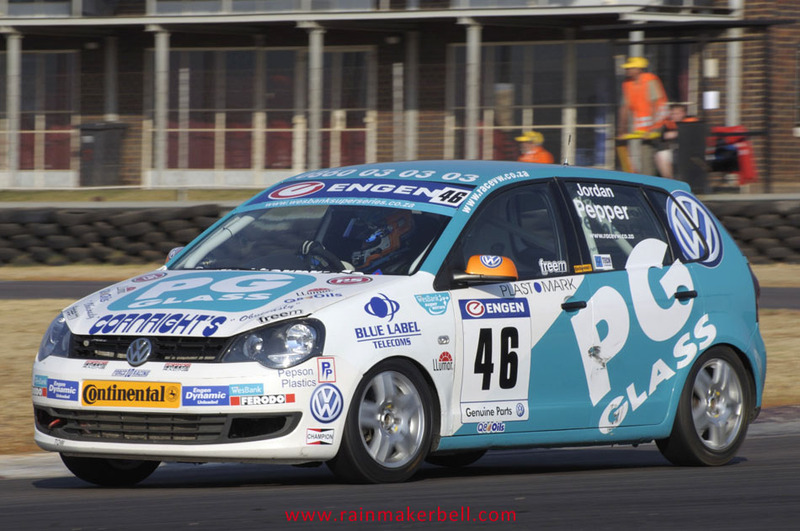 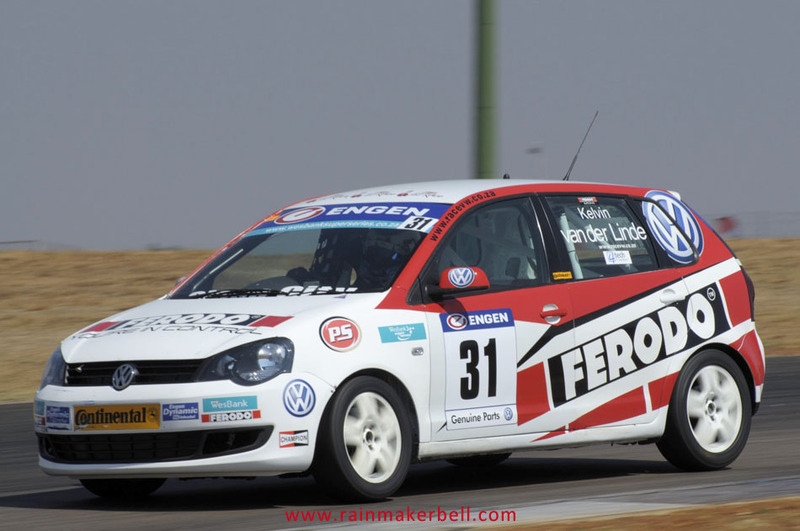 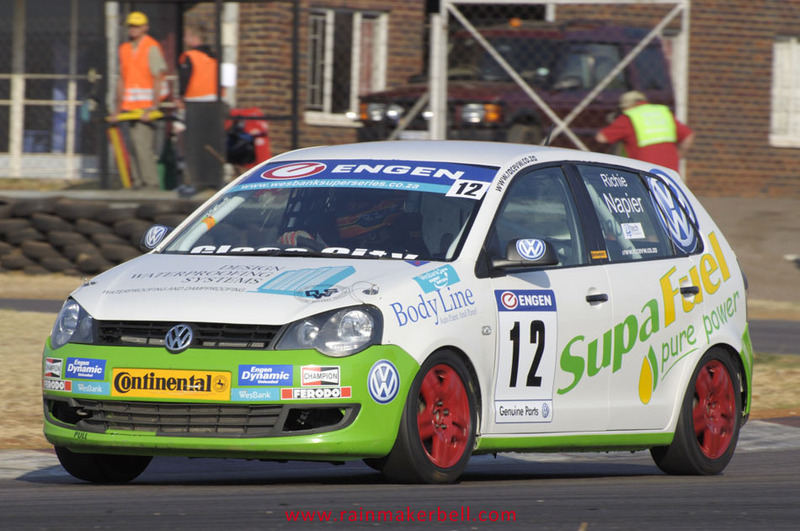 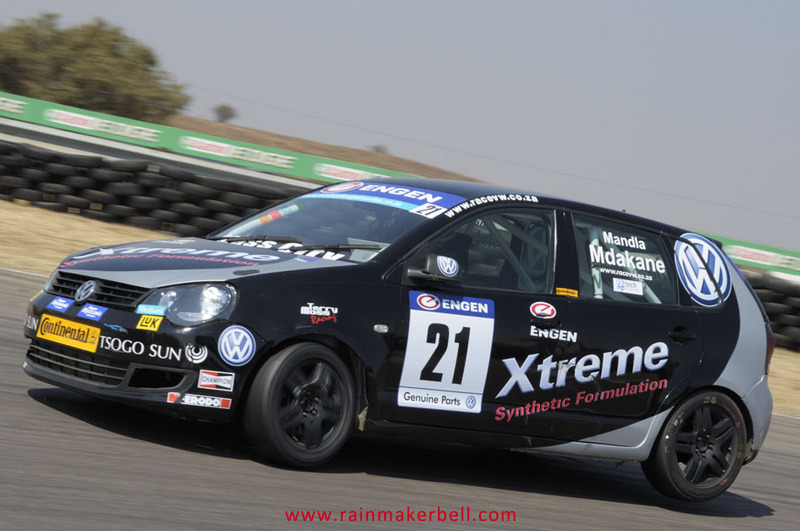 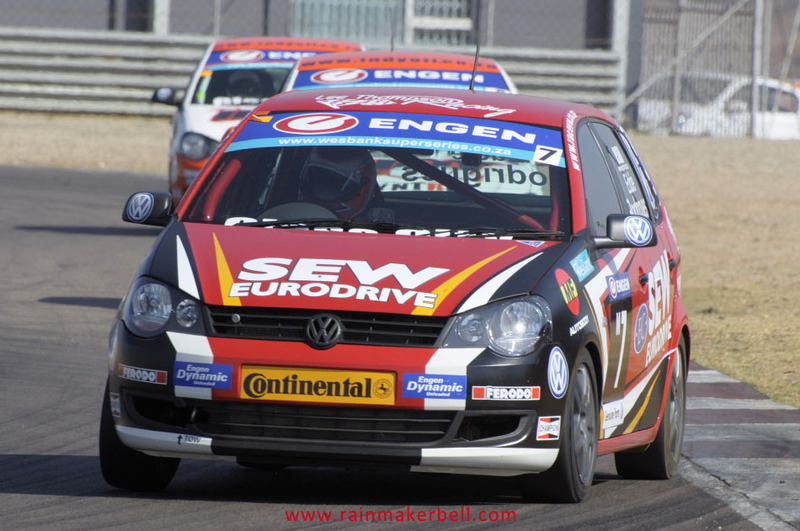 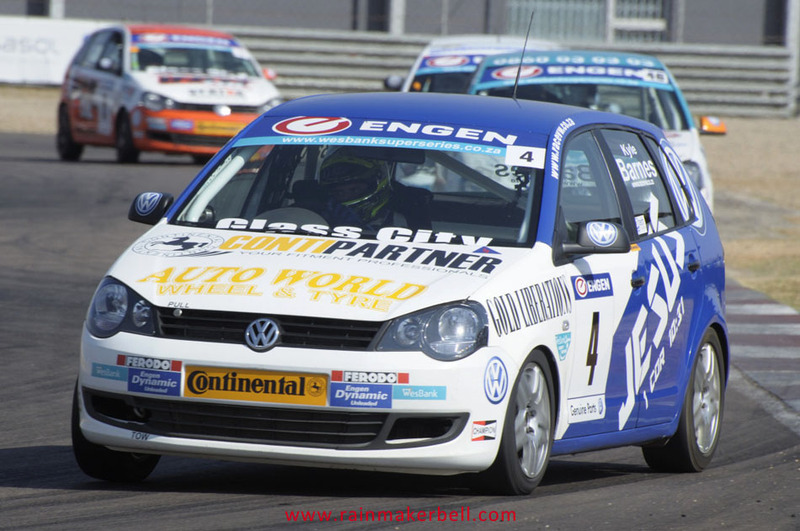 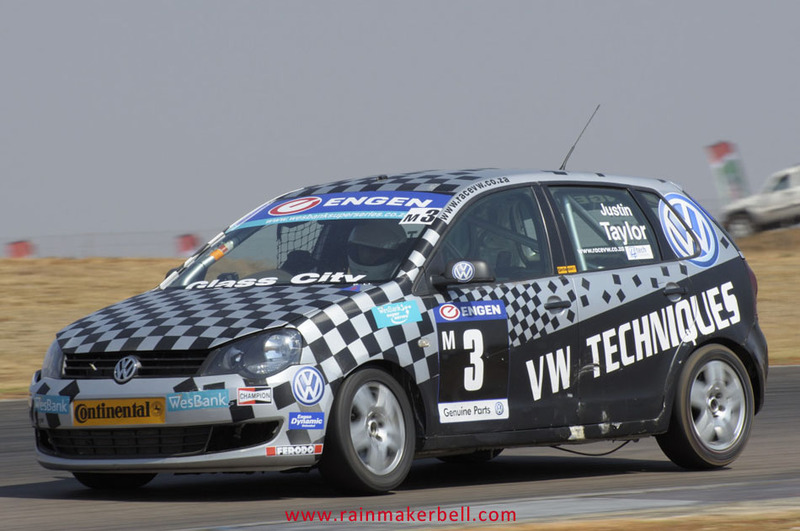 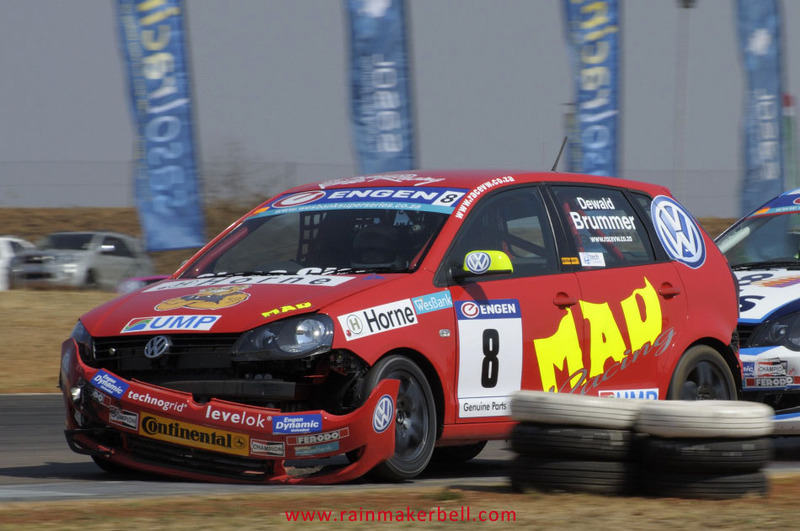 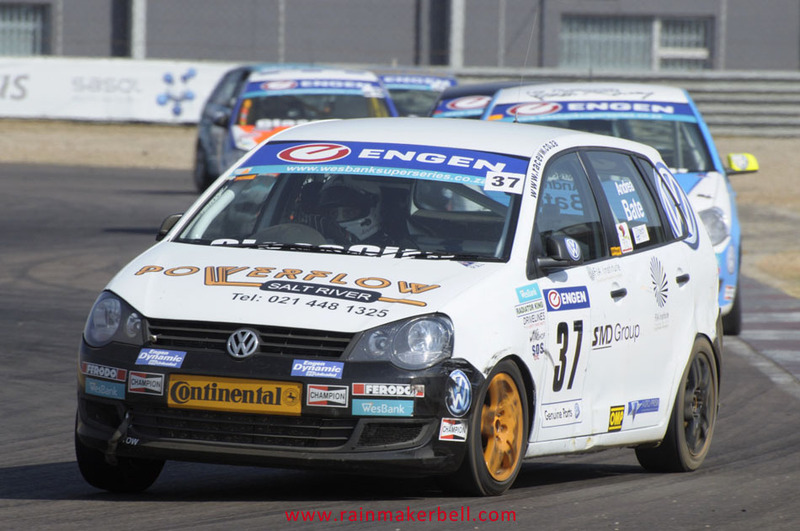 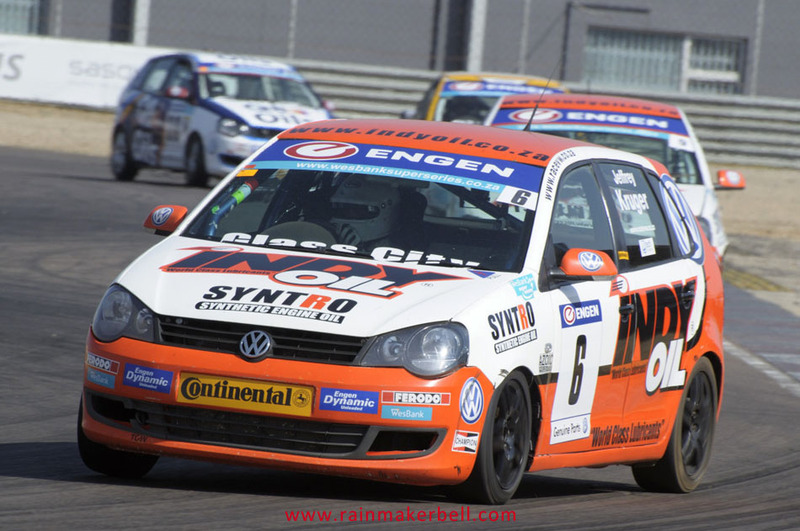 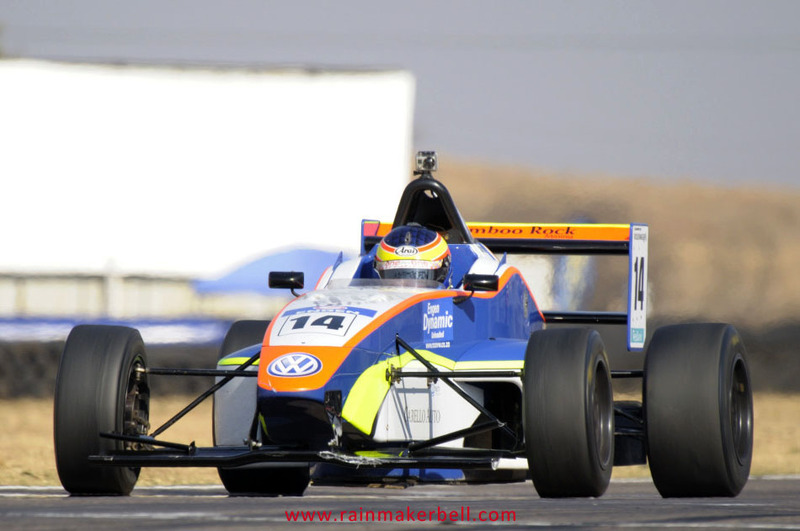 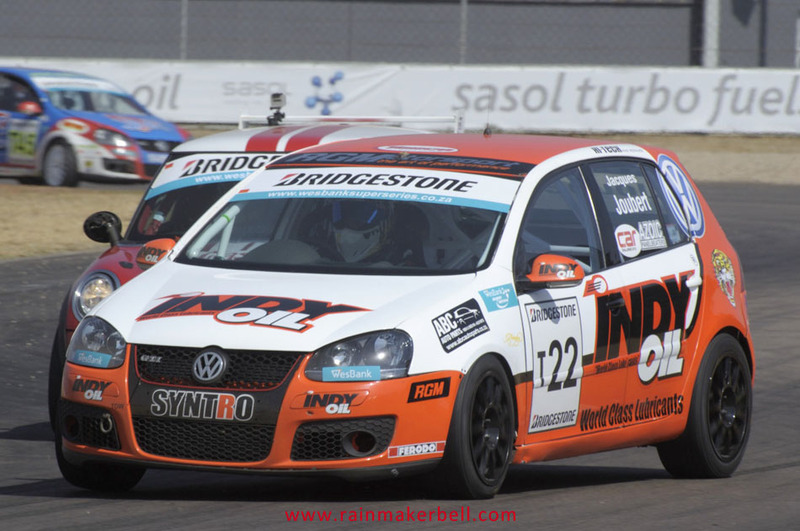 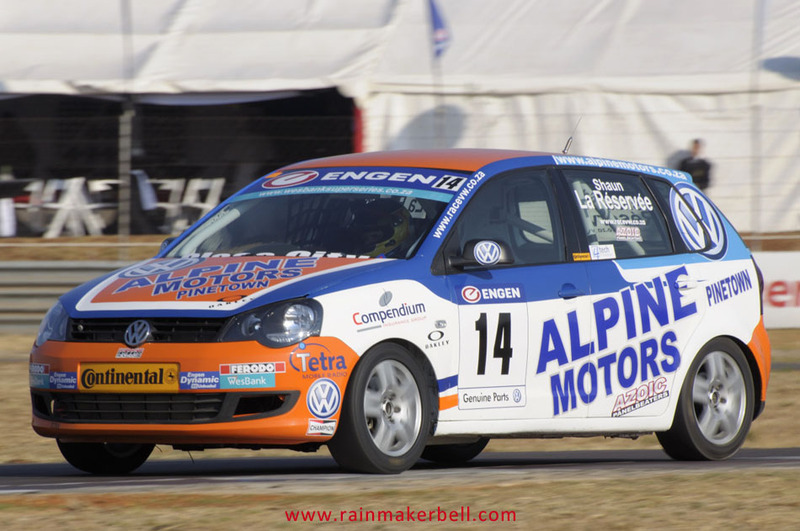 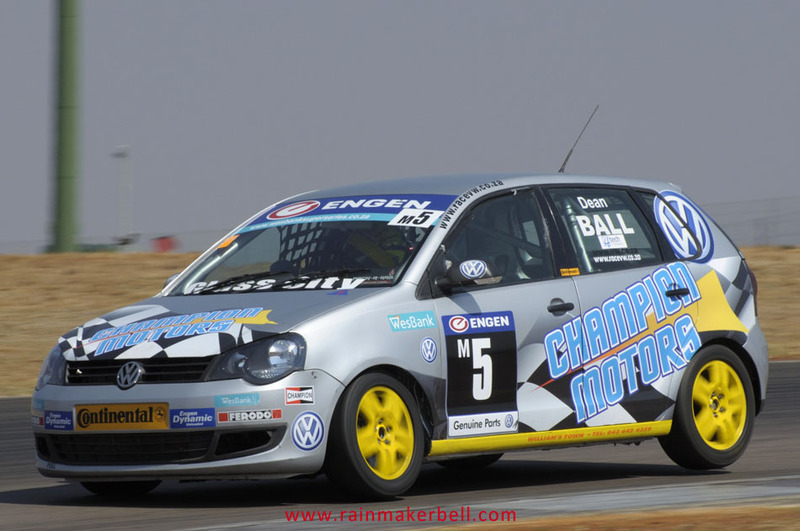 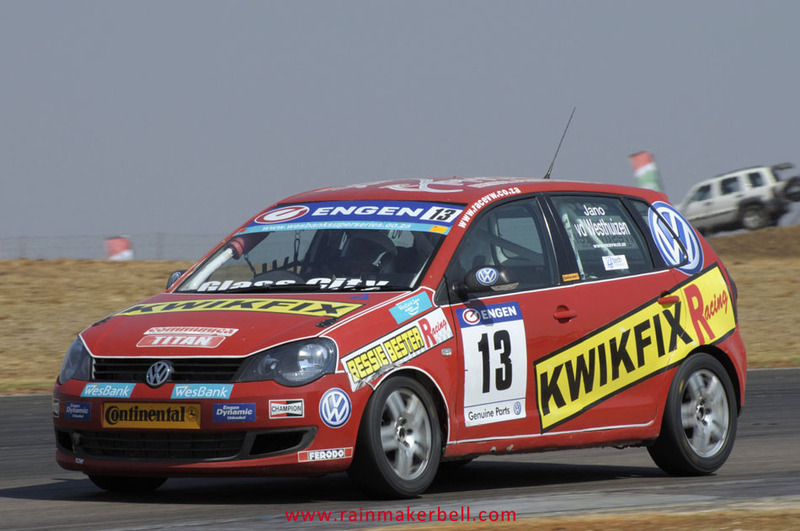 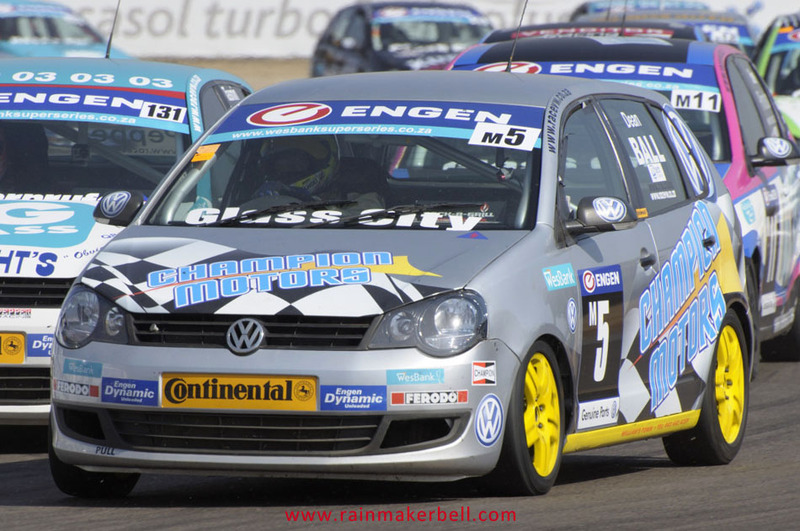 Michael Stephen ended the day in first place overall, with Anthony Taylor second and Hennie Groenewald a disappointing seventh. 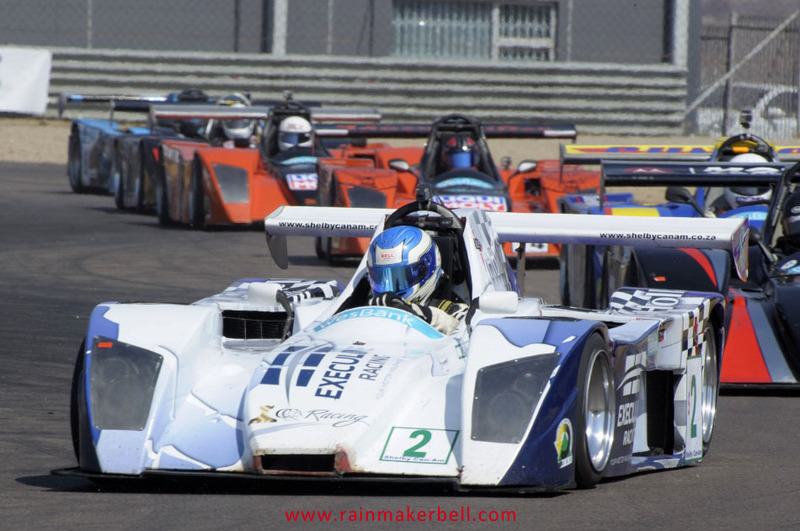 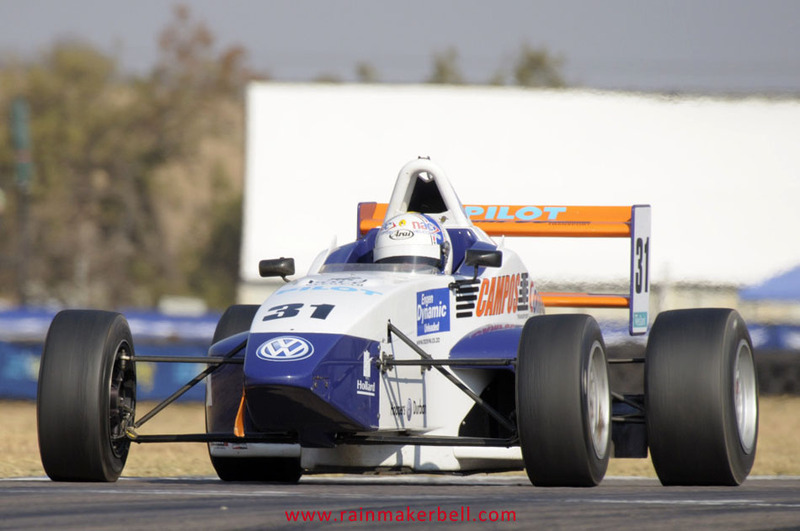 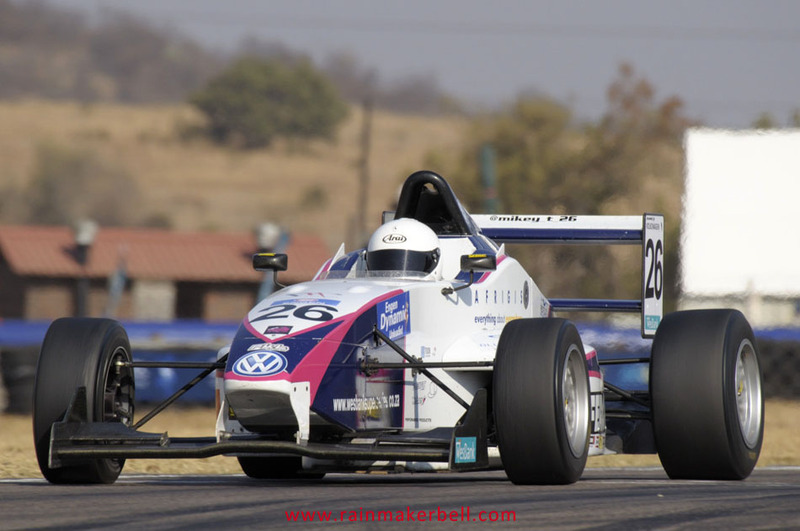 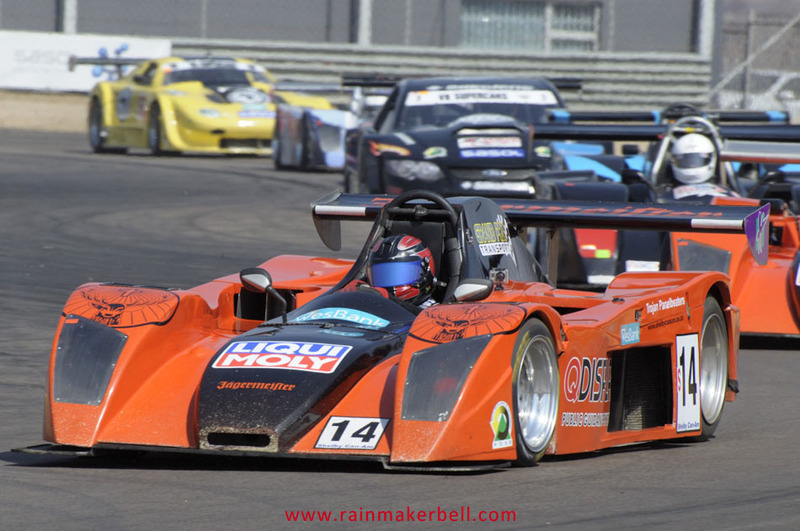 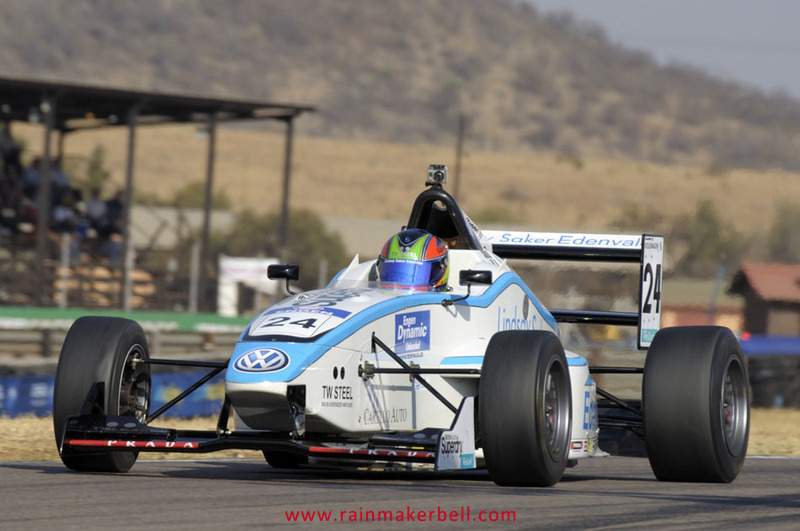 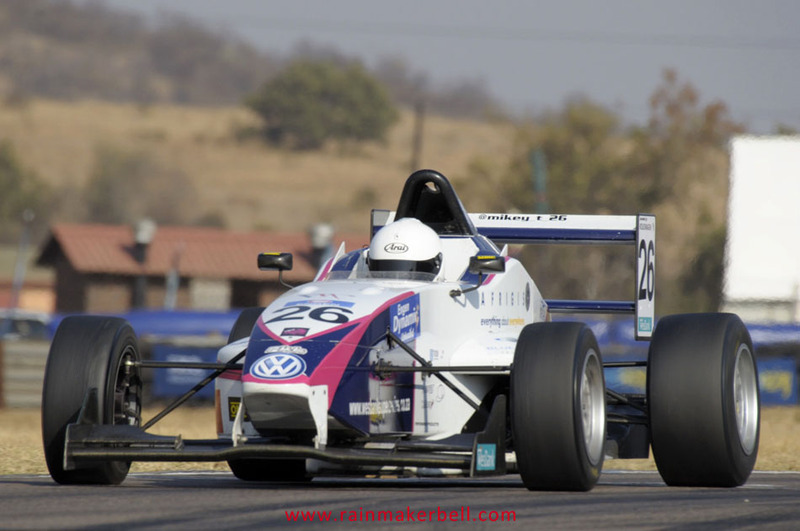 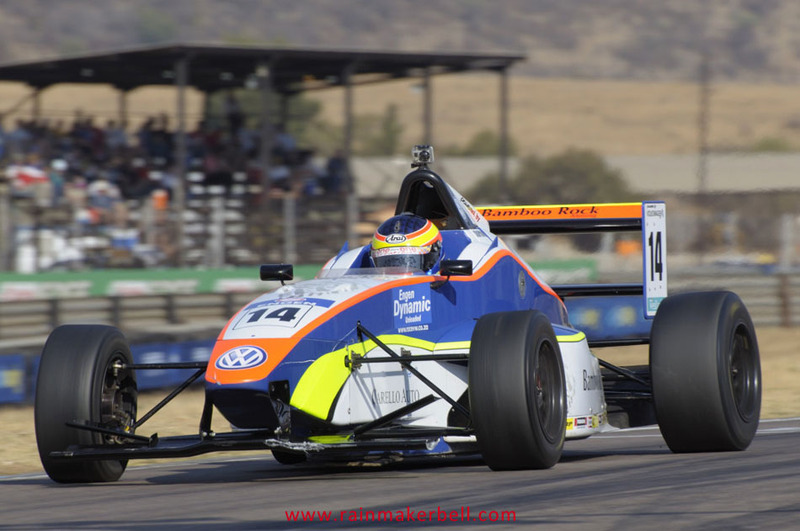 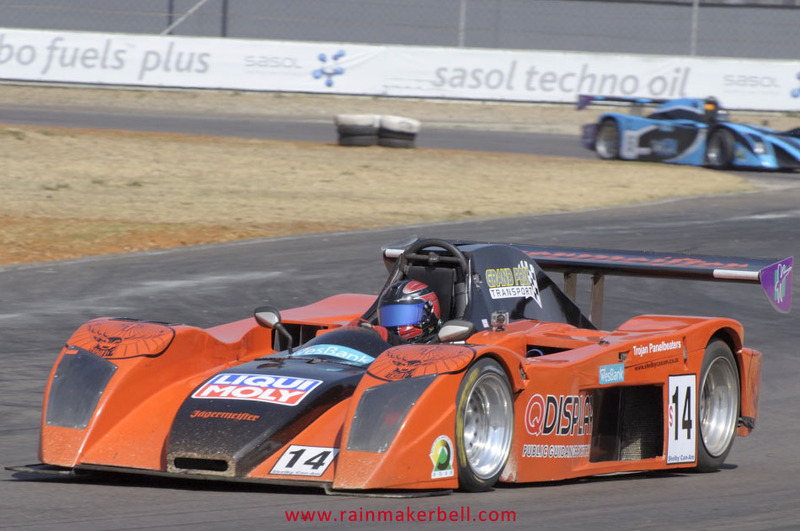 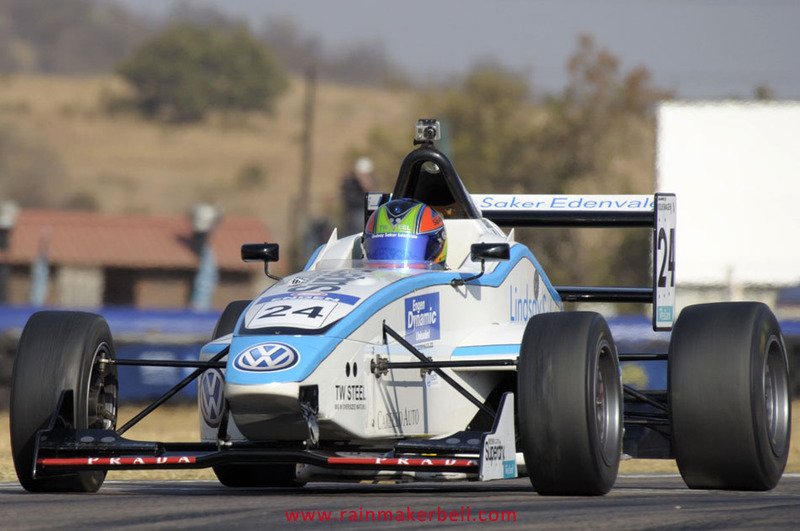 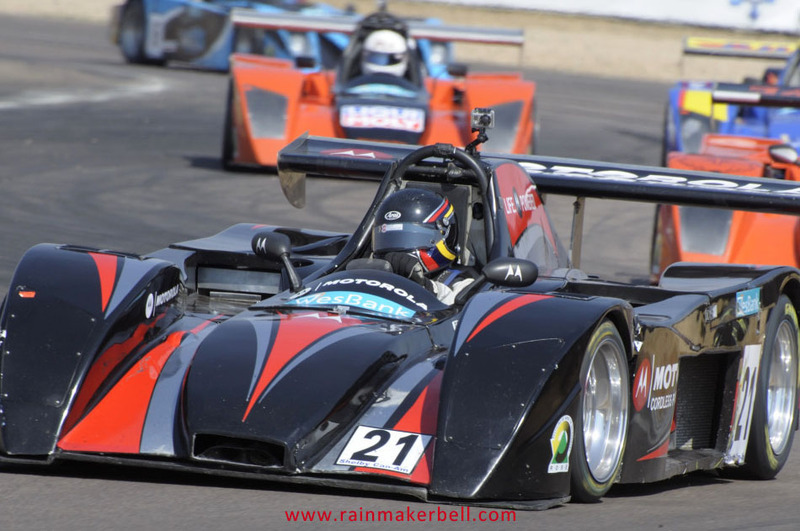 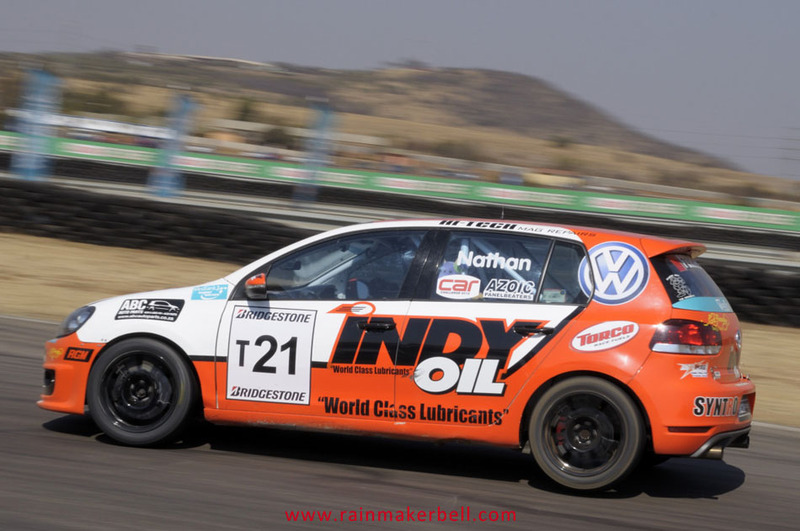 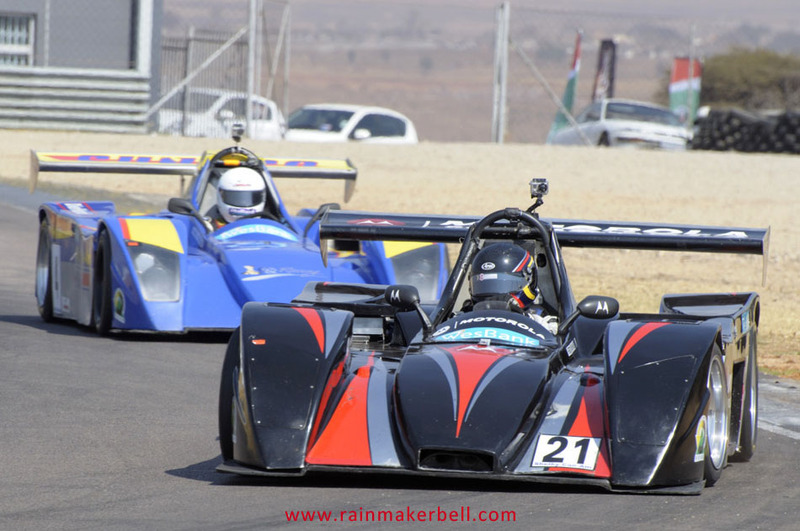 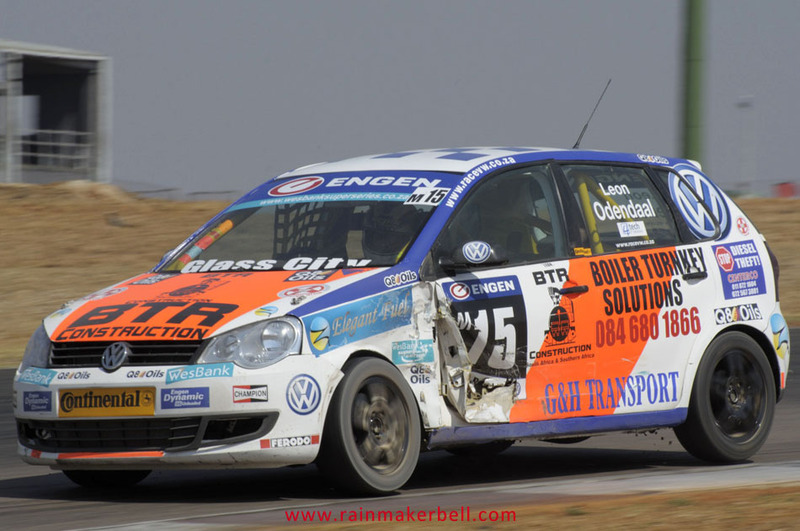 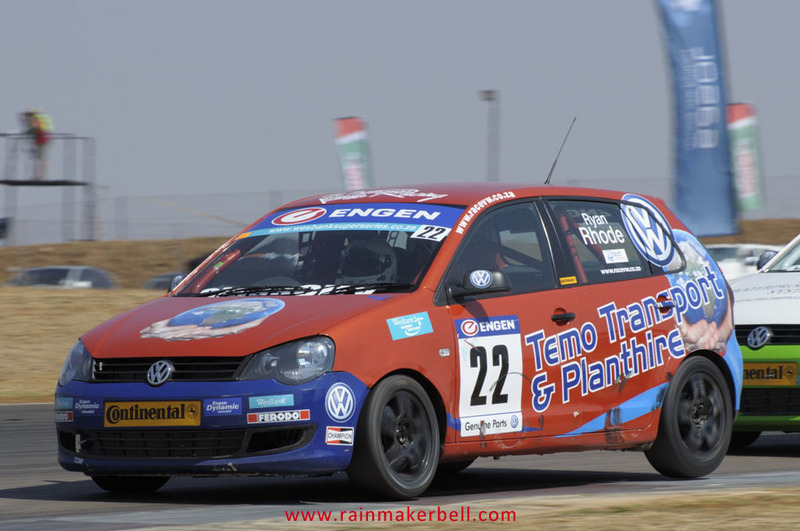 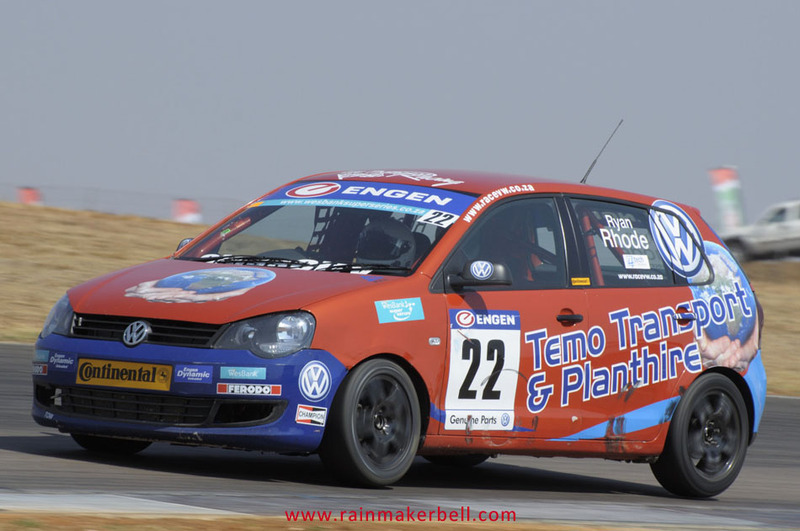 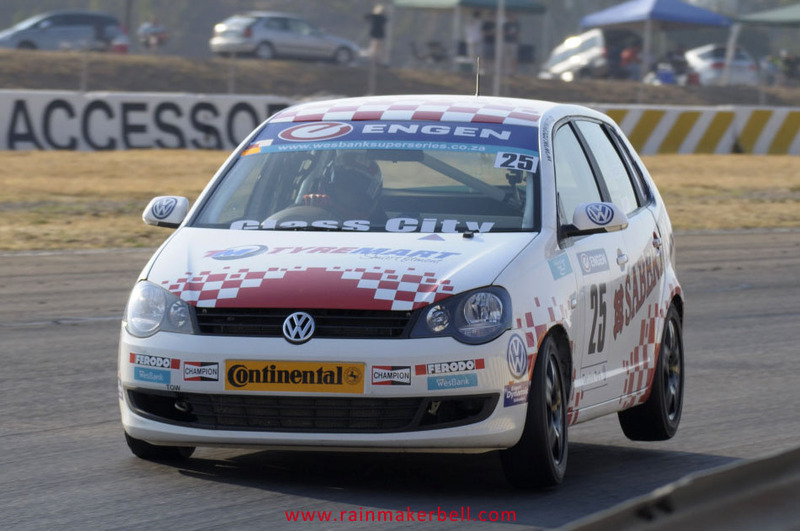 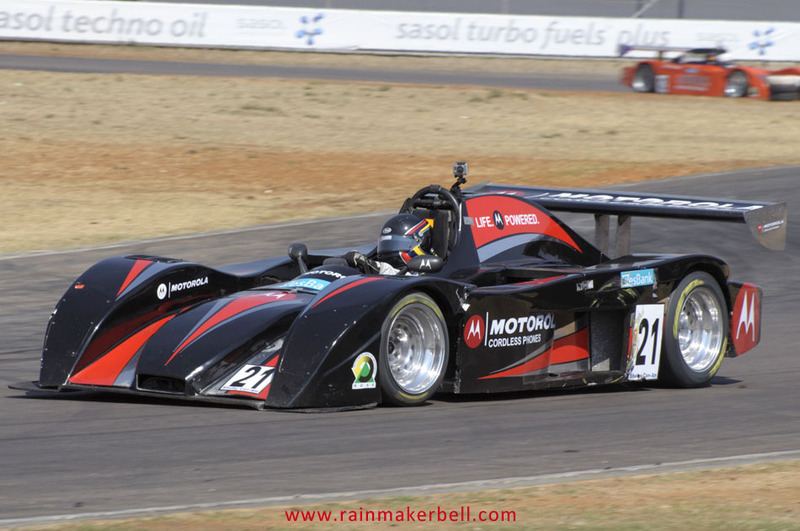 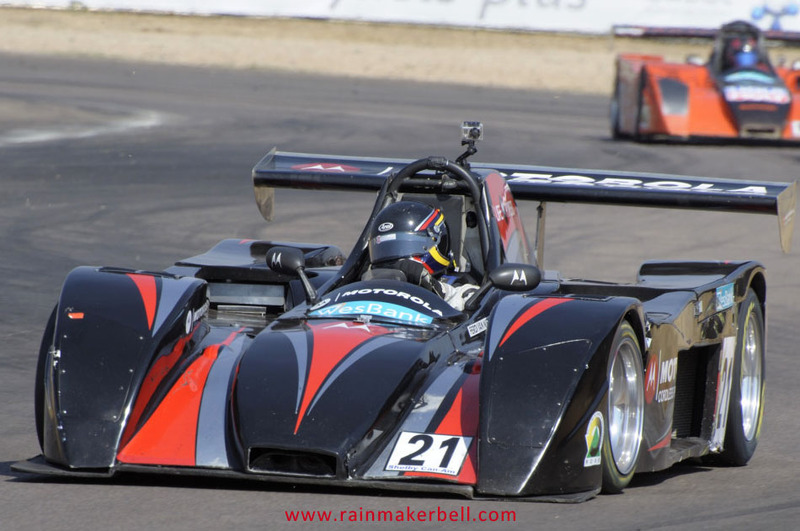 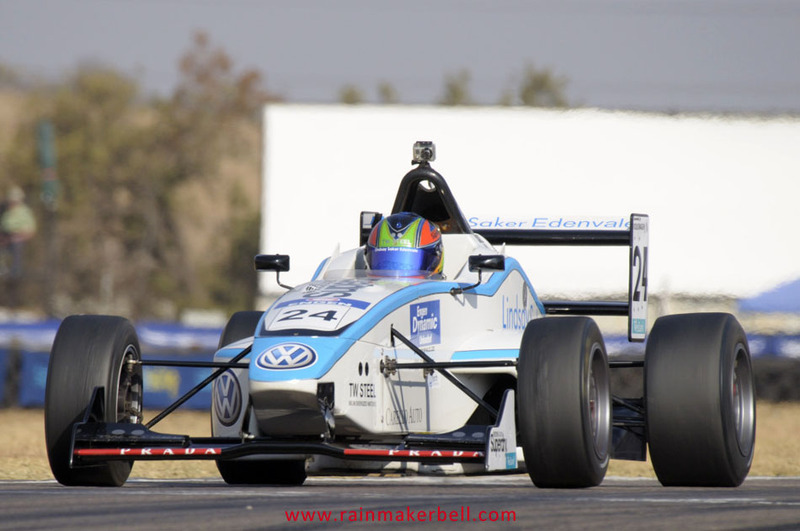 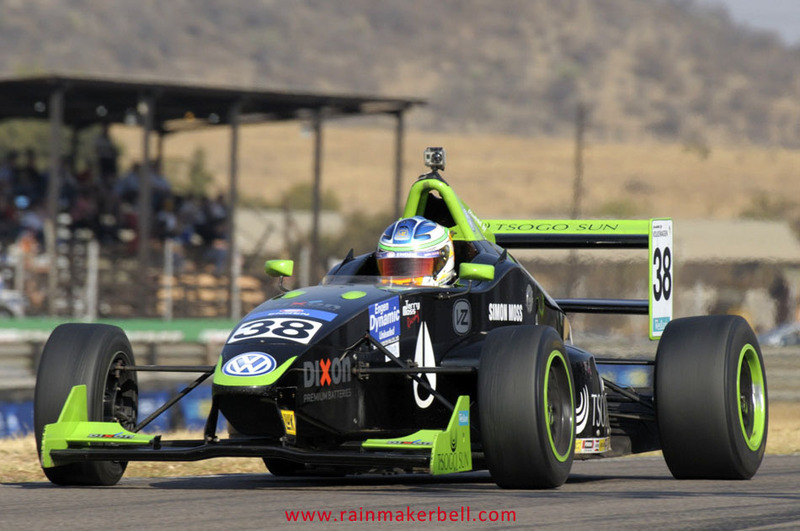 Class T was dominated by Graham Nathan #T21 with Lee Thompson and Gavin Cronje ending the day in sixth an seventh place respectively.